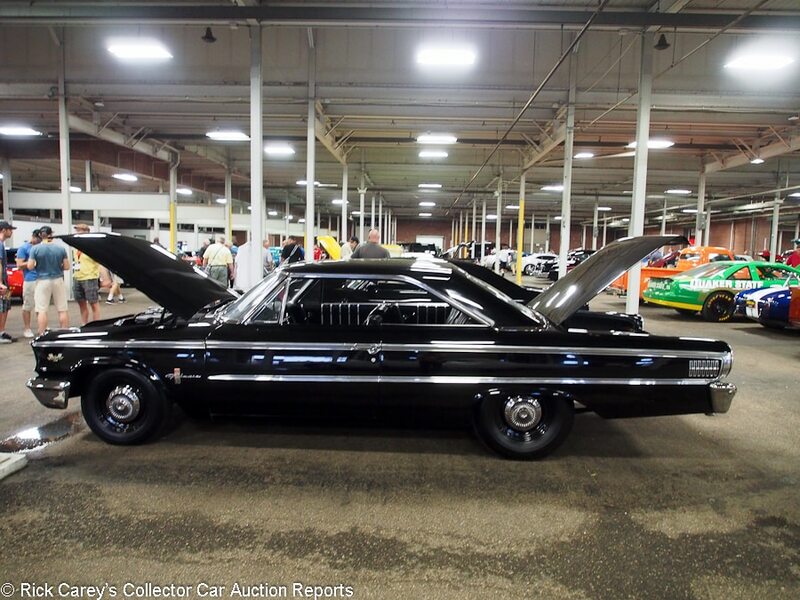 Traditionally Mecum Auctions’ headline auction, the Spring Classic has been overtaken by the commercial paroxysm of Kissimmee in January. The Spring Classic this year offered 1,650 cars, well below the 2,663 at Kissimmee (both adjusted for reruns) and with a total of $54 million changing hands, well below Kissimmee’s $84.9 million. 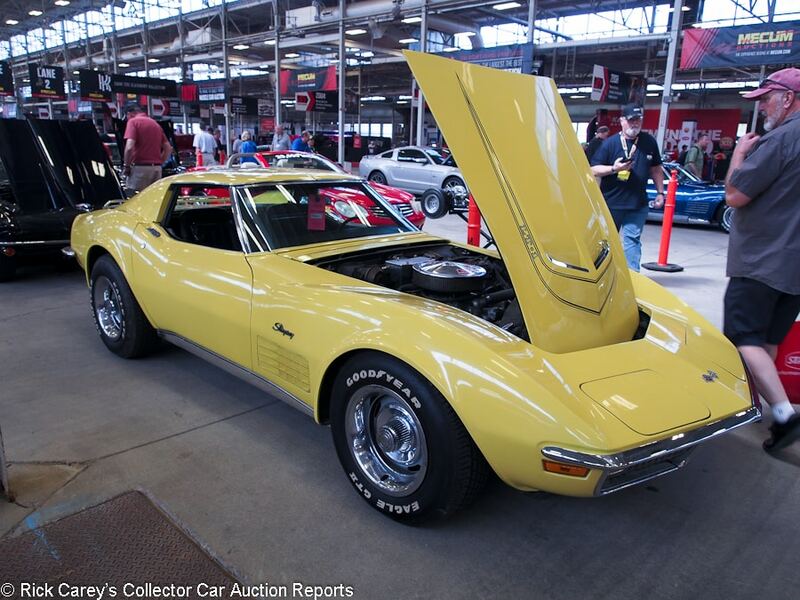 The Spring Classic’s $28,600 median sale was above Kissimmee’s $27,500, and that reinforces the impact of the high visibility cars in Indy and the collections offered in the warren of buildings and tents spread across the Indiana State Fairgrounds. I stayed in an Airbnb cottage owned by an optometrist, a Porsche owner. He joined me on Thursday to peruse the offering and he came close to being a registered bidder. That’s the allure of the Spring Classic offering. 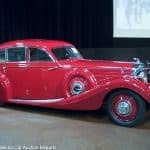 It is a celebration of automobiles, endorsed by big crowds of bidders and spectators lured into becoming owners by the panoply of cars on offer. The descriptions below are by me, Eric Nelson and Matt Nelson; just 10.6% of the cars on offer at the Spring Classic but an embarrassment of diverse cars. It’s nearly impossible to re-create in a summary. 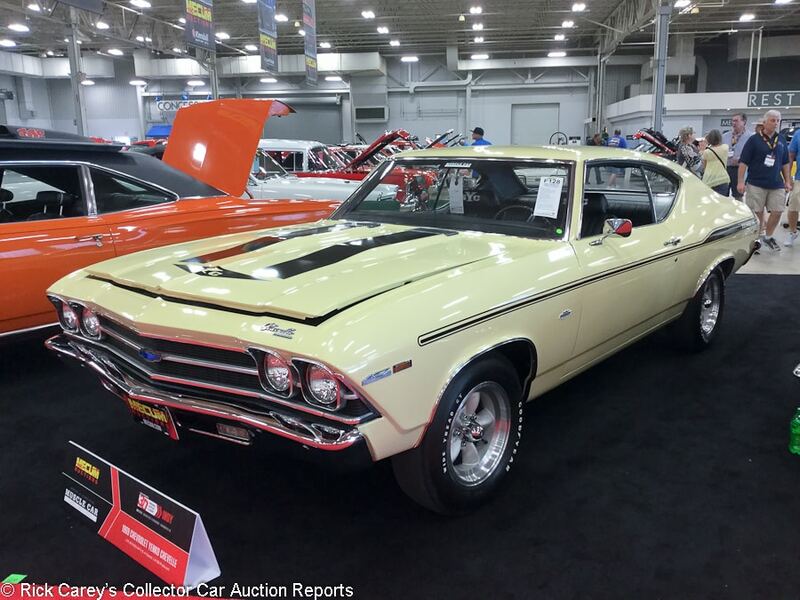 The Mecum Spring Classic car transaction descriptions are sorted by marque, model, body style and year to group cars with other similar lots and make reviewing them easier. Your comments and observations on this sequence are welcome. 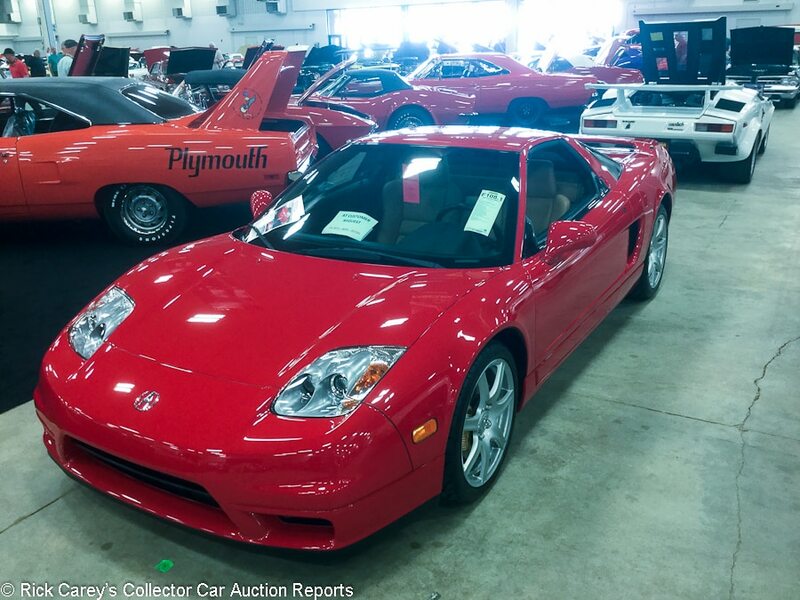 Lot # F108.1 2004 Acura NSX-T 3.2L Targa; S/N JH4NA21674T000145; New Formula Red/Black leather; Estimate $100,000 – $125,000; Unrestored original, 2 condition; With Reserve; Hammered Sold at $95,000 plus commission of 10.00%; Final Price $104,500 – Power windows, air conditioning, factory cassette stereo. – Showing 8,950 claimed original miles. Paint is nearly perfect. Rubber seals are clean and straight. Engine bay is almost spotless, and so is the underbody. Interior looks unused. Looks almost showroom fresh. Window sticker documented, books and keys. – The NSX showed the world that you could daily drive a supercar and not break the bank every time it needed a service. They never really got cheap so there are plenty of well-kept ones out there, but this one is still in impressive condition. The buyer here paid top-dollar, but got a top quality car and it’s easy to make the case that these instant classics, which are among the last of the truly analog supercars, have nowhere to go but up in value. 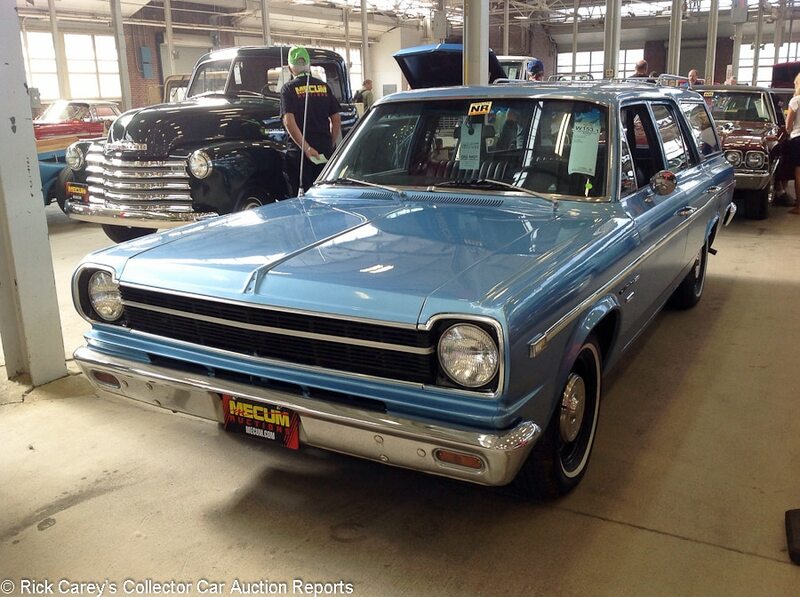 Lot # W153.1 1969 American Motors American Rambler 440 Station Wagon; S/N A9A085B253590; Blue/Black; Visually maintained, largely original, 3- condition; No Reserve; Hammered Sold at $5,500 plus commission of 10.00%; Final Price $6,050 – 232/145hp six, automatic, dog dish hub caps, automatic transmission, aftermarket air conditioning. – Budget repaint has a lot of dust and dirt particles in it. Panel fit is uneven and the hood edge is rubbing on the fender. Brightwork has a lot of scratches, dings and pitting. The hood emblem is missing. The engine bay looks untouched with paint on the firewall and inner fenders that does not match the exterior. Underneath looks all original, with undercoating flaking off. Felt dash pad is hiding the actual dash. The trim around the gauges is very worn. Seats look new, but the rest of the interior looks original. Represented as a fresh restoration, but this is a “restoration” done only to the limited standards of a low standards owner. Still, you never see these in any kind of condition, and this one is probably better than most. – Camping in this Rambler wagon in the infield at Lime Rock or Watkins Glen would be a special treat on an historic racing weekend, and for this much money plus the cost of sufficient attention to drive it there it’s a reasonable one-time experience expenditure. The fact that’s there’s a real car with fold down seats left to recycle at the end of the adventure is a bonus. Lot # T097.1 1968 American Motors AMX Go Package Fastback; S/N A8M397X323769; Dark Blue, White stripes/Dark Blue vinyl; Visually maintained, largely original, 3+ condition; With Reserve; Not sold at Hammer bid of $26,000 – 390/315hp, Go package, 4-speed, power steering, power brakes, Magnum 500 wheels. – The paint has a lot of chips and touch ups, and panel gaps are uneven. Brightwork has some scratches and pitting. Engine bay is showing age and wear, but looks to be correct and complete. Underneath looks good. The original undercoating is still holding up well and looks to have newer exhaust. Interior looks good and is showing very little wear, but the steering wheel is cracked. Represented as 42,579 miles and the matching numbers engine. 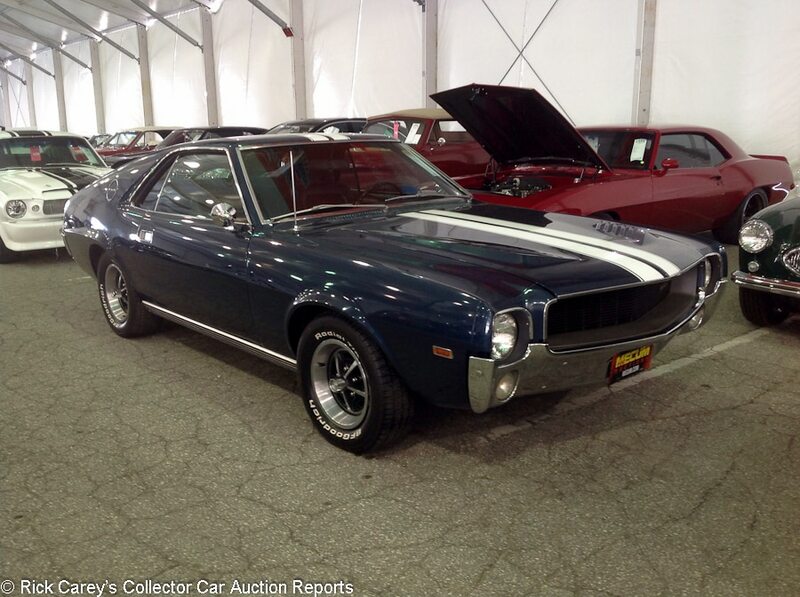 A maintained but unrestored driver quality first-year AMX. – The Go Package for ’68 included dual exhaust, heavy-duty cooling, power front discs, limited-slip and beefed up suspension. A base AMX in this condition is worth about the reported high bid here, but taking the premium for Go Package-equipped cars into account, the seller was reasonable to hold out for a bit more. 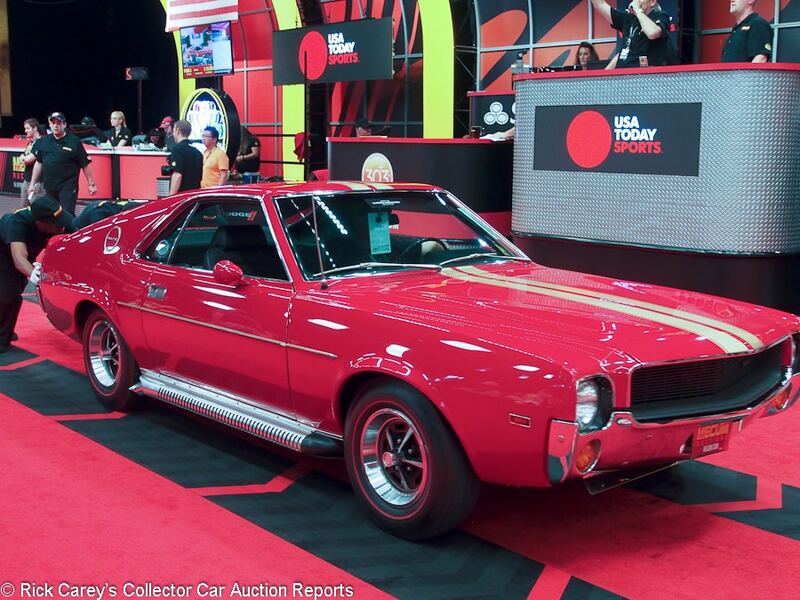 Lot # F168.1 1969 American Motors AMX Go Package Fastback; S/N A9M397X136055; Red, Gold stripes/Black vinyl; Estimate $35,000 – $45,000; Cosmetic restoration, 3+ condition; With Reserve; Hammered Sold at $40,000 plus commission of 10.00%; Final Price $44,000 – Go Package, power brakes, Hurst shifter, side exhaust, tilt steering column, red line tires, AM radio with 8-track, Twin-Grip differential. – Second year for the AMX. The 39,031 miles showing are represented as original. Paint shines well but has lots of swirl marks from detailing. Brightwork looks very good. Panel fit and gaps aren’t perfect. Engine bay looks good and correct, but could use a good detail. Underbody looks like it was recently recoated. Interior is showing its age with some wear and fading. Certainly not original but never fully taken apart and restored, either. It’s currently in solid driver condition. – Sold at Barrett-Jackson Scottsdale in 2010 for $36,300 then hammered not sold a few months later at Mecum Indy at a $26,500 high bid. 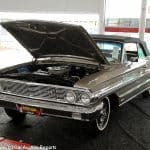 AMC stuff often flies under the radar at auction, but there were clearly AMC people in Indy this year, as this and other similarly strong results for AMCs at the auction demonstrate. 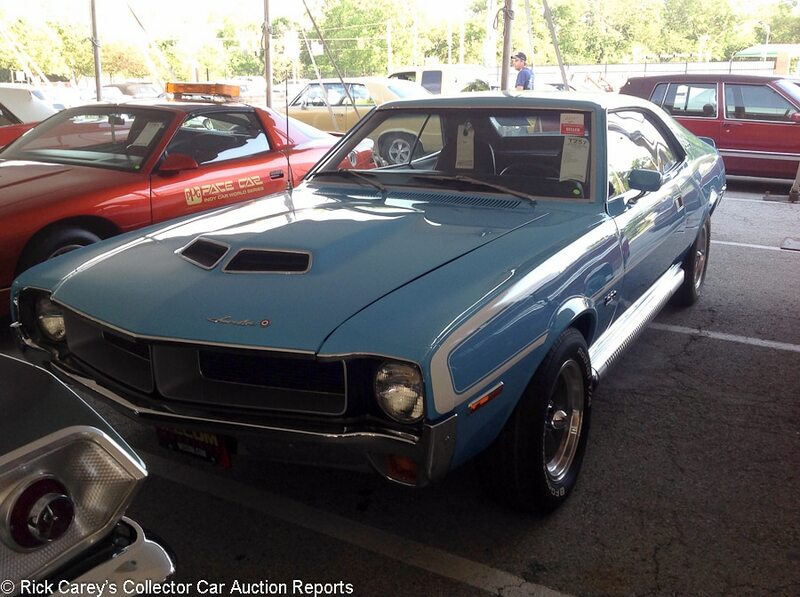 Lot # S247.1 1970 American Motors Javelin SST Mark Donohue Fastback; S/N A0M797X212287; Big Bad Blue, White stripes/Black vinyl; Recent restoration, 2 condition; With Reserve; Not sold at Hammer bid of $37,500 – 390/325hp, 4-speed, front and rear spoilers, power steering, power brakes, side exhaust, aftermarket Torque Thrust wheels, SST, Go and Big Bad packages. – Paint is very good. Panel gaps are just a little bit uneven. Brightwork looks excellent. The taillight lens was overlooked during restoration but the engine bay looks better than factory with no signs of use. Underneath is immaculate. Interior looks new with the exception of the dash, where the trim does not fit correctly. A high quality, recent restoration with just a few minor things overlooked. – Rerun of T257, no sale at $41,000. AMC wisely capitalized on the Javelin’s success in Trans Am racing with the Mark Donohue package, but also introduced it to homologate the Donohue-designed rear spoiler, and about 2,500 were built. This is a fully loaded car and very well restored to boot, but AMCs still just aren’t worth as much as the equivalent Pony cars from the Big Three. 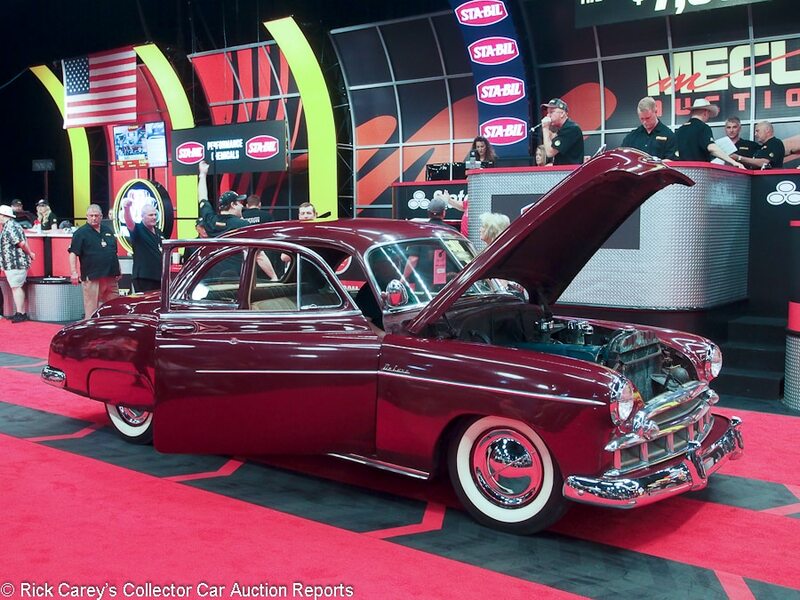 The Indy bidders afforded this car a hefty price, but no more than it’s arguably worth. It could have gone to a new home at this price. Lot # F003 1969 American Motors SC/Rambler Hurst 2-Dr. Hardtop; S/N A9M097X290788; Red, White, Blue/Black vinyl; Older restoration, 3 condition; With Reserve; Hammered Sold at $40,000 plus commission of 10.00%; Final Price $44,000 – 390/315hp, 4-speed, 3.54 limited slip, Sun tach, Hurst T-handle shifter, hood pins, red line tires. – Finished in the ‘A’ paint scheme. Paint looks very good with a few minor blemishes on the front. Driver’s door will not close all the way. Brightwork looks good with some minor scratching. Panel gaps are a little uneven. Engine compartment is very clean with some discoloration to the intake and a little surface rust on the brake fluid reservoir. Underneath is clean with tiny bits of surface rust starting on the panel seams. Interior looks new with no wear other than a cracked steering wheel. A mostly very solid SC/Rambler that’s only showing minor signs of age from an older restoration. – With about 1,500 built and quarter-mile times in the low 14s, SC/Ramblers offer a lot of rarity and performance for the money, and this was pretty much right on the money for a solid and only lightly aged driver that was offered by Mecum in Chicago in 2014 with a reported high bid of $50,000. 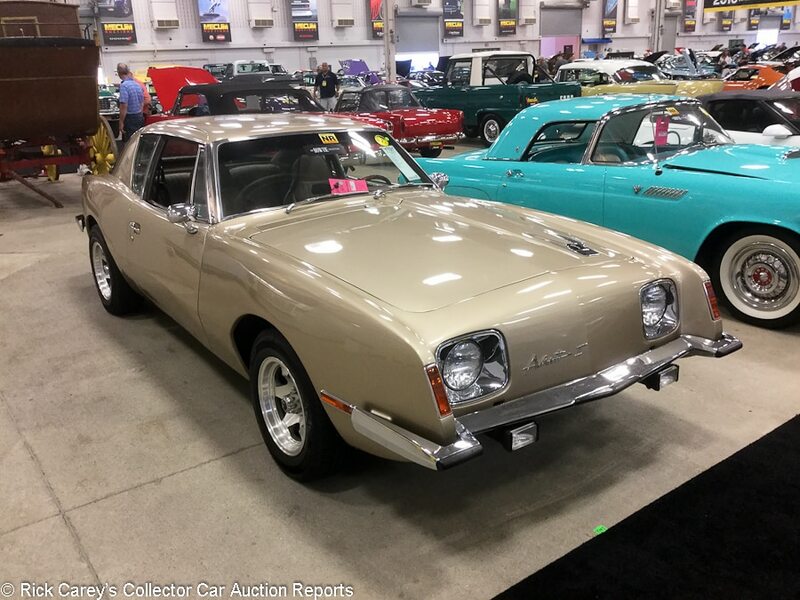 Lot # T197 1978 Avanti II Coupe; S/N RQB2661; Gold/Brown vinyl with Beige cloth inserts; Estimate $15,000 – $20,000; Visually maintained, largely original, 3+ condition; No Reserve; Hammered Sold at $13,000 plus commission of 10.00%; Final Price $14,300 – 350/180hp, automatic, power steering, power brakes, air conditioning, tilt steering column, cruise control, luggage rack, Nardi woodrim steering wheel. – The paint shows some orange peel as well as cracking on the roof and by the rear trunk lid. Brightwork is pitting and scratched. Rubber seals are discolored but in decent shape. Engine compartment is dirty with corrosion and rusty bolts, but everything looks complete and unmolested. Underbody shows some surface rust. Interior is good. Seats look dull but don’t show much wear. Carpet looks clean but some strands are pulled out. Showing 57,930 miles. A maintained but unrestored example in driver condition. – Those who love the unconventional Raymond Loewy styling of the Avanti but don’t have the money or patience to find a genuine Studebaker-built car are fortunately spoiled for choice when it comes to the later Avantis, which were built under the ownership of five different companies all the way up until 2006 and can be had at fairly affordable prices. In 1978, the Avanti II was still built on the Studebaker-designed chassis, and this was a straightforward and appropriate result for one in this condition. 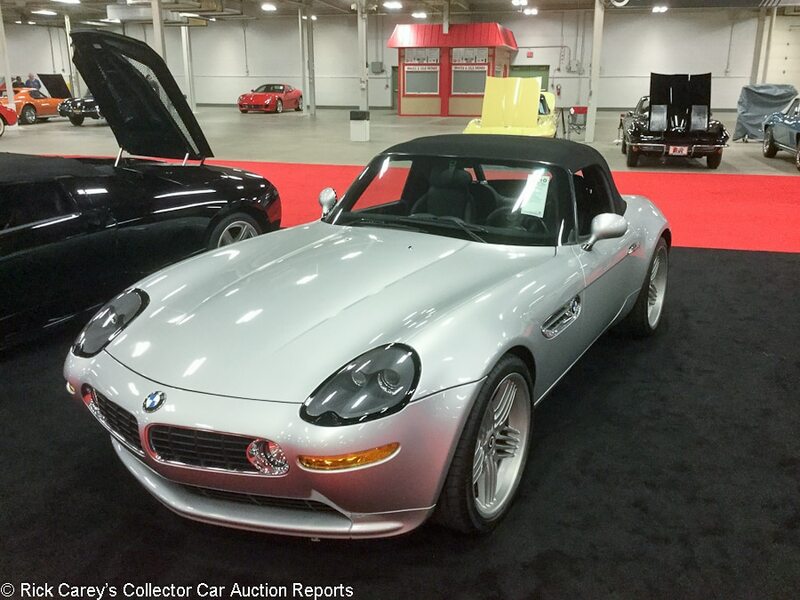 Lot # S110 2003 BMW Z8 Alpina Roadster; S/N WBAEJ13433AH62504; Silver/Black leather; Black top; Estimate $225,000 – $250,000; Unrestored original, 2 condition; With Reserve; Hammered Sold at $180,000 plus commission of 10.00%; Final Price $198,000 – Alpina wheels, power windows, power seats. – Paint is like new. Rubber trim is scuffed at places. Engine bay is very clean. Underside looks unused. Interior looks good. Carpet could use a cleaning. Seats look almost unused. Showing 12,204 miles and essentially looks new. Car 514 off 555 Z8s modified by Alpina to have more torque and be more casual cruisers than sports cars. – The Z8 Alpina is one of the rare exotics to stop depreciating and start growing in value less than 20 years after its build date. It would have cost somewhere in the mid-100s when new, and while certain examples have cracked a quarter-million dollars at auction, the high-100s seems to be typical going rate at the moment. The appeal is somewhat mysterious. Lot # W083 1958 BMW-Isetta 300 2-Dr. Sedan; S/N 573486; Red, White/Red, Black plaid; Grey vinyl top; Recent restoration, 2+ condition; With Reserve; Hammered Sold at $29,000 plus commission of 10.00%; Final Price $31,900 – Luggage rack, hubcaps. – Freshly and fully restored with excellent paint, chrome and interior. Underbody and gauge are like new. Above reproach everywhere. 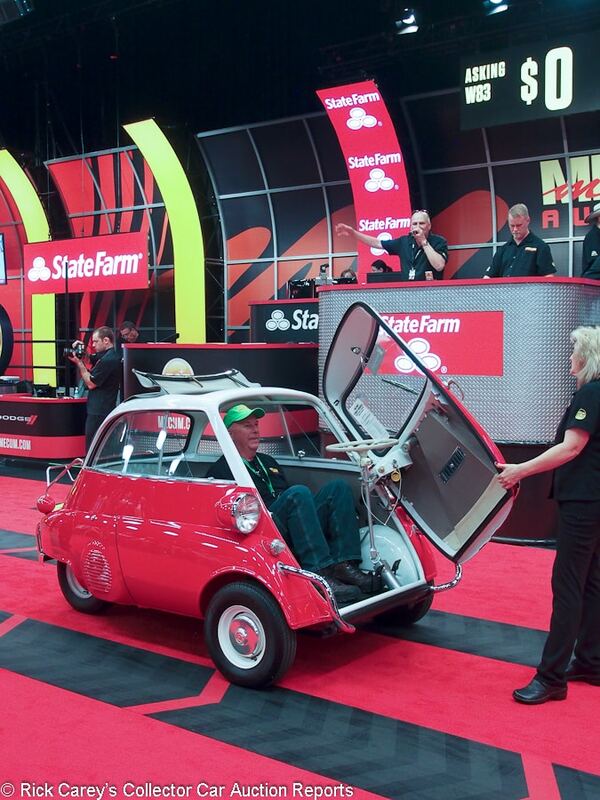 – This is at least a $40,000 Isetta, it’s that good. 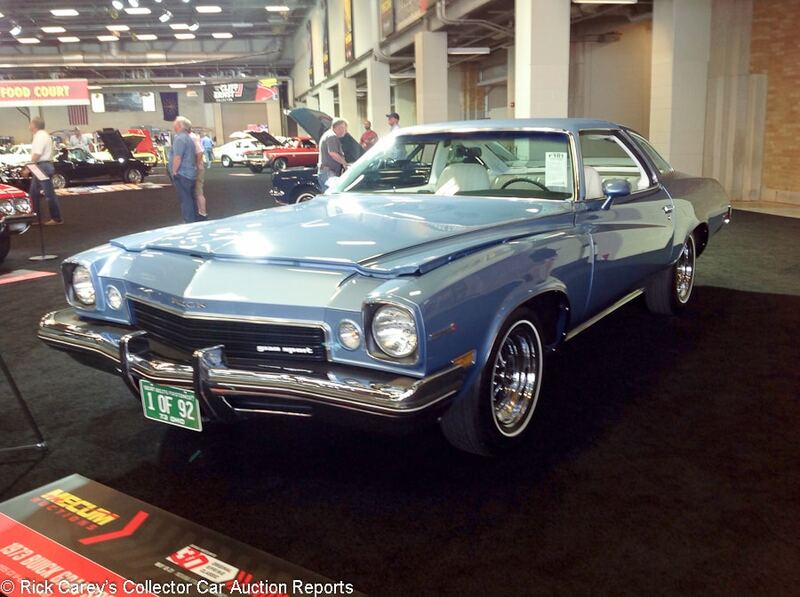 Lot # F101 1973 Buick Century Gran Sport 455 Stage I 2-Dr. Hardtop; S/N 4D37V3H241071; Medium Blue, Blue vinyl roof/White vinyl; Estimate $40,000 – $60,000; Older restoration, 2 condition; With Reserve; Hammered Sold at $50,000 plus commission of 10.00%; Final Price $55,000 – 455/270 Stage 1, 4-speed, air conditioning, power steering, power brakes, Magnum wheels, power windows, power locks, limited-slip, tilt steering column. – From the Mike Guarise collection. Paint looks excellent. Panel fit is spot-on. Brightwork looks very good other than some light pitting on the bumpers. Rear window trim doesn’t fit evenly. Engine bay looks just about new. Underneath is spotless. Interior looks very good with some wear on the door panel armrests. New carpet does not fit quite right. A mostly still fantastic older restoration. – One of 92 Stage 1 Gran Sports and 41 with factory air, even with the down-rated 1973 engine this is a rare and desirable car, especially with the 4-speed, and it brought a price that reflected its rarity and performance as well as a quality restoration. 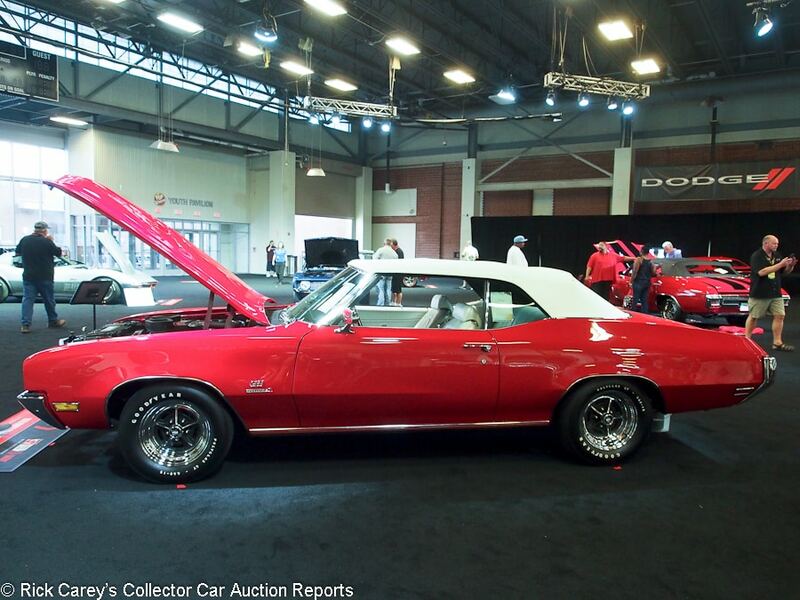 Lot # S116 1970 Buick GS Stage 1 Convertible; S/N 446670H217559; Fire Red/Pearl vinyl; White vinyl top; Estimate $175,000 – $200,000; Recent restoration, 2+ condition; With Reserve; Hammered Sold at $170,000 plus commission of 10.00%; Final Price $187,000 – 455/360hp, 4-speed, power steering and brakes, styled wheels, Polyglas GT tires, pushbutton radio, Hurst shifter, console, gauges, consolette. – Documented with the original window sticker and a GS Historical Society Report. Excellent paint, chrome, interior glass and top. Restored better than new. Mike Guarise Collection. – Offered here a year ago when it was reported bid to $155,000, the seller adjusted expectations and sent a new owner home with this high performance Buick, something that sounds like an oxymoron today when all Buicks seem to be gold and driven slowly by white-haired octogenarians. It is a reasonable result for the seller and a choice car for the new owner. 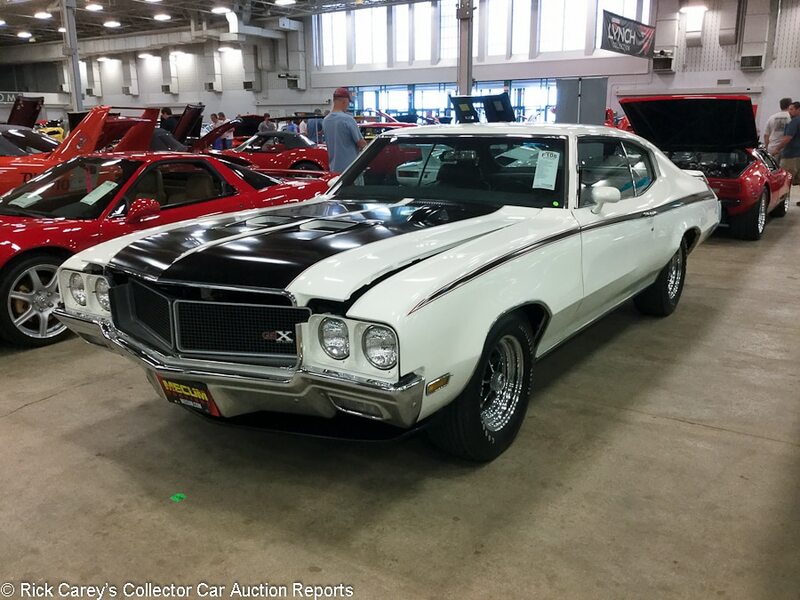 Lot # F108 1970 Buick GSX 2-Dr. Hardtop; S/N 446370H277685; Apollo White, Black stripes/Black vinyl; Estimate $90,000 – $110,000; Older restoration, 2- condition; With Reserve; Not sold at Hammer bid of $70,000 – 455/350hp, automatic transmission, Rallye ride control package, power steering, power front disc brakes, hood tachometer, center console, Polyglas tires, AM radio with 8-track, F41 suspension, limited-slip. – Paint looks very good other than a crack in the passenger’s side A-pillar. Panel fit is very good. Brightwork looks excellent. Engine compartment is showing some age. Underneath is very clean with slight signs of use. Interior is very good with minimal wear. Sold new in Hollywood. Represented as a two-time Buick Nationals winner with GS Historical Society documentation, window sticker and Protect-o-Plate. An older restoration by Dave Kleiner. One of 187 in Apollo White, one of two available colors. – A little aged and with a few miles to demonstrate that it really does work as it should but even at that the reported high bid should have been more than enough to send it on its way to a new home. It has all the credentials, but that doesn’t support thinking it’s worth any more than this bid. 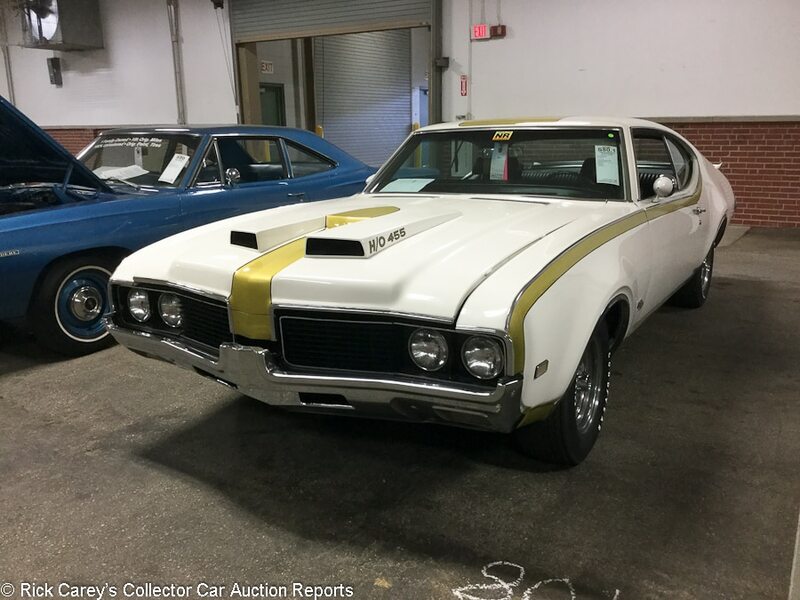 Lot # S109 1970 Buick GSX Stage 1 2-Dr. Hardtop; S/N 446370H255253; Saturn Yellow, Black stripes/Black vinyl; Estimate $150,000 – $175,000; Older restoration, 2- condition; With Reserve; Hammered Sold at $150,000 plus commission of 10.00%; Final Price $165,000 – 455/360hp, automatic, dealer installed Stage II, Edelbrock intake, 850cfm Holley carb, 4.78 rear axle, power steering and brakes, buckets and console, headers, hood tach, chrome rim wheels, Polyglas GT tires. – Represented as the complete original drivetrain with Protect-o-Plate, GM historical documentation and full ownership history. Excellent paint, chrome, interior and glass. Good fits and gaps. Gauges are like new, so is the engine compartment but the underbody should at least have been cleaned. – Sold by Barrett-Jackson at WestWorld in 2007 for $181,500 and a quality older restored car at a reasonable price here. 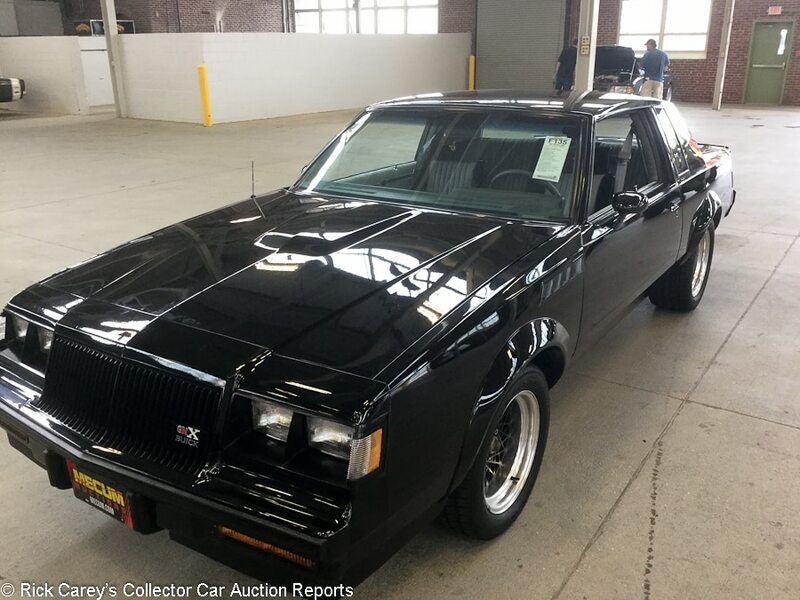 Lot # F135 1987 Buick Regal GNX 2-Dr. Hardtop; S/N 1G4GJ1173HP451385; Black/Gray, Black cloth; Estimate $135,000 – $150,000; Unrestored original, 2- condition; With Reserve; Hammered Sold at $115,000 plus commission of 10.00%; Final Price $126,500 – 231/276hp, automatic, power steering, power brakes, power locks, power windows, cruise control, air conditioning, tilt steering column, six way power seat. – Showing 42 original miles. Paint looks good with a lot of small scratches, probably from a car cover, and a large number of chips on the roof and trunk lid. Rocker panel paint is peeling off. Panel fit looks very good. Glass is delaminating on the lower driver’s side. Engine compartment is all original but could use a good detail. Underneath has some signs of surface rust starting. Interior looks brand new. Car 422 of 547 built. One owner car. Barely driven and essentially a new car if you go by the odometer, but this car does not look to have been carefully or properly stored, at least not for all of its 30 years. – The Indy bidders decided to ignore this GNX’s issues and that it will likely need significant work before being drivable again, instead focusing on the 42 miles and single ownership. Barrett-Jackson sold a 1,500-mile GNX in Scottsdale this year for $117,700, and that was arguably a better car. 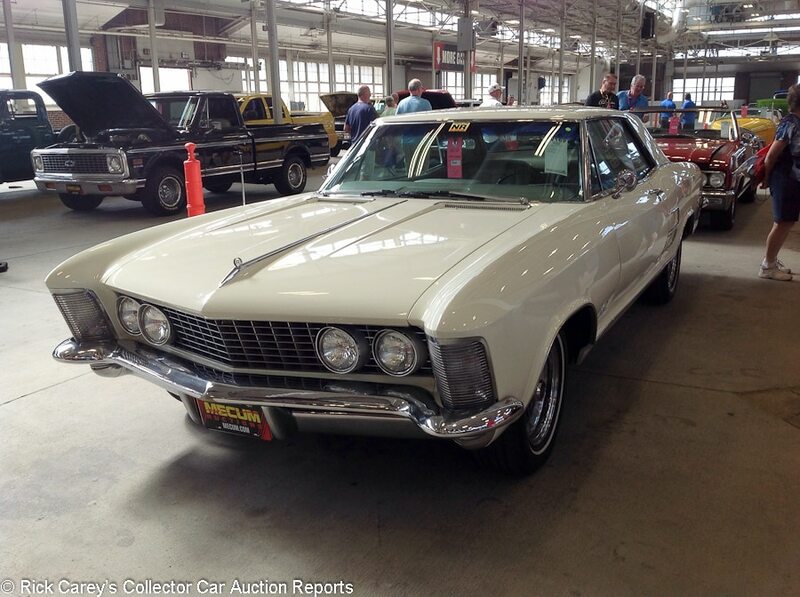 Lot # W169 1964 Buick Riviera 2-Dr. Hardtop; S/N 7K1189384; White/Beige vinyl with cloth inserts; Visually maintained, largely original, 3+ condition; No Reserve; Hammered Sold at $23,000 plus commission of 10.00%; Final Price $25,300 – 425/340hp, automatic, air conditioning, tilt steering column. – Paint looks new, but there are lots of particles in it. Gaps are uneven. Brightwork looks very good with only a few minor blemishes. Engine bay looks original with some paint peeling on the engine. The underbody also looks original with a little surface rust and an older replacement exhaust. Interior looks good. The headliner is separating in a few places, and there is wear on the door panels. A cosmetically maintained and mostly good but lightly worn second-year Riviera. – Classic design and a generally solid and usable car with A/C bought for this price is a sound value. 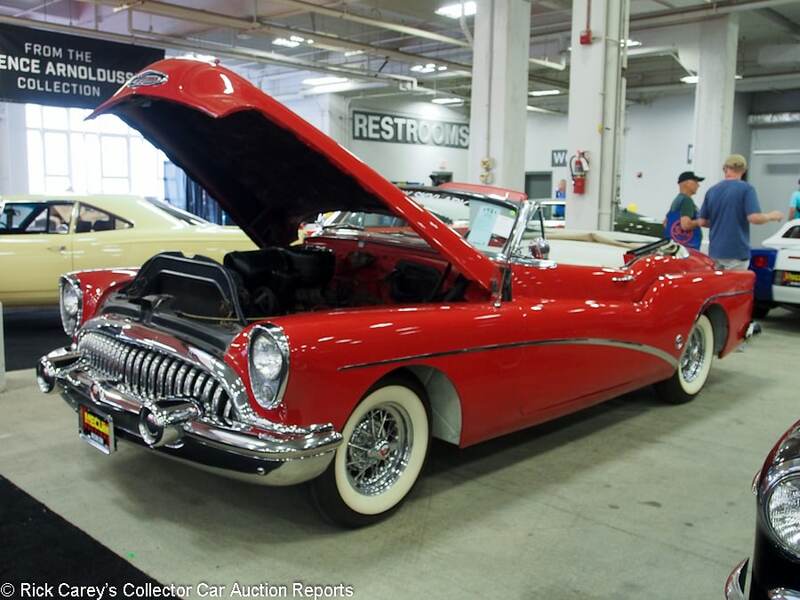 Lot # T141 1953 Buick Skylark Convertible; S/N 16756391; Matador Red/Red, White leather; White vinyl top; Visually maintained, largely original, 3- condition; No Reserve; Hammered Sold at $85,000 plus commission of 10.00%; Final Price $93,500 – 322/188hp, Dynaflow, power steering, pushbutton radio, chrome wire wheels, wide whitewalls, power windows. – Painted assembled with plentiful overspray and masking misses. Good lightly creased new interior. Freshly polished chrome looks good but doesn’t sparkle. The engine compartment is a neglected, dirty nightmare. New lipstick doesn’t do much for this pig. – Done to collection display standards to look good with the hood closed from 20 feet away, this Skylark needs and deserves to be fully restored. At this price the new owner has about $100,000 to play with to make it live up to its potential, possible but tenuous as restorations always cost more than planned. 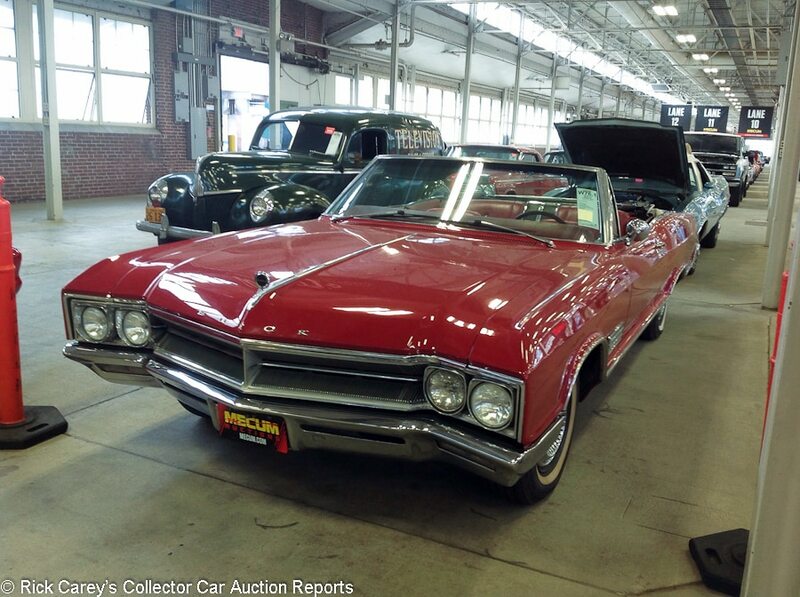 Lot # W076.1 1966 Buick Wildcat Custom Convertible; S/N 466676C103573; Red/Red, White vinyl; White vinyl top; Cosmetic restoration, 3- condition; With Reserve; Hammered Sold at $12,500 plus commission of 10.00%; Final Price $13,750 – 401/325hp, automatic, power steering, power brakes, center console, factory tach, power windows, power bucket seats. – Older paint has some swirls and chips, but otherwise looks good. Panel gaps are a little uneven. Brightwork is showing age and has some pitting. Engine compartment is showing age with lots of paint chipping from the engine. Underneath looks good, with undercoating holding up well. Interior looks original with faded carpet, seats showing discoloration and a decent amount of wear to the side panels. Represented as restored, it looks like a body-on cosmetic restoration job done a while ago and on a budget, but it’s still an attractive and well-equipped driver. – Offered here a year ago with a reported bid of $17,500. The successful hammer bid here was $5,000 less. The new owner got a lot of Wildcat for a modest price. 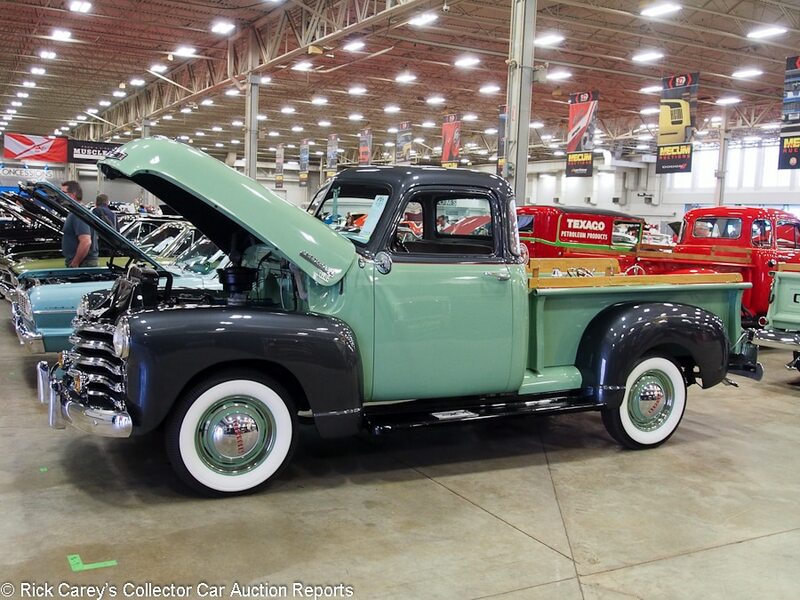 Lot # F092.1 1956 Chevrolet 3100 Pickup; S/N 3A560002614; Light Green, Dark Green roof/Tan vinyl; Estimate $50,000 – $75,000; Truck restoration, 2- condition; With Reserve; Hammered Sold at $46,000 plus commission of 10.00%; Final Price $50,600 – 235/140hp, 4-speed, sidemount spare, wood bed, heater, hub caps and trim rings, bumper guards, whitewalls, dual mirrors. – Very good paint. Panel gaps are uneven, and the passenger’s door rubs on the front fender. Brightwork looks good other than some pitting on the hood emblem. Engine compartment is very clean with some slight discoloration to the cylinder head. Underneath is very clean and well restored. Interior is excellent, although the trim around the gauges has a few dings in it. Body-off restored to higher than normal truck standards and featured in a Hemmings calendar. – Hammered not sold at Mecum Monterey last year at a high bid of $37,500. It would have seemed reasonable to guess that it wouldn’t attract a much higher offer than that, but enough people in Indy wanted it and it brought absolute top-dollar for a six-cylinder 3100. Lot # F092 1954 Chevrolet 3100 Pickup 5-Window; S/N H54K131206; Swift Red/Black vinyl; Estimate $60,000 – $80,000; Recent restoration, 2+ condition; With Reserve; Hammered Sold at $46,000 plus commission of 10.00%; Final Price $50,600 – 235/, Hydramatic, hubcaps, trim rings wide whitewalls, single sidemount spare, oil filter, dual outside mirrors, oak bed floor and rails, stainless bed strips, chrome bumpers, clock, alternator, heater. – The paint, chrome, interior, bed and engine compartment are excellent as is most of the underbody. There’s some overspray and bad masking and overspray in the left front wheelwell. Even with that, this truck is far better than when it left the factory. – Sold by Mecum in Los Angeles in February for $40,150 and turned over here at a small profit even after the seller’s commission. Even at that, it’s still all the truck for the money. 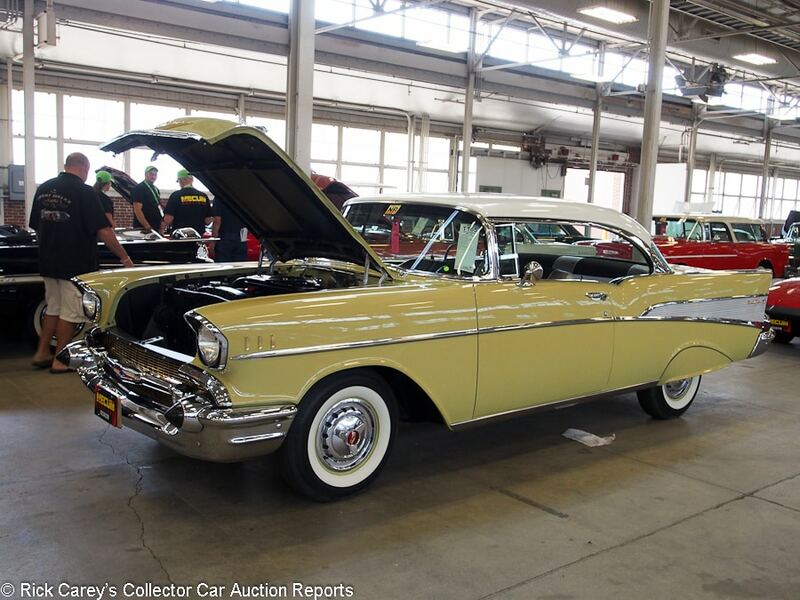 Lot # T165 1957 Chevrolet Bel Air 2-Dr. Hardtop; S/N VC57K165508; Engine # F321GD; Coronado Yellow, India Ivory roof/Silver vinyl, Black cloth; Older restoration, 2 condition; No Reserve; Hammered Sold at $57,000 plus commission of 10.00%; Final Price $62,700 – 283/245hp dual quads, Turboglide, spinner wheel covers, whitewall bias ply tires, skirts, pushbutton radio. – Very good paint, chrome and interior. Body filled behind the right front wheel but otherwise sound. The engine compartment and underbody are nearly like new. Correct engine number for the 245hp dual quads. – Sold at Kissimmee in 2011 for $50,350 and bought here appropriately for its condition and specifications. 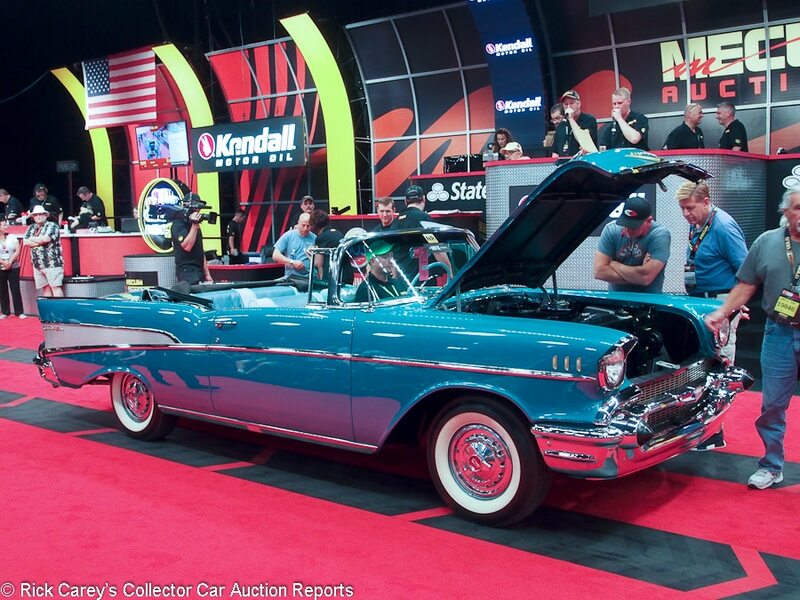 Lot # T173 1957 Chevrolet Bel Air Convertible; S/N VC570156369; Harbor Blue/Two tone Blue vinyl; Light Blue vinyl top; Estimate $45,000 – $60,000; Recent restoration, 2+ condition; No Reserve; Hammered Sold at $94,000 plus commission of 10.00%; Final Price $103,400 – 283/220hp, Powerglide, power steering and brakes, dual exhaust, spinner wheel covens, whitewall bias ply tires, pushbutton radio. – Excellent paint, chrome and interior, The top color is unusual and unevenly distributed. The engine compartment, chassis and underbody are in showroom condition. – This is an intriguing and unusual color combination with an impressive restoration, but it’s only the standard Power Pack and Powerglide under the hood and this is a generous price for it, real generous. Lot # S136 1969 Chevrolet Camaro COPO 2-Dr. Hardtop; S/N 124379N647976; Hugger Orange/Black vinyl; Estimate $175,000 – $200,000; Older restoration, 2 condition; With Reserve; Not sold at Hammer bid of $155,000 – 427/425hp, M22 4-speed, power front disc brakes, F41 suspension, Endura front bumper, deluxe bucket seat interior, Rally wheels, AM/FM radio, center console with gauges, 4.10 Positraction, cowl induction hood, tinted glass. – Paint looks beautiful with no flaws. Panel gaps are slightly uneven. Brightwork looks excellent. Trim on the rear taillight does not fit correctly. Engine bay looks very clean with some discoloration on the intake and paint peeling from the block slightly. Underneath looks great with very little wear. Interior looks excellent with no signs of wear. Three-owner genuine COPO car sold new in Quebec with the original window sticker and GM Canada documentation and fully restored eight years ago, but it is represented with a warranty replacement block. – The Yenkos with questions, like this car’s a replacement block, didn’t do well at the Spring Classic, and there were several of them. This car could have happily gone to a new home at the reported high bid, even with its load of options. Lot # F071 1969 Chevrolet Camaro RS/SS 2-Dr. Hardtop; S/N 124379N556496; Dover White/White houndstooth; Cosmetic restoration, 3+ condition; No Reserve; Hammered Sold at $34,000 plus commission of 10.00%; Final Price $37,400 – 350/300hp, automatic, power steering and front disc brakes, spoilers, SS wheels, Radial T/A tires, tilt steering column, woodgrain steering wheel, console gauges. – Represented as the matching numbers engine. Good older repaint with a few blemishes and fisheyes. Good chrome, stainless and interior. The engine compartment has been driven since it was done, the underbody is clean, dry and original. The color combination is unusual and attractive. – A sound and good-looking RS/SS with the desirable 350/300hp engine, the bidders didn’t get enthusiastic about it, perhaps because there were over 20 ’69 Camaros in the Spring Classic, and bought it for this advantageous price, a good value. 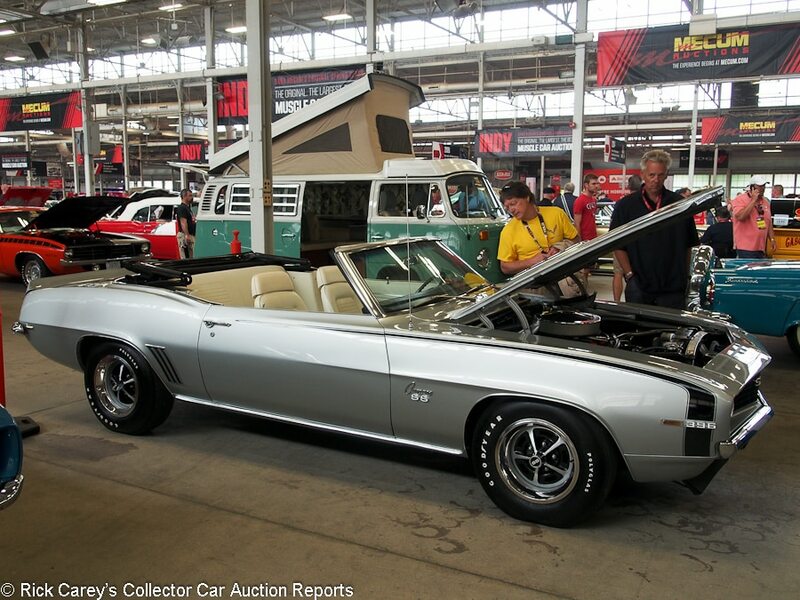 Lot # F049.1 1969 Chevrolet Camaro SS 396 Convertible; S/N 124679N650791; Engine # None; Silver/White vinyl; Black cloth top; Recent restoration, 3+ condition; With Reserve; Not sold at Hammer bid of $49,500 – 396/325hp, automatic, power steering and front disc brakes, no radio, spoilers, SS wheels with trim rings and Polyglas tires. – Freshly restored with good paint, chrome, glass and interior. The engine compartment is done nearly like new but the nooks and crannies of it and the body are silted up with bodyshop dust. Inside the doors and the top boot are dirty and surface rusted. A superficial but shiny restoration with new seatbelts and door handles, a couple of my hot buttons. – Sold here last year for $61,600, so it’s not surprising the consignor balked at accepting a loss of $15,000 or so. The odometer today shows only 8 more miles than it did a year ago, so there wasn’t even any driving enjoyment to assuage the loss. 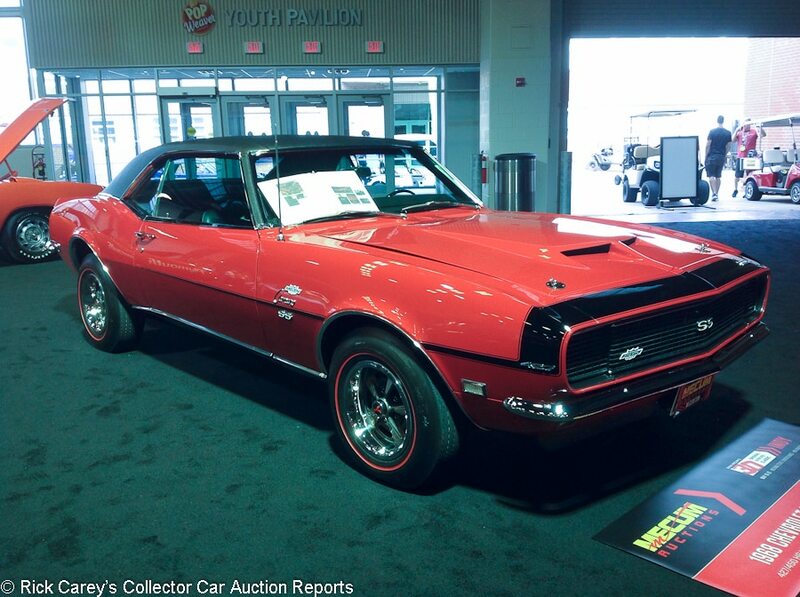 Lot # S149 1968 Chevrolet Camaro Yenko 2-Dr. Hardtop; S/N 124378N459913; Matador Red, Black vinyl roof/Black vinyl; Estimate $350,000 – $450,000; Older restoration, 2+ condition; With Reserve; Not sold at Hammer bid of $300,000 – 427/450hp, M21 4-speed, RS package, Stewart Warner tach, Yenko center caps, power front disc brakes, 4.10 Positraction, heavy duty suspension, Pontiac Rally wheels, red line tires. – Only 11 RS Yenkos built. Paint is excellent. Brightwork looks immaculate. Vinyl top looks new. Panel gaps look perfect. Engine compartment looks excellent with no signs of wear. Underneath looks amazing. Interior looks very good, although the carpet was cut a little short near the door sills. Steering wheel is showing a little wear. Beautiful restoration done on this car, ready to hit the show circuit. Fully restored and featured in Muscle Car Review in 1992, when it won Muscle Car of the Year. Also featured in several other magazines as well as Bob McClurg’s book on Yenkos. The real deal, and still looking fantastic despite the age of its restoration. No representation of any drivetrain originality, though. – This car was reported sold at Mecum’s Dallas auction last November for $368,500, so it is not a surprise (although no doubt a disappointment for the consignor) that it didn’t even get close to an equal bid here. Too many Yenko Camaros? 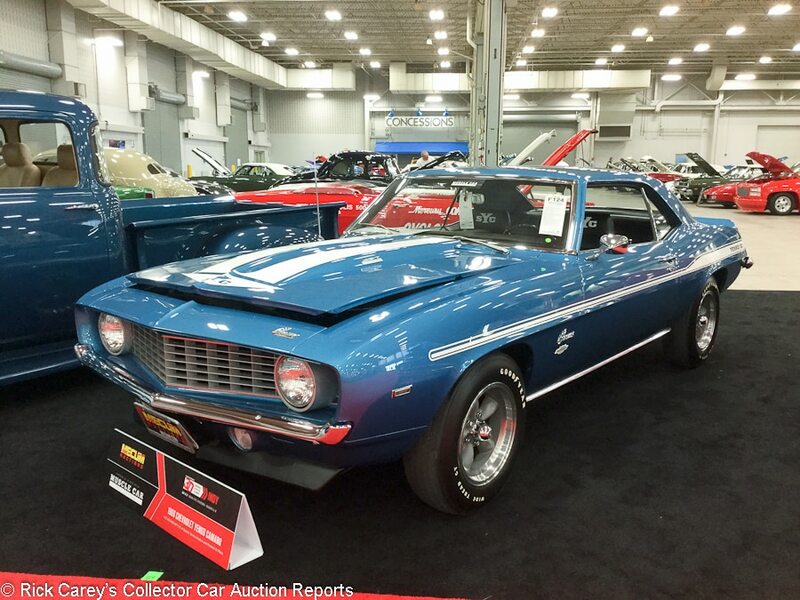 Lot # F124 1969 Chevrolet Camaro Yenko 2-Dr. Hardtop; S/N 124379N663684; LeMans Blue, White stripes/Black vinyl; Estimate $275,000 – $325,000; Older restoration, 1- condition; With Reserve; Hammered Sold at $330,000 plus commission of 10.00%; Final Price $363,000 – 427/425hp, 4-speed, front and rear spoilers, power front disc brakes, ducted cowl hood, AM radio, Hurst shifter, Protect-O-Plate, 4.10 Positraction, F41 suspension, double COPO, 9561 and 9737. – Documented with the Yenko invoice and original Protect-o-Plate, represented as the matching numbers engine and M21 gearbox. Very good paint. Panel fit is excellent. Brightwork looks immaculate. Engine compartment is spotless and appears correct. Underneath looks to be restored to better than new. Interior practically looks new, but the SYC sticker is peeling off the driver’s seat headrest. One of just 201 Yenkos in 1969. Formerly part of the Mick Price collection. An older body-off restoration of a real deal, documented Yenko. – This is one of the very best Yenkos around, beautifully restored and thoroughly documented. It also brought an outstanding price that reflects its condition and rock solid history. 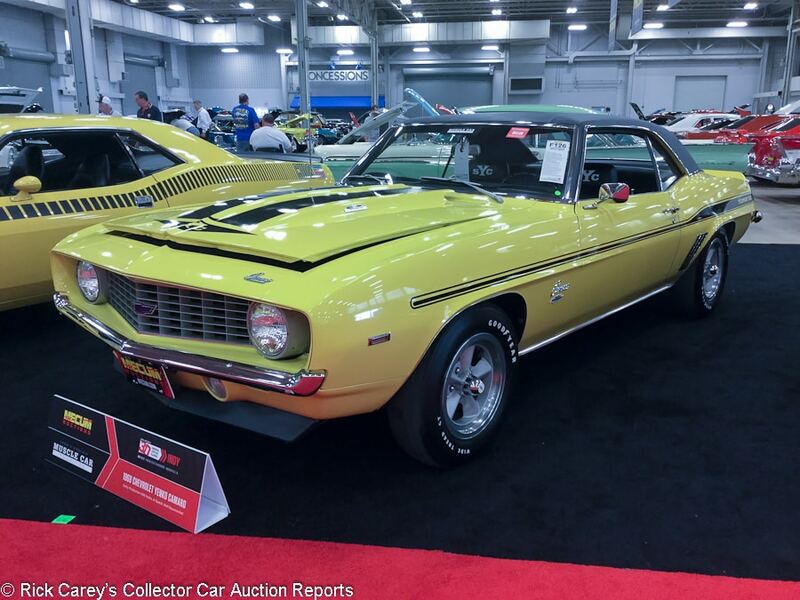 Lot # F126 1969 Chevrolet Camaro Yenko 2-Dr. Hardtop; S/N 124379N578866; Daytona Yellow, Black stripes and vinyl roof/Black vinyl; Estimate $300,000 – $350,000; Unrestored original, 2 condition; With Reserve; Not sold at Hammer bid of $245,000 – 427/430hp, 4-speed, front and rear spoilers, AM radio, power front disc brakes, power steering, Stewart Warner tachometer, 4.10 Positraction, double COPO, 9737 and 9561, documented with the dealer invoice, order form, inspection and purchase paper. – One of 201 Yenko Camaros built in 1969. Paint looks very good with a few very minor blemishes. Vinyl roof looks new. Brightwork looks very good. Windshield is starting to delaminate around the edges. Panel fit looks very good. Engine compartment is very clean with no real signs of use. Underneath is spotless. Interior is very clean and showing very little wear with the exception with the dash pad that is separating near the windshield. An original car showing just 7,602 miles but with a much later big block engine. – An impressive original car, thoroughly documented and honestly described as having had at least two later engines including the big block of unspecified displacement now installed. The replacement engine mitigates its collector value, particularly here where COPOs were thick on the ground and the bidders had other choices of more original cars. The reported high bid is not unreasonable. 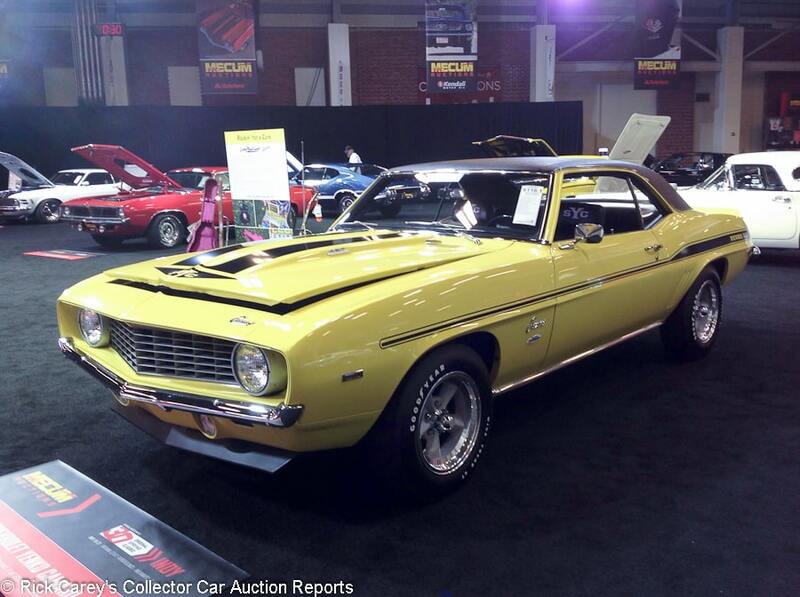 Lot # S116.1 1969 Chevrolet Camaro Yenko 2-Dr. Hardtop; S/N 124379N616724; Daytona Yellow, Black vinyl roof/Black vinyl; Estimate $295,000 – $325,000; Older restoration, 2- condition; With Reserve; Not sold at Hammer bid of $255,000 – 427/425hp L72 engine, ducted hood, M21 4-speed, Hurst shifter, power front disc brakes, Stewart Warner column mounted tach, front and rear spoilers, heavy duty brakes, Hurst shifter, 4.10 Positraction, heavy duty suspension, double COPO, 9561 and 9737. – From the Cliff Ernst collection. Paint looks good with some fine scratches on the tops of the fenders and cracking near the window drip edge. Panel fit looks excellent. Vinyl roof looks new. Engine compartment looks fresh and spotless. Underneath is spotless with correct inspection tags. Interior looks very good but the plastic on the back side of the steering wheel is cracked. A mostly gorgeous older restoration to better than new condition and now showing some age. – This Yenko Camaro lacks only one thing: a representation of the originality of the drivetrain. In its absence it is reasonable to conclude that it isn’t original, just authentic. 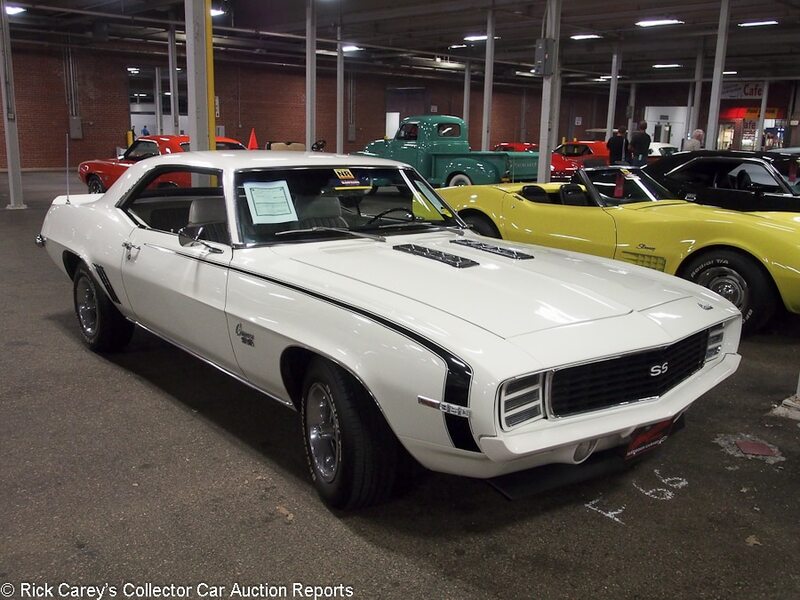 In a sale with many Yenko Camaros on offer that is enough to deter bidders from being generous and supports the reported high bid as realistic. 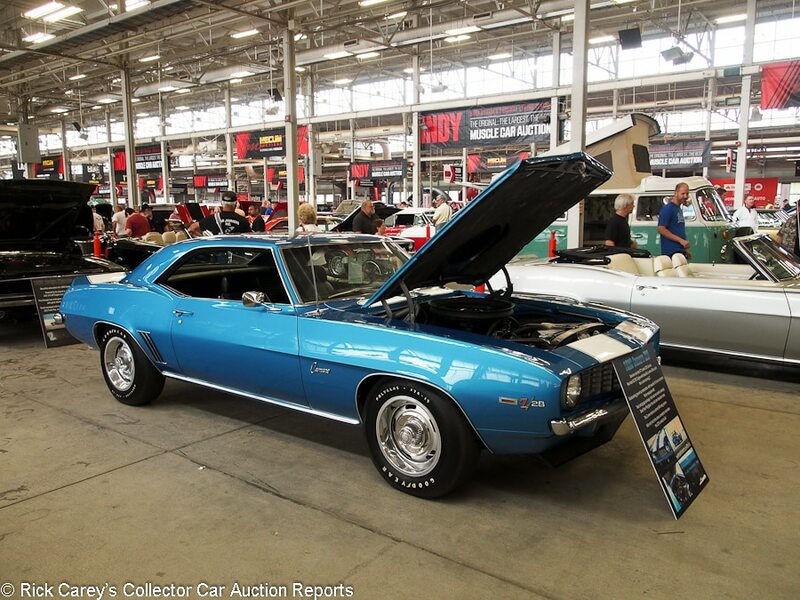 Lot # F170 1969 Chevrolet Camaro Z/28 2-Dr. Hardtop; S/N 124379N608282; Engine # V0205DZ; LeMans Blue, White stripes/Black vinyl; Estimate $60,000 – $80,000; Recent restoration, 2- condition; With Reserve; Hammered Sold at $57,000 plus commission of 10.00%; Final Price $62,700 – 302/290hp, 4-speed, Hurst shifter, console gauges, cowl induction, power steering and brakes, Rally wheels with hubcaps and trim rings, Polyglas tires, spoilers. – Good paint but with some texture on the roof. Good chrome and interior. The engine compartment is like new, as is the underbody. A quality, fresh restoration let down by the roof paint. 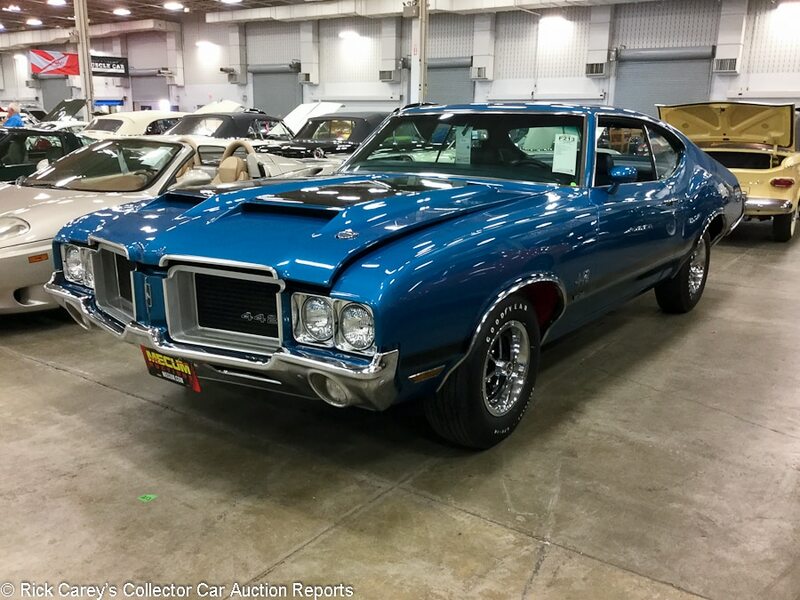 – Sold by Russo and Steele in Scottsdale in 2012 for $45,100 and good enough to attract the bidders attention here in Indianapolis where there were nearly two dozen ’69 Camaros on offer. This is a completely appropriate price for this one. Lot # W082 1969 Chevrolet Camaro Z/28 2-Dr. Hardtop; S/N 124379N565685; Orange, Black stripes and vinyl roof/Black vinyl; Recent restoration, 2- condition; With Reserve; Hammered Sold at $41,500 plus commission of 10.00%; Final Price $45,650 – 302/290hp, M22 4-speed, 4.10 Positraction, AM radio, power brakes, cowl induction hood. – Paint looks very good with a few minor scratches and blemishes. Panel fit could use a little work. Vinyl top looks great. Brightwork has a lot of scratches in it. Engine bay is showing some age with paint flaking from the engine. Underneath is very clean. Interior looks new, although the dash pad doesn’t quite fit evenly. Represented as matching numbers. Reportedly bought from the original owner as a barn find in 2007 with a full restoration finished in 2012. It now shows some age, but is still nearly like new. – This is a huge value for a matching numbers Z/28. It could have brought $20,000 more and still not been expensive. 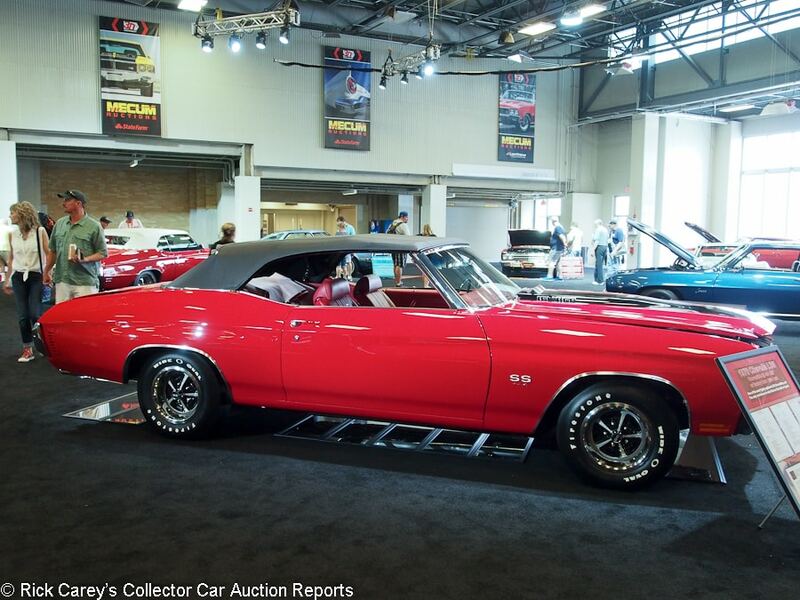 Lot # S113 1970 Chevrolet Chevelle LS6 Convertible; S/N 136670B175703; Engine # T0313CRV; Cranberry Red, Black stripes/Black vinyl; Black vinyl top; Estimate $400,000 – $450,000; Recent restoration, 2+ condition; With Reserve; Hammered Sold at $385,000 plus commission of 10.00%; Final Price $423,500 – 454/450hp, M22 4-speed, F41 suspension, 3.31 Positraction, power steering, power front disc brakes, cowl induction hood, buckets and console, power windows, AM/FM/8-track, GM Canada documented. – Superb paint, chrome, interior and top. meticulously and thoroughly restored to better than new condition, represented as the original engine and drivetrain. – Above reproach in its presentation and unusually well documented due to its Canadian delivery, this is one of the most sought of all Muscle Cars and was bought here for a responsible price. 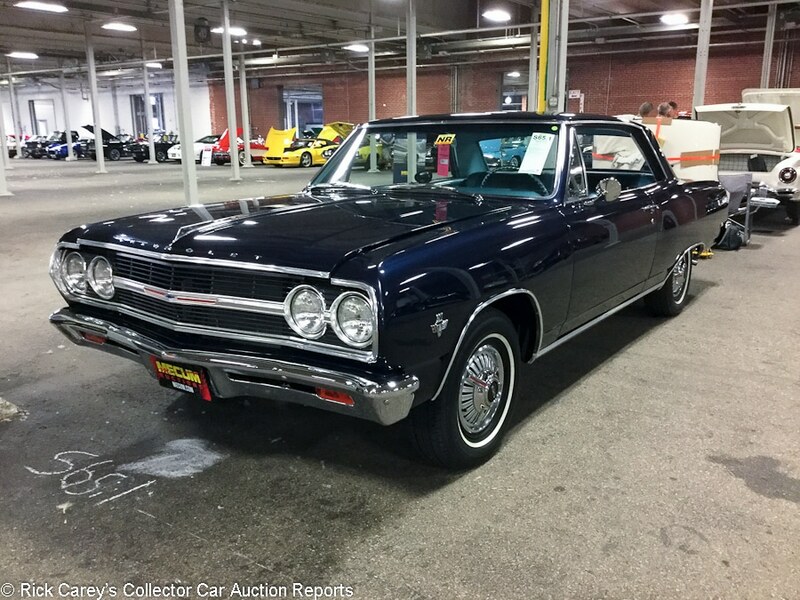 Lot # S065.1 1965 Chevrolet Chevelle Malibu SS 2-Dr. Hardtop; S/N 138375K215826; Danube Blue Metallic/Blue vinyl; Older restoration, 2 condition; No Reserve; Hammered Sold at $42,500 plus commission of 10.00%; Final Price $46,750 – 327/350hp, Protect-O-Plate, M20 4-speed manual transmission, factory dash clock, full wheel covers, whitewalls, bucket seats, 3.31 Positraction, owner’s manual, original registration paper and factory keys. – Represented as matching numbers. Paint looks very good. Brightwork looks very good with a few small scratches. Panel fit is very good. Engine compartment looks very good other than signs of an oil leak on the intake. Underneath looks spotless. Interior looks excellent and new with the exception of the center console, which has lots of pitting. A mostly very good and fresh-looking restoration with only a handful of things overlooked. – It may not have the grunt of the SS 396, but the L79-powered Chevelle competes honorably with its lower weight, is the next best thing and more than quick enough. This one brought strong but appropriate money. 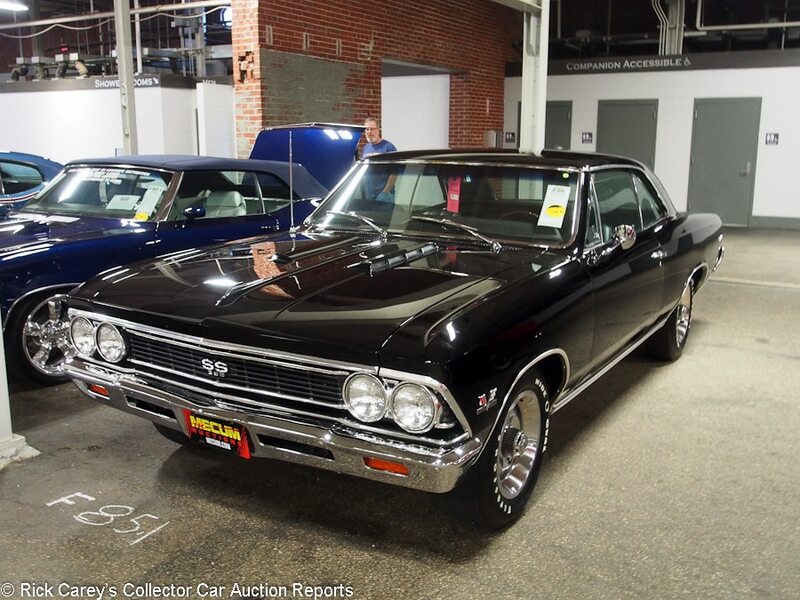 Lot # F086 1966 Chevrolet Chevelle SS 2-Dr. Hardtop; S/N 138176A103334; Tuxedo Black/Black vinyl; Recent restoration, 2+ condition; With Reserve; Hammered Sold at $60,000 plus commission of 10.00%; Final Price $66,000 – 396/375hp, 4-speed, buckets and console, pushbutton radio, Rally wheels with center caps and trim rings, Wide Oval tires, column mounted 90 degree tach. – Freshly restored to showroom condition and impeccable. – This Chevelle has presence, and the performance to back it up. Its presentation leaves nothing to be desired, as does the price it brought. It was reported sold by Mecum at Kissimmee in 2015 for $47,520. 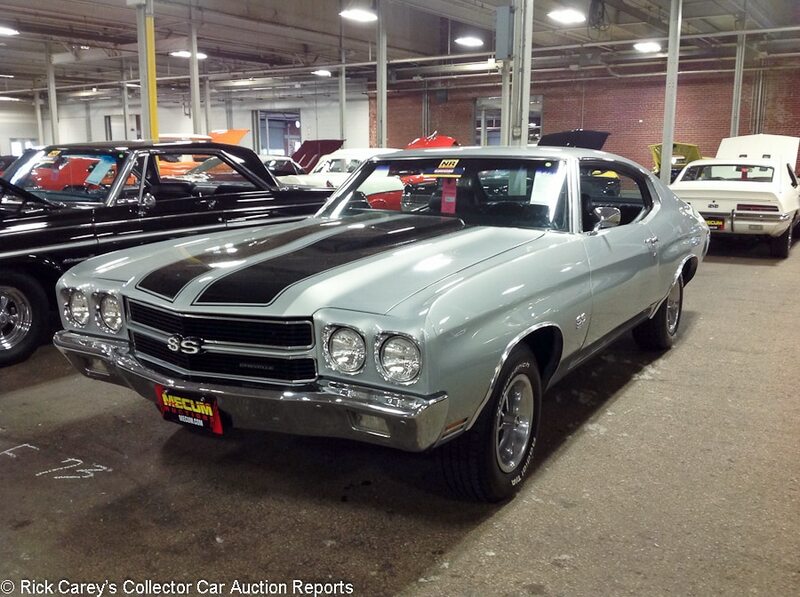 Lot # F073 1970 Chevrolet Chevelle SS 396 2-Dr. Hardtop; S/N 136370R221890; Cortez Silver, Black stripes/Black vinyl; Estimate $40,000 – $50,000; Older restoration, 3+ condition; No Reserve; Hammered Sold at $51,000 plus commission of 10.00%; Final Price $56,100 – 396/350hp, automatic transmission, power steering, power front disc brakes, SS wheels, factory air conditioning, bucket seats with console, horseshoe shifter, Positraction, tinted glass. – From the Dallas and Ammie Hawkins collection. Represented as the “matching numbers” engine. Paint looks very good other than some swirl marks throughout. Panel fit is very slightly uneven. Engine bay looks good with signs of light use since the restoration. Underneath is mostly clean other than signs of a leak on the transmission and exhaust. Interior looks good other than light wear on the driver’s door panel. A lightly worn older restoration on a former California car, now in solid driver condition leaving it ideal for weekend drives and cruise-ins. – This result is appropriate for this Chevelle SS hardtop although a thousand dollars less bought the ’64 GTO convertible (also Silver) that sold just before it. That’s a differential that persists across all manufacturers’ product lines with the less expensive cars that caught collectors’ attention when they were young bringing generally more money in the collector car market than their more expensive (when new) counterparts. 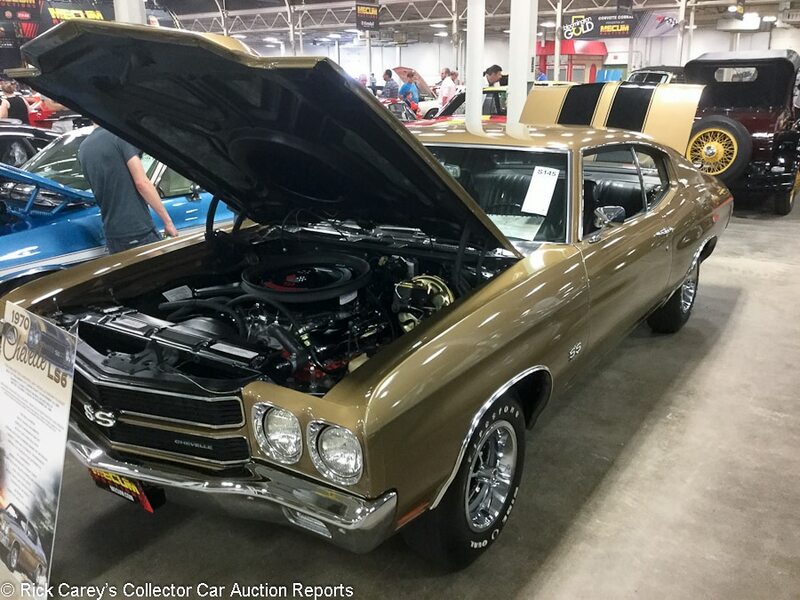 Lot # S145 1970 Chevrolet Chevelle SS 454 2-Dr. Hardtop; S/N 136370K131238; Autumn Gold, Black stripes/Black vinyl; Estimate $165,000 – $185,000; Recent restoration, 2 condition; With Reserve; Not sold at Hammer bid of $115,000 – 454/450hp LS6, automatic, cowl induction, SS wheels, Firestone Wide Oval tires, bucket seats, console, horseshoe shifter, pushbutton AM radio, 3.31 Positraction. – Represented as the original matching numbers engine. Paint is very good, as is the brightwork. Engine bay is very clean. No rust or corrosion. Underside looks unused. Interior also looks new with only some pitting on the center console trim. Canadian market car with GM Canada documentation and two build sheets. Freshly and fully restored last year and won at the MCACN show in Chicago last year. Also represented as the earliest known documented LS6 Chevelle. – In the heat of Saturday’s lineup of headline cars it got harder and harder to separate the wheat from the chaff. Big block muscle ennui may have set in because this LS6 in its unusual color failed to get enough interest to see it off and away to a new owner, particularly not at this skimpy bid. Lot # F128 1969 Chevrolet Chevelle Yenko 2-Dr. Hardtop; S/N 136379B358034; Butternut Yellow, Black stripes/Black vinyl; Estimate $250,000 – $300,000; Older restoration, 2- condition; With Reserve; Not sold at Hammer bid of $210,000 – 427/425hp, 4-speed, power front disc brakes, Stewart Warner column mounted tachometer, AM radio, COPO 9562. – One of 99 Yenko Chevelles in 1969, represented as the original engine. Paint looks very good other than some cracking around the edges of the windows by the drip rail. Windshield is delaminating on the lower corners. Brightwork looks very good. Panel fit is excellent. Engine compartment is excellent with very little wear showing. Underneath is very clean other than some surface rust showing on the driveshaft and exhaust. Interior is very clean with some wear to the steering wheel. Body-off restored in 1990, then shown and featured in magazines. Its show days are behind it, but the quality of the work is apparent in that this car still looks fantastic after 27 years. – More rare than COPO Camaros, but also therefore less notorious, the caliber of this Chevelle’s two decade old restoration is nothing short of amazing. The reported high bid is conservative. 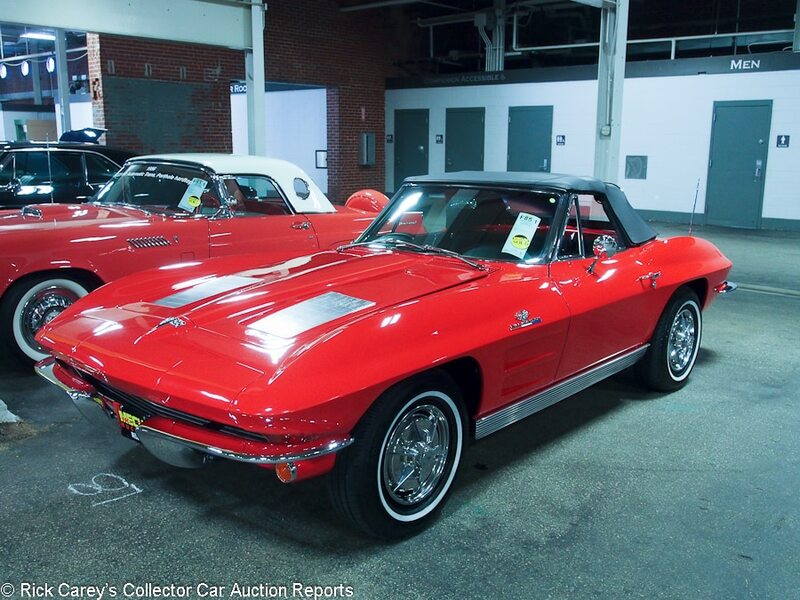 Lot # F180 1962 Chevrolet Corvette Convertible; S/N 20867S111233; Roman Red/Red vinyl; White vinyl top; Estimate $50,000 – $65,000; Older restoration, 2- condition; With Reserve; Hammered Sold at $57,000 plus commission of 10.00%; Final Price $62,700 – 327/250hp, 4-speed, WonderBar radio, both tops, wheel covers, narrow whitewalls. – Paint is very good. Panel fit is very good. Brightwork has a lot of fine scratches. Engine compartment is showing some age, with paint peeling off the block. Underneath is showing age as well with some surface rust starting near the rear end. Interior looks good with some wear and tear on the driver’s side, and the steering wheel is cracked. Represented as matching numbers. NCRS Top Flight in 1986. The restoration looks old, but not that old, which is a testament to the quality of work that went into this car and the careful ownership it has enjoyed since. – It’s not a show car and it has the base engine, but this final year C1 has some desirable options and is in commendable shape, so it should be a thoroughly rewarding car to drive and enjoy. Considering the transmission choice, the hard top and the WonderBar radio that are included, this was a sound buy for a lightly aged restoration like this. Lot # F085.1 1963 Chevrolet Corvette Convertible; S/N 30867S114003; Engine # 3114003 F0416RF; Red/Black vinyl; Black vinyl top; Recent restoration, 2+ condition; With Reserve; Hammered Sold at $62,000 plus commission of 10.00%; Final Price $68,200 – 327/360hp, 4-speed, spinner wheel covers, narrow whitewalls, WonderBar radio. – Excellent paint, top, interior, chrome and stainless. Engine compartment is like new, as is the chassis and underbody. Freshly restored and impeccable. – This is a showpiece Corvette that would be impossible to duplicate for this price even starting from a sound unrestored car. All it needs is NCRS or Bloomington Gold judging and some expert’s determination that this is original engine. Until then this modest price is appropriate for it. The consignor’s willingness to accept the bid here suggests that the reservations are well-founded. Lot # S063.1 1965 Chevrolet Corvette Convertible; S/N 194675S115994; Tuxedo Black/Red leather; Black vinyl top; Older restoration, 2- condition; With Reserve; Hammered Sold at $105,000 plus commission of 10.00%; Final Price $115,500 – 396/425hp, 4-speed, F40 performance suspension, side exhaust, centerlock alloy wheels (original wheels with wheel covers included), 4.11 rear axle. – NCRS Top Flight award winner. Paint looks excellent with a few small scratches and scuffing from the removable hardtop. Brightwork looks great other than a small chip and scratches on the driver vent window. Panel fit is very good. Engine compartment looks factory fresh. Underneath looks just as good as the rest of the car. Interior all looks new other than slight wear on the steering wheel and lightly wrinkled seats. A beautiful, showable first-year big-block. 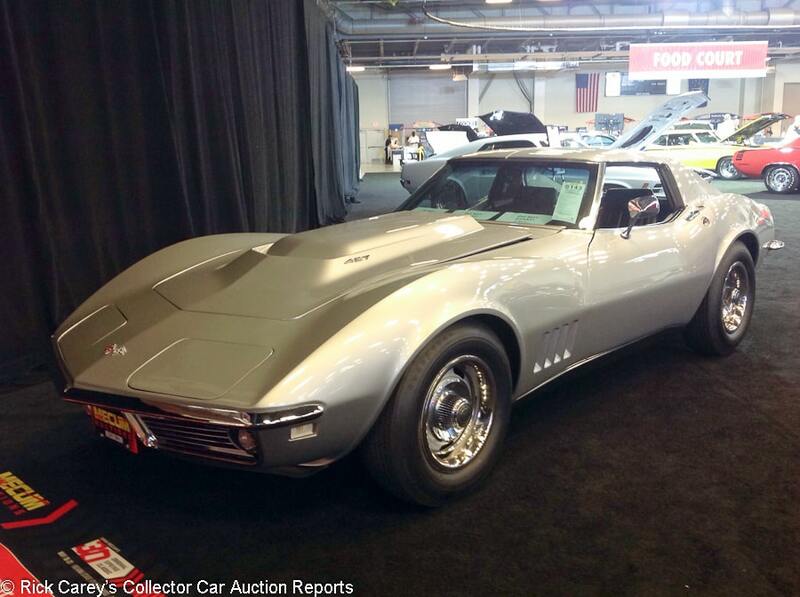 – Only 2,157 Corvette buyers stepped up for the first big block L78 and they got something quite special for their money. This nearly impeccable older Top Flight restoration is a surprisingly good value in a rare high performance Corvette roadster. 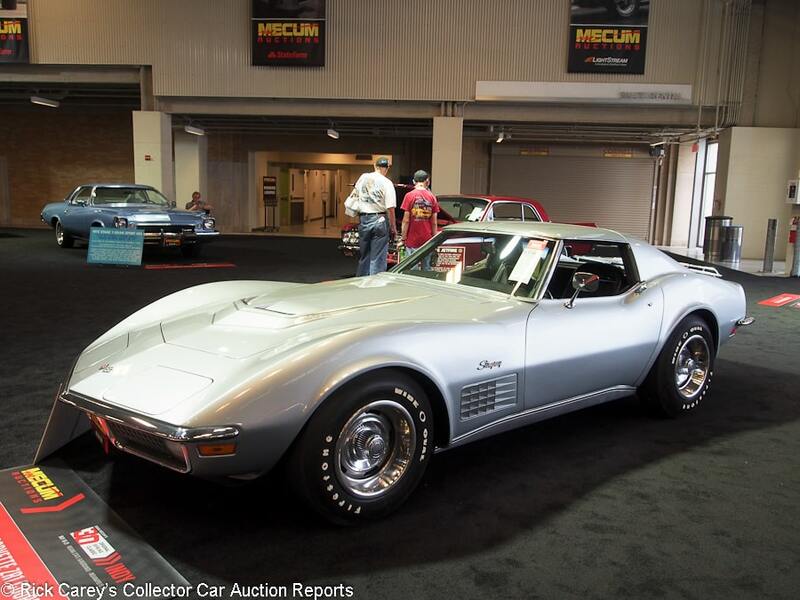 Lot # S143 1968 Chevrolet Corvette L88 Coupe; S/N 194378S417431; Silverstone Silver/Black leather; Estimate $500,000 – $700,000; Older restoration, 2- condition; With Reserve; Not sold at Hammer bid of $400,000 – 427/430hp L88, M22 4-speed, F41 Suspension, power brakes, J56 heavy duty power brakes, off road exhaust, Protect-O-Plate and original tank sticker, 4.56 Positraction, Rally wheels, teakwood steering wheel. – One of 80 L88 Corvettes in 1968 and represented with the matching numbers engine. Paint looks great other than a small paint crack on the right side of the hood and a small blister on the nose as well as another small crack at the rear of the driver’s door. Panel fit is excellent. Brightwork looks good other than minor pitting on the front bumper edge and driver’s mirror. Engine bay is very clean with some slight discoloration to the intake and valve cover edges. Underneath is very clean, showing some signs of the older restoration. The interior is claimed to be original and looks great with slight wear to the steering wheel. Bloomington Gold certified 1988. NCRS Top Flight the same year. One of 80 1968 L88s, tank sticker documented. Body-off restored in 1987. Comes with judging sheets. One of the stars of the auction. – Not sold at Mecum Kissimmee last year at a high bid of $550,000, then bid to $430,000 at Russo and Steele in Scottsdale earlier this year, both perfectly reasonable offers for a fantastic and genuine but aged L88 and one that looks genuine compared to this lowball offer in Indy. 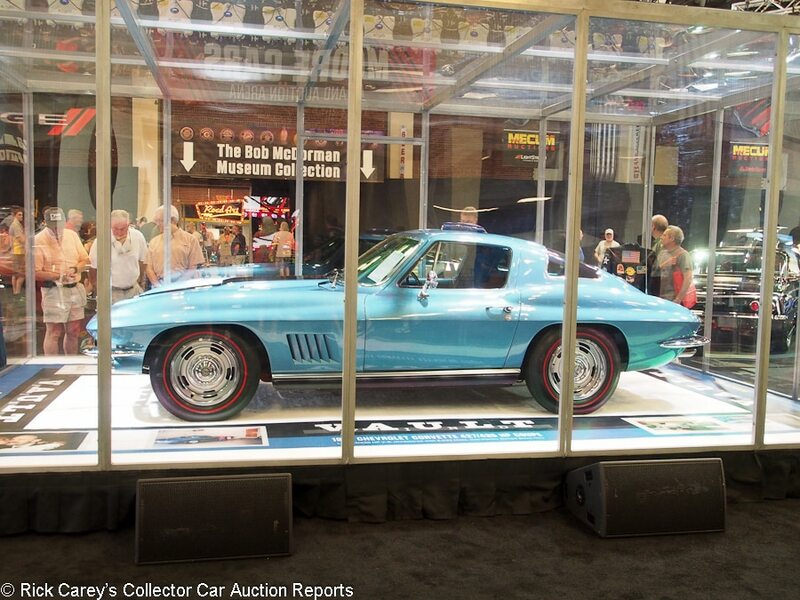 Lot # S224 1968 Chevrolet Corvette Coupe; S/N 194378S411564; LeMans Blue/Blue vinyl; Estimate $45,000 – $60,000; Unrestored original, 3 condition; With Reserve; Hammered Sold at $41,000 plus commission of 10.00%; Final Price $45,100 – 427/390hp L36 engine, M21 4-speed, 3.55 Positraction, power steering, power brakes, power windows, headrests, AM/FM radio, luggage rack, wheel covers, red line tires. 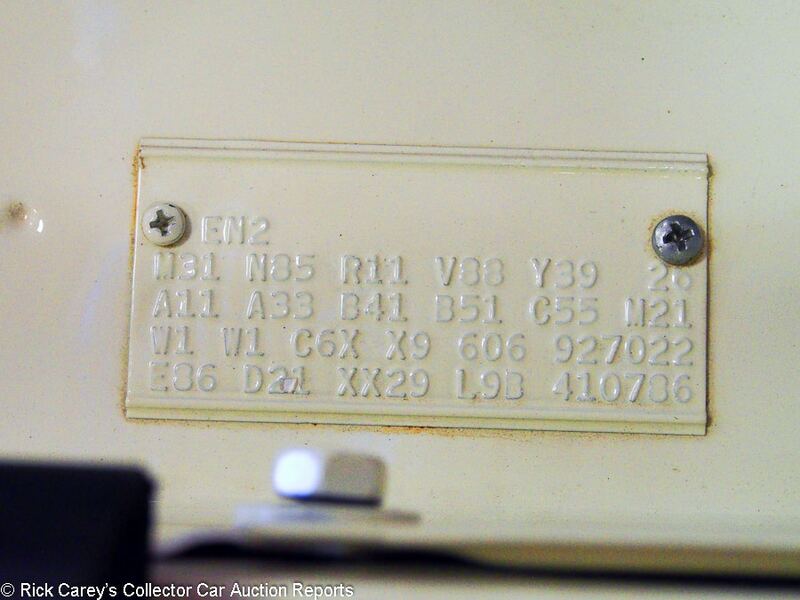 – Bloomington Gold Survivor documented with a partial tank sticker and the original sales contract. Paint is fading in blotches throughout, and there is moderate swirling. Brightwork has slight swirling. Rubber is good. Engine bay is unrestored and dirty but complete. Underside shows rust on the exhaust but nowhere else. Interior is good with the exception of a tear on the driver’s side seat back. Showing 35,744 miles which are represented as from new. A well kept and desirably equipped original survivor. – A well optioned and confirmed survivor makes a good addition to a Corvette collection and can certainly command a premium over even quite good restorations. This one was no exception, with strong but reasonable money paid for its originality rather than being challenged by its many signs of age. 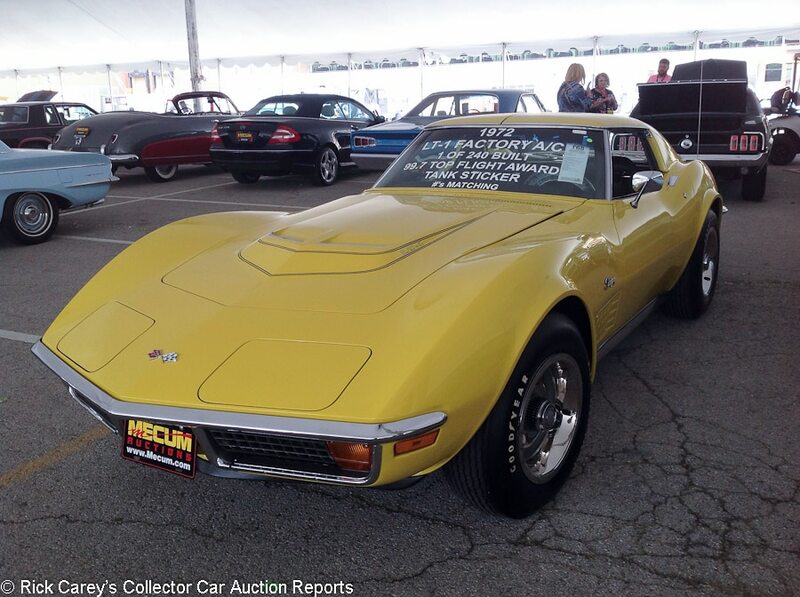 Lot # T068 1972 Chevrolet Corvette Coupe; S/N 1Z37L2S520673; Sunflower Yellow/Black leather; Older restoration, 2- condition; With Reserve; Hammered Sold at $57,000 plus commission of 10.00%; Final Price $62,700 – 350/255hp LT1 engine, 4-speed, leather seats, power steering, power brakes, power windows, tilt and telescopic steering column, AM/FM radio, Rally wheels, factory air conditioning. – Represented as matching numbers. Paint looks excellent with no blemishes. Brightwork looks excellent other than a tiny bit of pitting on the mirrors. Panel fit is very good. Engine compartment looks very good, with signs of a slight oil leak near the valve covers. Underneath looks new for the most part other than surface rust on the steering arms. Interior looks new. Weather stripping on the doors is tearing a little. A relatively rare LT1, body-on restored a while ago to high enough standards to earn it NCRS Top Flight in 2012. 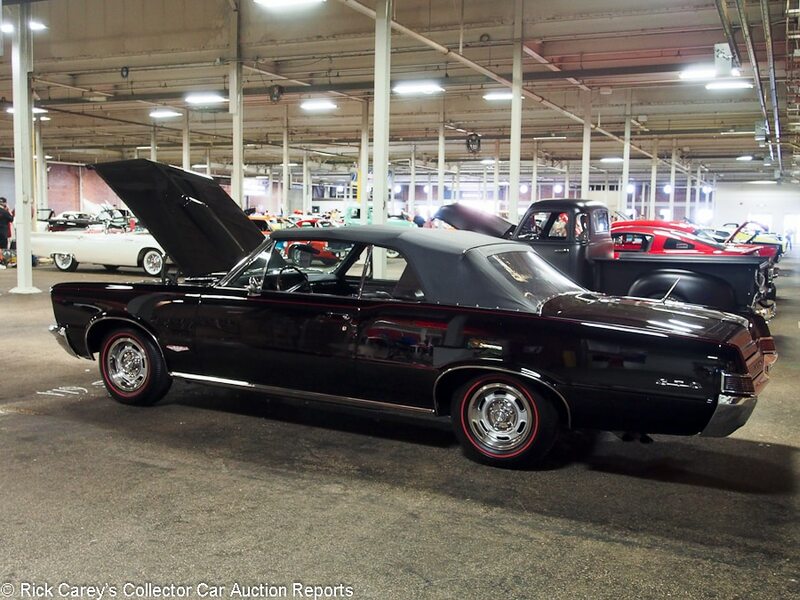 – Sold at Mecum Chicago in 2014 for $69,660. The accolades and rare specs didn’t get the bidders as enthusiastic this time around, although the reported high bid was perfectly adequate. It will take a few tries for the seller to come close to that expensive 2014 result. Lot # F214 1972 Chevrolet Corvette Coupe; S/N 1Z37K2S511163; Ontario Orange/Black vinyl; Estimate $30,000 – $40,000; Unrestored original, 3+ condition; With Reserve; Hammered Sold at $23,500 plus commission of 10.00%; Final Price $25,850 – 350/200hp, automatic transmission, air conditioning, Rally wheels, Protect-O-Plate, pushbutton radio, power steering, power brakes. – Bloomington Gold Survivor certified. Original paint has quite a few chips and touch ups and is faded a little as well. Brightwork has a lot of scratches and some pitting on the driver’s door handle. Engine bay is showing age and grime, a lot of paint peeling. Underneath there is some surface rust on the frame rails, but the exhaust looks newer. Interior is holding up very well. The driver’s door panel has a couple of small tears on the bottom. Showing 42,447 believable miles. An unremarkable base model equipment-wise, but the level of preservation is impressive. – As they say, a car is only original once. A car in this condition that has had restoration work ordinarily wouldn’t expect to crack 20 grand, but this Bloomington Gold Survivor commanded much stronger money and it deserved to. Lot # W081 1981 Chevrolet Corvette Coupe; S/N 1G1AY8766BS403857; Silver/Red leather; Visually maintained, largely original, 3+ condition; With Reserve; Hammered Sold at $14,000 plus commission of 10.00%; Final Price $15,400 – 350/190hp, automatic, power steering, power brakes, factory air conditioning, tilt/telescopic steering column, power windows, power locks, T-tops, aftermarket cassette stereo. – Paint shines very well other than touch ups and chips at the panel edges. Panel fit is very good. Engine compartment is showing age and could use some detailing. Underneath has a fair amount of oxidation. Interior looks good, but is showing some wear on the seats and steering wheel. An attractive cruiser, showing 60,955 miles that are represented as actual. – This car is better than most ’81s on the road, but the result here is on the expensive side if not quite excessive. This price point could get a lot more Corvette than this one. 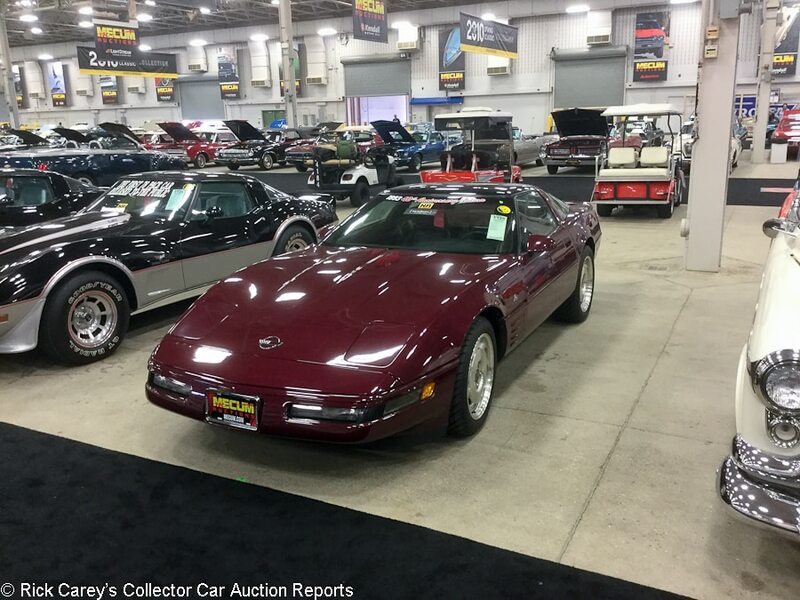 Lot # T125 1993 Chevrolet Corvette Coupe; S/N 1G1YY23P2P5119769; Ruby Red/Ruby Red leather; Estimate $20,000 – $30,000; Unrestored original, 3+ condition; No Reserve; Hammered Sold at $23,000 plus commission of 10.00%; Final Price $25,300 – 350/300hp, automatic, 40th Anniversary package, glass roof, air conditioning, power seats, cruise control, saw blade wheels. – From the Bob McDorman collection. Original paint is decent with minor swirl marks up front turning heavy by the rear. Large chip on the driver’s side rear quarter panel. Slightly dirty engine bay. Exhaust is covered in surface rust. Underside is surprisingly clear compared to the engine bay. Interior is decent but there is dust and visible wear to the seats. Represented with 3,435 miles but looks like a car with significantly more than that. – The 40th Anniversary Corvette was just a color and trim package, so they’re not quicker than a base car. Almost 7,000 of them were sold, so they’re not exactly rare, either. 40th Anniversary Vettes do command a premium, as does low mileage, but those can’t explain this excessive result, which should ordinarily buy either the best 40th Anniversary Corvette in the world or even just a decent ZR-1 from the same year. 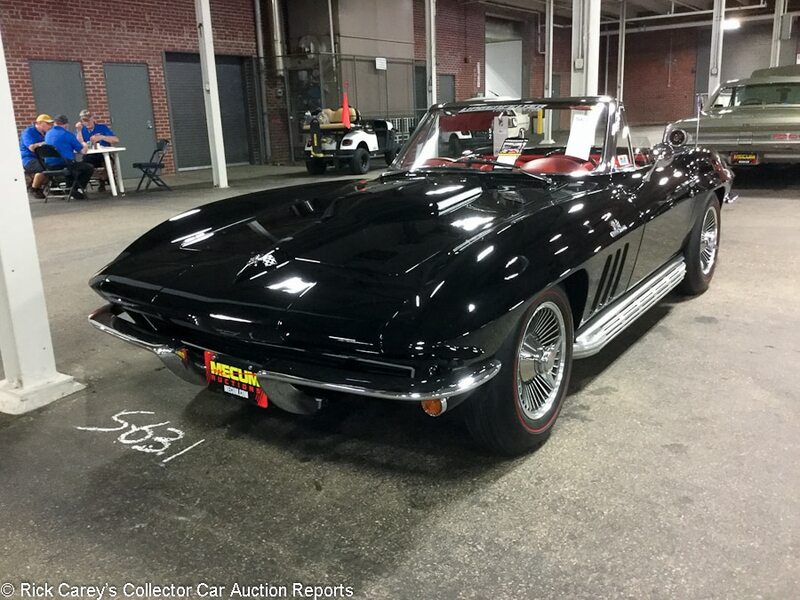 Lot # F113 1967 Chevrolet Corvette 427/435 Convertible; S/N 194677S106384; Engine # T1128JE 7106384; Black, Black hardtop, Red stinger/Black vinyl; Estimate $400,000 – $500,000; Unrestored original, 2- condition; With Reserve; Hammered Sold at $310,000 plus commission of 10.00%; Final Price $341,000 – 427/435hp, 4-speed, F41 suspension, 4.11 Positraction, AM-FM, two tops, Rally wheels with trim rings and hubcaps, Silvertown tires. – 2003 Bloomington Gold, NCRS Top Flight several times most recently in 2007. A few paint flaws and underhood chips but generally magnificently maintained and pristine with 23,849 miles from new. 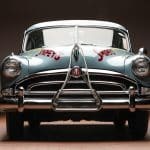 – This is a show car, meticulously maintained to keep it in Top Flight condition for ten years after it was last judged and the Indianapolis bidders paid top dollar for its rock solid documentation and condition. Lot # S111 1967 Chevrolet Corvette 427/435 Coupe; S/N 194377S103475; Marina Blue/Bright Blue vinyl; Unrestored original, 2 condition; With Reserve; Hammered Sold at $675,000 plus commission of 10.00%; Final Price $742,500 – 427/435hp, M21 4-speed, 4.11 Positraction, F41 suspension, power windows, tinted glass, telescopic steering column, AM-FM, Rally wheels – One family owned from new, 8,533 miles. Never driven in rain, always maintained, regularly started, carefully stored since the present owner’s father, Keith Richard Litavsky, bought it in 1967. Still has the original tires, paint, interior, drivetrain. Thoroughly documented, tank sticker still in place. Only the battery and mufflers have been replaced. A sure Bloomington Gold Benchmark car. – Mecum Auctions’ ability to generate excitement was nowhere better shown than with this Corvette. Displayed in Mecum’s “Vault” Plexiglass enclosure, escorted onto the block by family members and presented with deserved fanfare, it may not have been the highest-selling car of the Spring Classic, but it was surely the most hyped, and it worked, bringing a stand-alone price of nearly three-quarters of a million dollars all in. The result is all about the originality, preservation and the story that goes with the car. 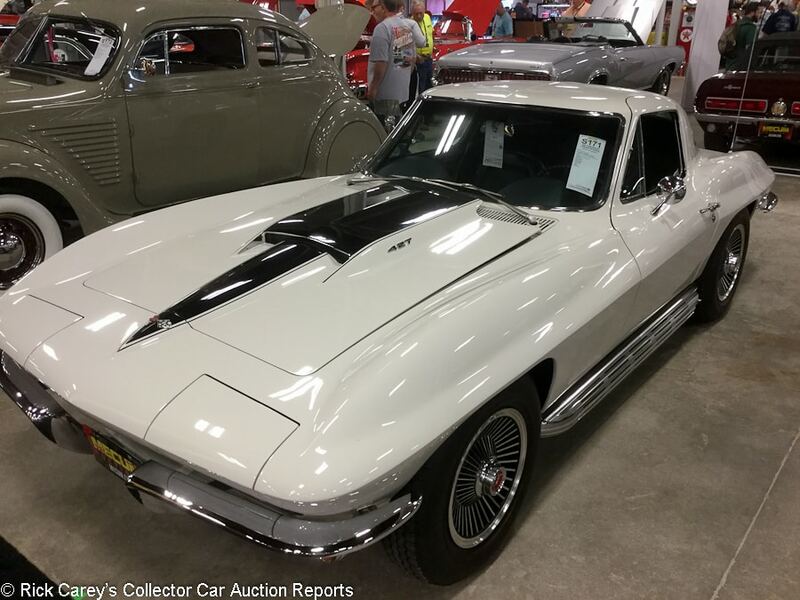 Lot # S171 1967 Chevrolet Corvette 427/435 Coupe; S/N 194377S103390; Ermine White, Black stinger/Green leather; Estimate $90,000 – $110,000; Cosmetic restoration, 2 condition; With Reserve; Hammered Sold at $75,000 plus commission of 10.00%; Final Price $82,500 – 427/435hp, 4-speed, power brakes, power windows, AM/FM radio, red line tires, side exhaust. – Represented as matching numbers. Paint is good with light longitudinal swirl marks. Brightwork is the same with light scratches. Rubber is fresh. Engine is clean and orderly, although not fully restored. Underside also looks clean but unrestored. Interior looks freshly restored and there are no noticeable faults. An attractive cosmetic restoration on top of a sound and well-optioned car, but there is nothing in the way of history or documentation represented. – No paper, not much money. The Indy bidders handicapped this Corvette like bettors evaluating horseflesh: with no remorse. The seller endorsed their evaluation by taking the bid. 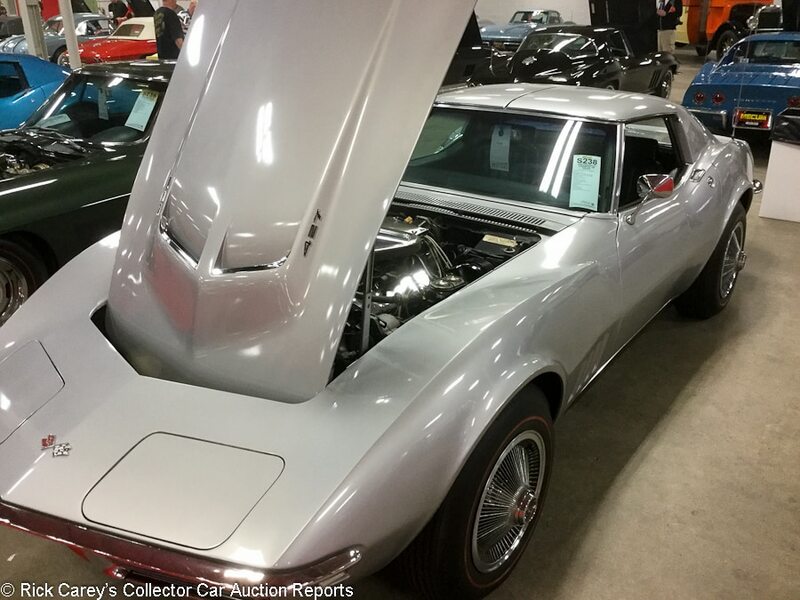 Lot # S238 1968 Chevrolet Corvette 427/435 Coupe; S/N 194378S414173; Silverstone Silver/Black vinyl; Estimate $115,000 – $145,000; Unrestored original, 2- condition; With Reserve; Not sold at Hammer bid of $90,000 – 427/435hp L89 engine with aluminum cylinder heads, 4-speed, power steering, power brakes, T-tops, wheel covers, red line tires, pushbutton radio. – Mostly original paint is faded and cracking on panel edges. Driver’s door needs alignment. The door handle also doesn’t spring back all the way. Brightwork is pitting and scratched. Rubber looks good. Engine bay is unrestored. There is no corrosion or rust but it’s dirty. Underbody is also free of corrosion but there is plenty of dirt and grime. Interior looks almost unused, but the steering wheel is missing some of its finish. Bloomington Gold Benchmark, NCRS Top Flight and MCACN winner. A solid unrestored example of the rare and desirable aluminum-head L89. – This is a pretty remarkable Corvette both in terms of its equipment and its condition, and it has the awards to back it up. Even so, it’s not always easy to stand out in an auction so chock-full of desirable Corvettes, and this one didn’t get the offer it deserved. It’s a six-figure car. 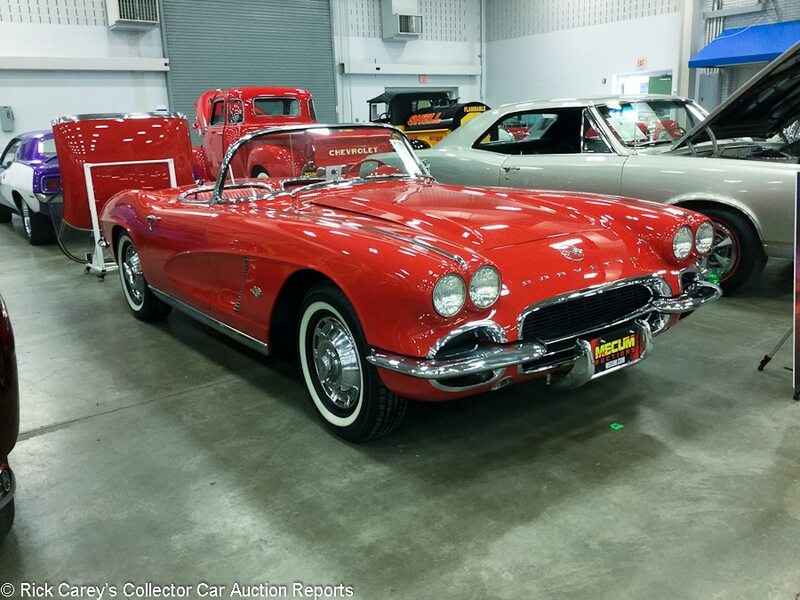 Lot # F160 1962 Chevrolet Corvette FI Big Brake Convertible; S/N 20867S111326; Roman Red/Red vinyl; Black cloth top; Older restoration, 2 condition; With Reserve; Hammered Sold at $130,000 plus commission of 10.00%; Final Price $143,000 – 327/360hp, 4-speed, WonderBar radio, heater, body color wheels, hubcaps, bias ply blackwall tires. – Very good paint except for several small blisters on top of the left front fender. Very good chrome, interior and top. The engine compartment, chassis and underbody are like new. Represented to be the matching numbers engine. – The look of a Fuelie with dog dish hubcaps and blackwalls is curiously satisfying. 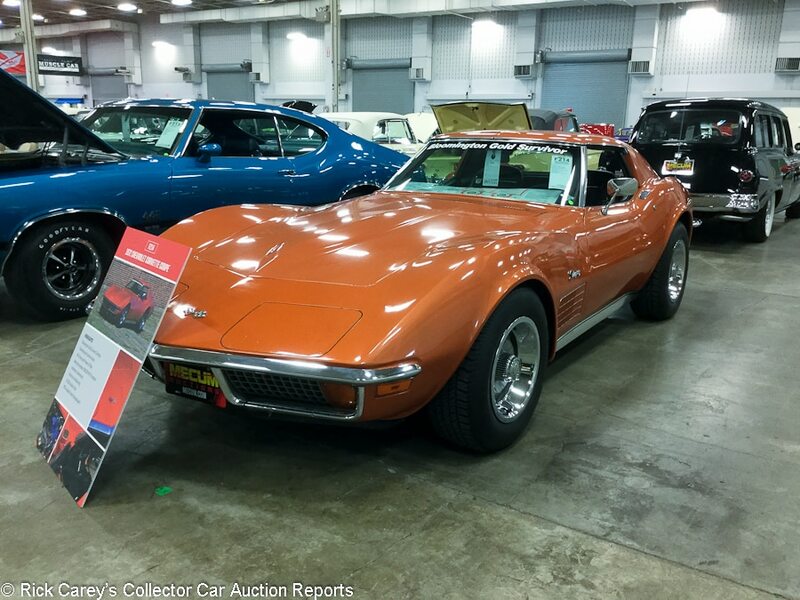 There is no shortage of superior Corvettes in Indy, 131 of them, to be precise, but the bidders recognized this one’s quality and appeal, paying a realistic price that should satisfy both the seller and the buyer. 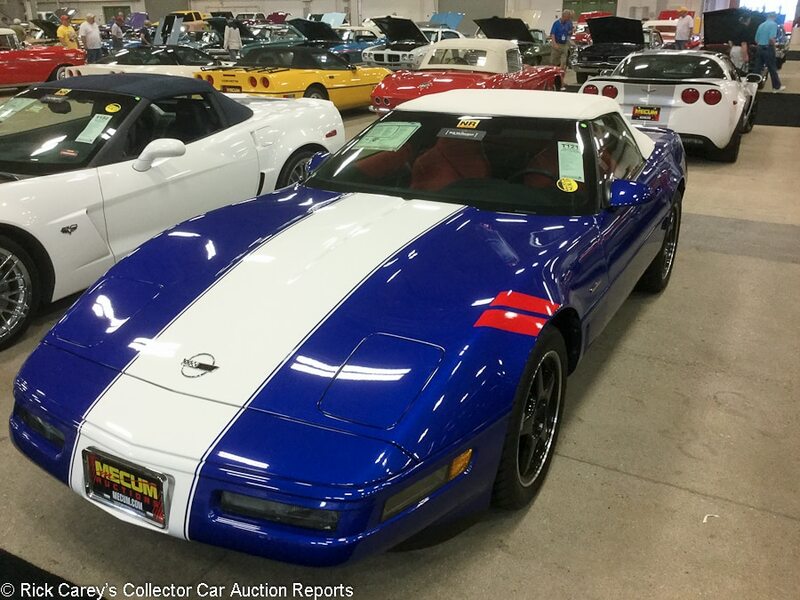 Lot # T121 1996 Chevrolet Corvette GS Convertible; S/N 1G1YY3259T5600103; Blue, White stripe, Red slashes/Red leather; White top; Estimate $50,000 – $75,000; Unrestored original, 2 condition; No Reserve; Hammered Sold at $60,000 plus commission of 10.00%; Final Price $66,000 – 350/330hp, 6-speed, power steering, Delco Bose stereo. – From the Bob McDorman collection. 88 original miles. Paint shows minor swirl marks. Rubber trim is beginning to crack. Engine bay looks like new. Underside also looks new. Interior looks like new with the exception of some color fading on the side bolster and the leather looks loose on the seats. Treated as a collectible from new. Chevrolet built 1,000 ’96 Grand Sports, and only 190 of them were convertibles. – Sold for $63,600 at Mecum Kissimmee in 2012. Bought for similarly strong but appropriate money, it’s clearly destined for static display in another collection. 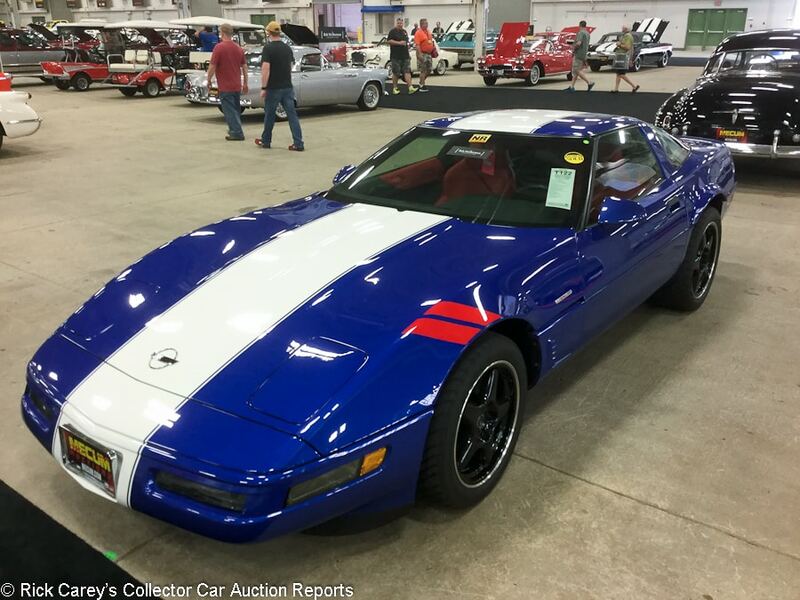 Lot # T122 1996 Chevrolet Corvette GS Coupe; S/N 1G1YY2254T5600634; Blue, White stripe, Red slashes/Red leather; Estimate $40,000 – $60,000; Unrestored original, 2 condition; No Reserve; Hammered Sold at $50,000 plus commission of 10.00%; Final Price $55,000 – Delco Bose stereo, heated mirrors, cruise control, power seats. – From the Bob McDorman collection. 531 original miles. Paint shows heavy swirl marks. Rubber trim shows indications of beginning to crack. Engine bay is very clean and looks like new. Underside also looks new. Interior looks like new with the exception of some black scuffing on the side bolster. One of 1,000 GS Corvettes built for 1996 only with 531 miles from new – Not sold at a $20,000 high bid at Kruse in 2003, then sold at Mecum Kissimmee in 2012 when these cars were finally collectible for $53,000. While several special versions of the Corvette are neither rare nor feature any extra performance, the GS enjoyed both limited production and performance bits, which has allowed them to gain more appreciation in the market along with ZR-1s as the rest of the C4 market remains relatively flat. This barely used example’s 2012 result was excessive at the time, but this one is appropriate given the condition and low miles. Lot # W140.1 1970 Chevrolet Corvette LT1 Coupe; S/N 194370S401761; Yellow/Black vinyl; Unrestored original, 3- condition; With Reserve; Hammered Sold at $32,500 plus commission of 10.00%; Final Price $35,750 – 350/370hp LT1, 4-speed, AM-FM, heater, tee tops, luggage rack, Rally wheels with hubcaps, trim rings and Eagle GTII tires. – One long ago repaint now crazing and cracking. Good original interior, fair chrome. Engine compartment and chassis are filthy. Represented as one owner, original engine, documented with the Protect-o-Plate and Corvette owner’s card, showing 50,475 believable miles. Needs a restoration but only after taking it to Bloomington Gold. – It never ceases to amaze that people will find a perfectly good and highly original Corvette and take it to auctions – as several did at Indy this week – without holding back and taking it to Bloomington Gold first. They’re leaving credibility and money on the table, and asking bidders to do an evaluation that only the most experienced (and therefore skeptical and parsimonious) Corvette experts can do on-site. With Bloomington Gold certification this could have been worth … what? … $20,000 more, but as it is, on the bet it’s original and unmolested, this is what it’s worth. 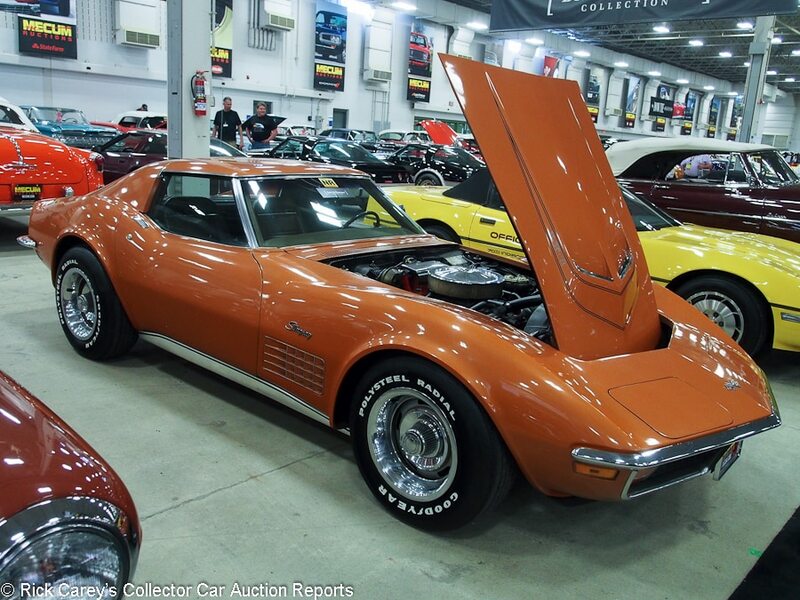 Lot # T144 1972 Chevrolet Corvette LT1 Coupe; S/N 1Z37L2S521207; Ontario Orange/Saddle leather; Estimate $35,000 – $45,000; Unrestored original, 3- condition; No Reserve; Hammered Sold at $39,000 plus commission of 10.00%; Final Price $42,900 – 355/255hp, 4-speed, power steering, power brakes, factory air conditioning, Rally-wheels with hubcaps, trim rings and Polysteel Radial tires, power windows, AM/FM, tee tops. – Crazing old repaint is generally sound but has issues. Chrome is good, leather upholstery shows age and wear but is sound and intact. The engine compartment is unrestored and dirty. It looks like the engine has never been out. – The A/C makes this a rare LT1 and that along with the originality fully justifies the price it brought here. It’s surprising it hasn’t been subjected to Bloomington Gold judging, leaving that pleasure (or pain) to the new owner. Lot # S130.1 1971 Chevrolet Corvette ZR-1 Coupe; S/N 194371S118742; Nevada Silver/Black vinyl; Estimate $250,000 – $300,000; Older restoration, 2- condition; With Reserve; Not sold at Hammer bid of $220,000 – 350/330hp LT1, 4-speed, radio delete, tee tops, Rally wheels with hubcaps and trim rings, Wide Oval tires, luggage rack. – Very good older paint, chrome and interior. Dusty from sitting but otherwise nearly like new. Documented with the original tank sticker and represented as the matching numbers original engine. One of just eight ZR1s build in 1971. – This was Zora Arkus-Duntov’s ideal for a Corvette, taking advantage of the power and light weight of the small block engine to make it both go and handle. 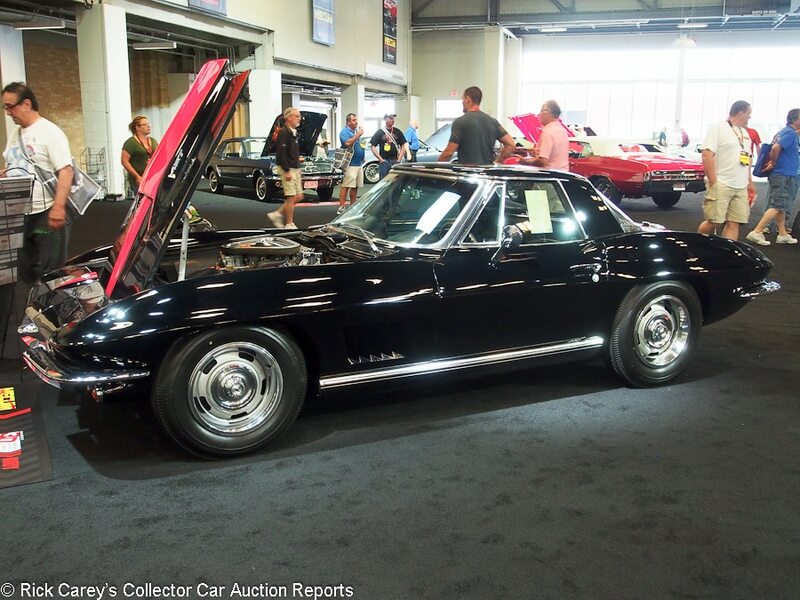 Big block Corvettes have a wide following, but high performance small blocks like this are less recognized and appeal to a niche audience of collectors that is often hard to gather together to make an auction work. In this case it came close, but no cigar. 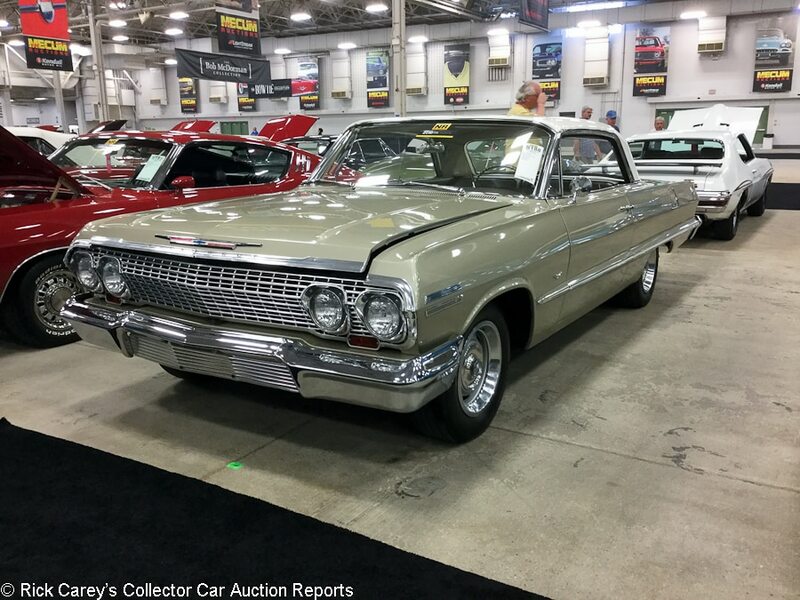 Lot # S188 1963 Chevrolet Impala 2-Dr. Hardtop; S/N 31847S230649; Autumn Gold, White roof/Fawn vinyl with cloth inserts; Estimate $20,000 – $30,000; Enthusiast restoration, 3+ condition; No Reserve; Hammered Sold at $20,000 plus commission of 10.00%; Final Price $22,000 – 283/195hp, Powerglide, aftermarket radio, Rally wheels, bench seat, column shift. – Paint looks excellent and is just about flawless. Panel fit is excellent. Most of the brightwork looks excellent other than two small dents in the trim on the hood and scratches in the rear bumper. Engine looks to have been sprayed not too long ago but the paint is beginning to peel. Underneath was partially undercoated, but there is some surface rust showing. Interior looks very good, with some wear and discoloration on the driver’s seat, and wear on the armrests. 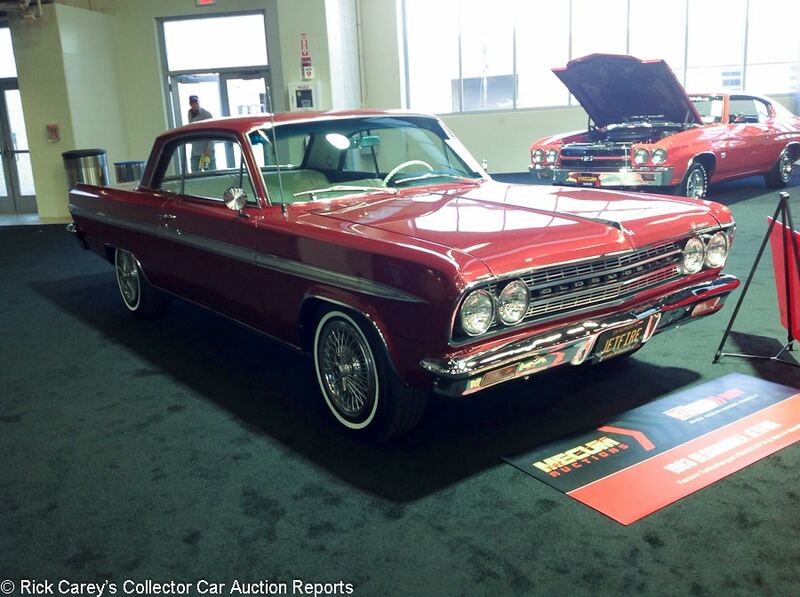 A base ’63 Impala that got enthusiast restoration-quality work that corresponds to the car’s value. – Sold at Mecum Indy in 2010 for $17,490 and has presumably been enjoyed casually since. This was a modest result that was favorable to the buyer but not a steal. 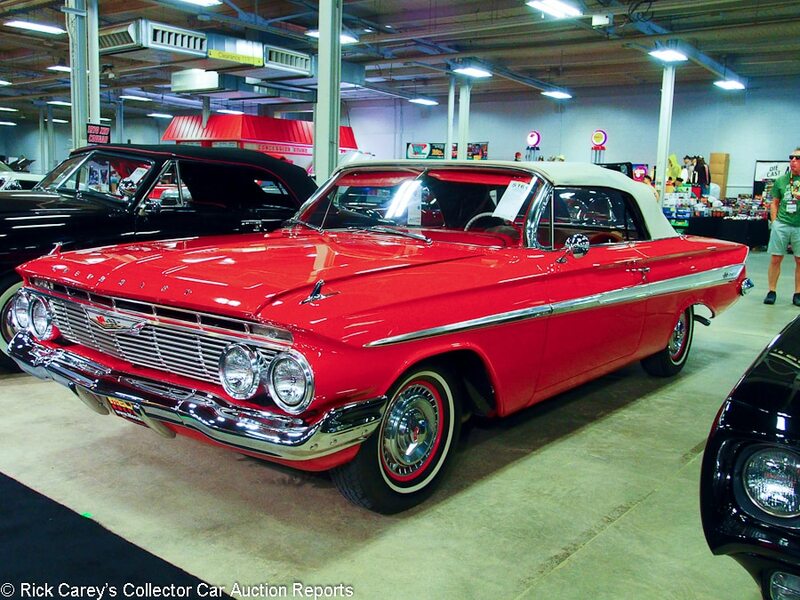 Lot # S161 1961 Chevrolet Impala Convertible; S/N 11867J117350; Engine # T1004FH; Red (923)/Red vinyl; White vinyl top; Estimate $55,000 – $75,000; Older restoration, 2- condition; With Reserve; Not sold at Hammer bid of $47,500 – 348/350hp three two-barrels, 3-speed, pushbutton radio, Sun tach, bench seat, spinner wheel covers, narrow whitewalls, Super Sport options. – Represented as the matching numbers engine and transmission. Very good paint, chrome, original interior and top. Engine compartment and underbody are restored like new and not overdone but are showing age. – No matter how it’s cut, and even at the low estimate, this is a choice Chevy with an engine that will have folks drooling over it every time the hood is opened. The restoration is holding up well, if not pristine, and it is only a matter of some attention to details to elevate it back to high quality local show condition. Some might ask, “Why a 3-speed?” There were folks back in the early Sixties who realized the power and torque curves of these engines were broad and the time it took to shift from 2nd to 3rd in a 4-speed was more than made up by leaving one shift out. It wasn’t road racing, after all. It was stoplight racing. At or even a little above the reported high bid this is a choice Chevy. 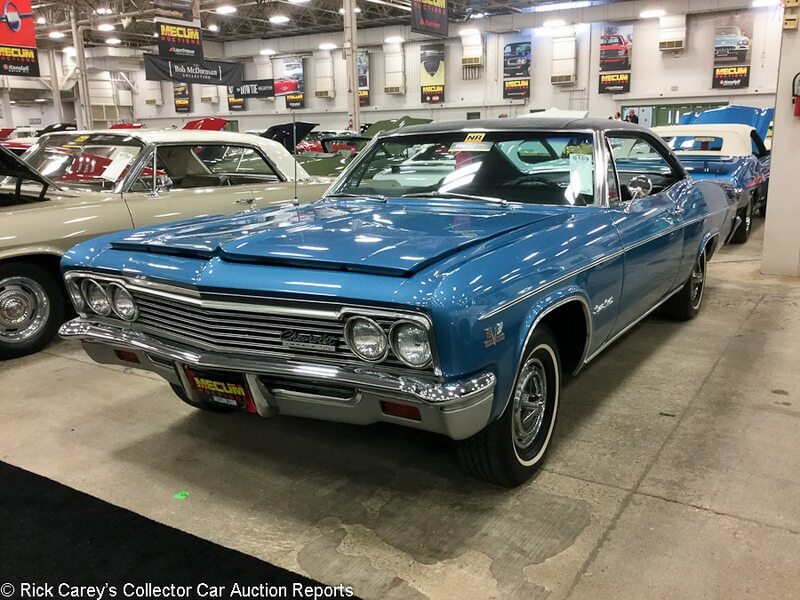 Lot # S189 1966 Chevrolet Impala SS 2-Dr. Hardtop; S/N 168376J238912; Marina Blue, Black vinyl roof/Black vinyl; Estimate $25,000 – $45,000; Modified restoration, 3+ condition; No Reserve; Hammered Sold at $28,000 plus commission of 10.00%; Final Price $30,800 – 427/390hp added, 4-speed, tachometer, power brakes, AM/FM radio, in dash clock, dual mirrors, full wheel covers, narrow whitewalls. – Paint looks beautiful with just a few tiny blemishes. Vinyl roof looks brand new. Brightwork looks very good with some small pitting on the trunk trim. Panel fit is a little uneven. Engine compartment looks complete and mostly clean, but the intake has some corrosion. Undercoating underneath looks fairly new, but the paint on the bottom of engine is chipping away pretty badly. Interior looks very good with some wear to the steering wheel and driver’s seat. Not as good as it might be, but still a marvelous tire-ripping weekend driver. – The full-size Chevys with 427 engines are largely overlooked but have their own appeal. This one isn’t what it purports to be, but it looks and probably will drive the part and at this price that’s all that’s needed. It was sold at RM’s Ft. Lauderdale auction in 2010 for $25,850 and here in Indy in 2010 for $30,210, close enough to today’s price that the only difference is in owning it. It’s flagrantly badged as a 425hp but is lacking a carburetor to match its badge. It is what it is, and at this price it will be a great weekend cruiser. 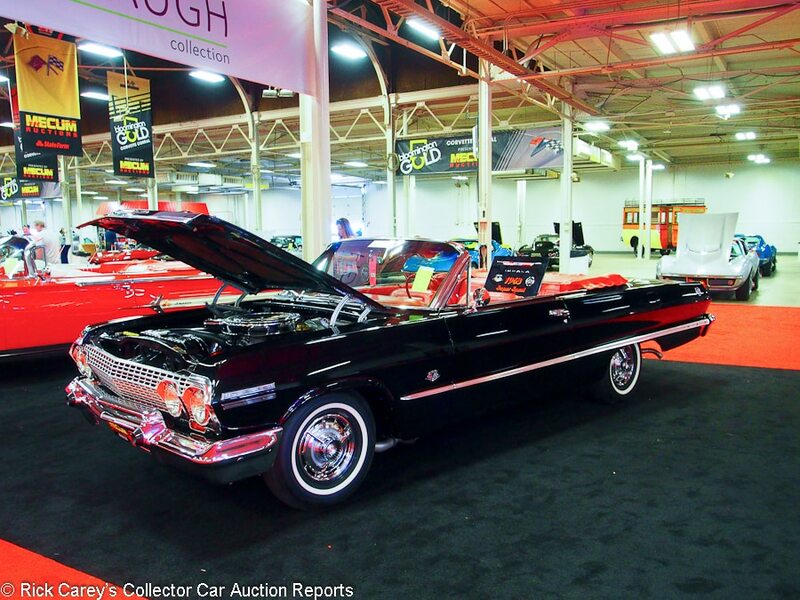 Lot # S138 1963 Chevrolet Impala SS Convertible; S/N 31867B130484; Black/Red; Black top; Estimate $80,000 – $100,000; Older restoration, 3+ condition; With Reserve; Hammered Sold at $60,000 plus commission of 10.00%; Final Price $66,000 – 409/340hp, 4-speed, power steering, power brakes, power windows, padded dash, AM-FM, auto dimming headlights, factory tach, tilt steering column, wheel covers, narrow whitewalls. – From the Dennis Albaugh collection and represented with the matching numbers engine. Paint is bright with moderate swirling. Brightwork is heavily scratched. Rubber looks new. Gaps are even. Engine compartment is very clean. Fresh paint on engine. No rust or corrosion. Underside looks new. Interior looks freshly detailed but unrestored with upholstery that is tight but discolored in places and pitting on the chrome center console. Shifter boot is coming off the shifter. Restored to reasonably high standards, but not fully done over and showing some age and use. Dennis Albaugh Collection, – This isn’t quite the “real fine 409” described by the Beach Boys, but it’s close enough to be admired even though the restoration is beginning to loosen up. It is a highly desirable car in very good condition that will reward its new owner for spending some time addressing its issues and is a good value at this price. 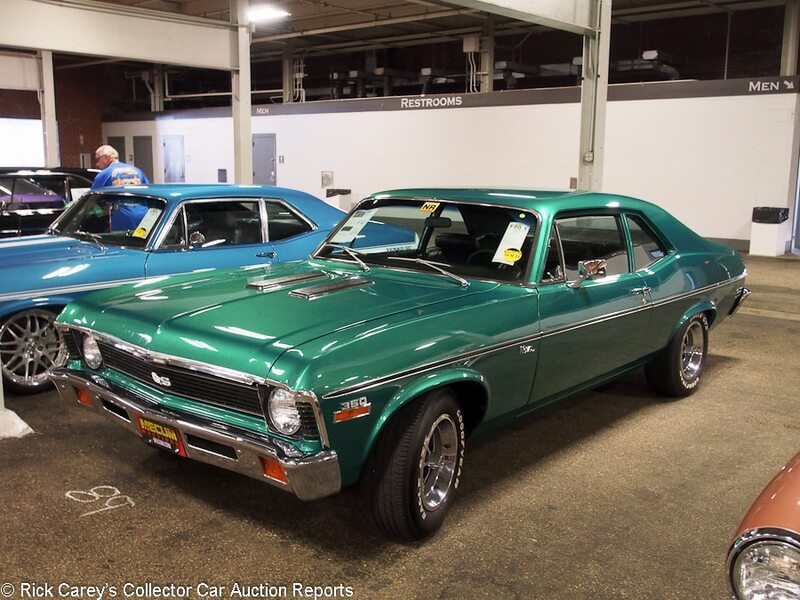 Lot # F080.1 1972 Chevrolet Nova 2-Dr. Sedan; S/N 1X27K2W342572; Spring Green/Black vinyl; Cosmetic restoration, 2- condition; No Reserve; Hammered Sold at $23,000 plus commission of 10.00%; Final Price $25,300 – 350, 4-speed, Hurst shifter, bench seat, SS wheels, Eagle GT II tires, underdash gauges, small column mounted tach, cassette stereo, 3.42 Positraction, modern stereo with CD. – Gaudy clearcoat paint, good interior and chrome. Good older underbody. Protect-o-Plate documented. Mildly customized. – The driveline has promise but in general this bright green Nova is showy and won’t go unnoticed in a crowd. A car for someone who wants to project a strong identify. 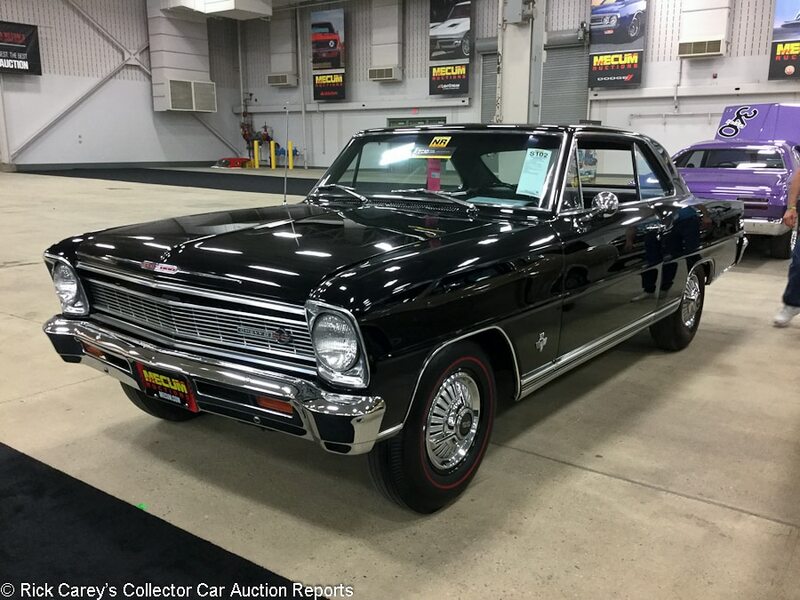 Lot # S102 1966 Chevrolet Nova SS 2-Dr. Hardtop; S/N 118376W176844; Black/Black vinyl; Estimate $60,000 – $75,000; Older restoration, 2- condition; No Reserve; Hammered Sold at $65,000 plus commission of 10.00%; Final Price $71,500 – 327/350hp, 4-speed, AM radio, dash clock, red line tires, original window sticker, full wheel covers. – Represented as the matching numbers L79. Good paint with quite a few swirls and small scratches. Brightwork is showing some age, with pitting on the wheel covers. Panel fit looks very good. Engine compartment is restored but has seen plenty of use and shows some discoloration of the intake. Underneath looks excellent. Interior looks very good. The console looks original, and there is some wear on the driver’s seat. Body-off restored, but done a while ago and showing its age and miles. – Sold here in 2010 for $57,240, this result is 25% more and is in line with other L79 Nova SSs in similarly older restored condition. 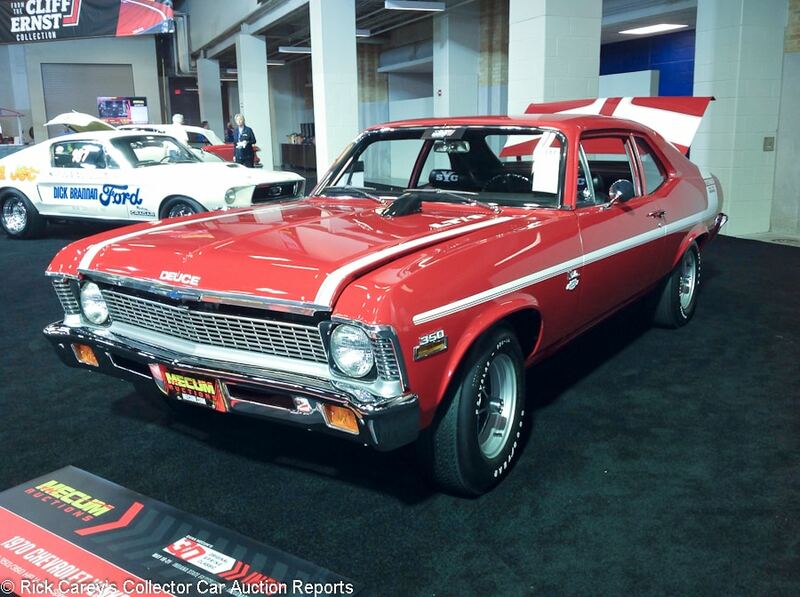 Lot # S117 1970 Chevrolet Nova Yenko Deuce 2-Dr. Hardtop; S/N 114270W368980; Cranberry Red, White stripes/Black vinyl; Estimate $135,000 – $155,000; Older restoration, 2+ condition; With Reserve; Hammered Sold at $140,000 plus commission of 10.00%; Final Price $154,000 – 350/360hp, 4-barrel, 4-speed, 12 bolt 4.10 Positraction rear end, hood tachometer, power front disc brakes, power steering, AM radio, Hurst shifter, sport suspension, Polyglas tires on SS wheels. – From the Cliff Ernst collection. Paint looks good other than some cracking on the cowl panel and fish eyes in the trunk. Panel fit is very good. Brightwork looks excellent. Engine compartment looks very good other than some discoloring to the intake. Underneath looks new and spotless. Interior looks excellent with only a small tear on the bottom of the driver’s door panel. A beautiful car ready to show. Fully restored and showing light signs of use, but still certainly eye-catching and presentable, plus it’s a genuine Yenko Deuce, one of just 175 made in 1970. – Like the Yenko Camaro sold from the same collection just before this there is no representation of the source of the engine and driveline, just that it was built as a Yenko Deuce. It is so rare and desirable, however, that the bidders didn’t seem to care and based on condition and performance alone it is impossible to dispute their conclusion. 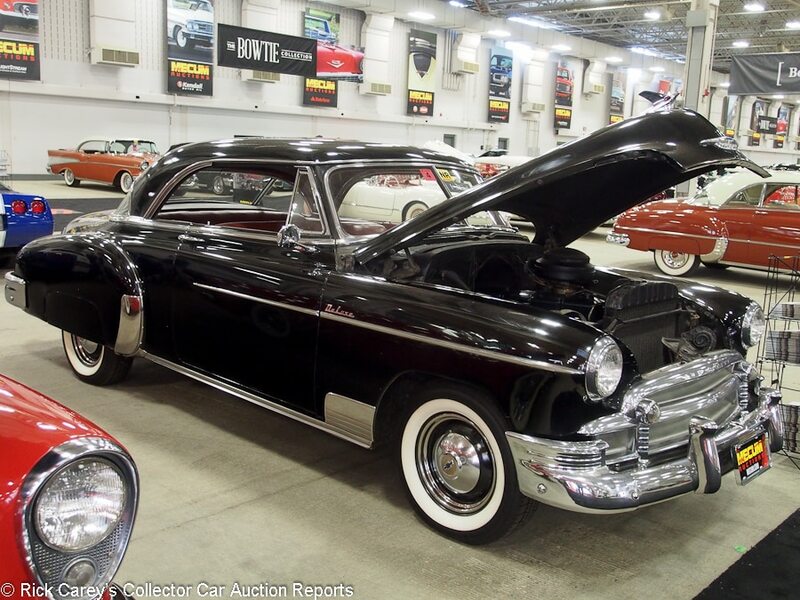 Lot # T142 1950 Chevrolet Styleline Deluxe 2-Dr. Hardtop Bel Air; S/N 14HKJ175610; Black/Burgundy vinyl, Beige cloth; Visually maintained, largely original, 3- condition; No Reserve; Hammered Sold at $27,000 plus commission of 10.00%; Final Price $29,700 – 3-speed, heater, no radio, hubcaps, trim rings, wide whitewalls, oil filter, grille guard. – Mediocre old paint, good interior, decent chrome, crazed steering wheel center. Old, cracked body seals. Doors close well. The engine has been out and done, then put back in the scruffy hole it came out of. A sound driver quality example of the Bel Air hardtop’s first year. – This result is enough to buy a much better Bel Air, by nearly double. Lot # T172 1949 Chevrolet Styleline Deluxe 2-Dr. Sedan; S/N 6GKG56028; Maroon/Beige cloth; Unrestored original, 3- condition; No Reserve; Hammered Sold at $12,000 plus commission of 10.00%; Final Price $13,200 – 216 Stovebolt six, 3-speed, dual Rochester carbs on a McGurn manifold, split exhaust manifold, dual dummy spotlights, skirts, flipper wheel covers, wide whitewalls. – Dull old repaint with chips, scratches and pinstriping signed by Ed “Big Daddy” Roth. There also is an original Rat Fink on the glove box door. Dull chrome, sound upholstery, dirty old engine compartment and underbody. A car of little consequence … except for Big Daddy’s embellishment. 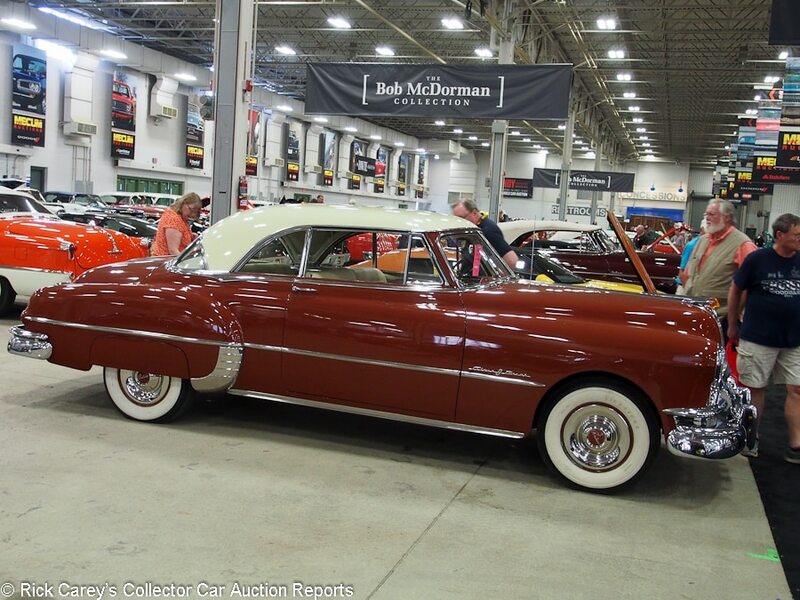 – Earlier today several early 50’s Chevys of little or no distinction sold near or above $30,000. This is a sound car with appropriate period speed equipment and authentic Ed “Big Daddy” Roth pinstriping, and it sold for peanuts. It is incongruous, but the new owner should be proud of the car, the artwork and the modest price paid for it. 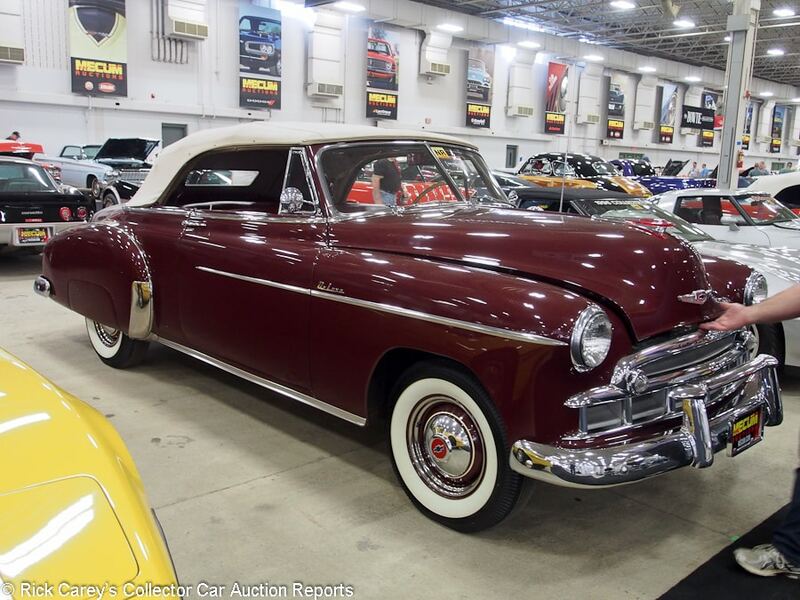 Lot # T145.1 1949 Chevrolet Styleline Deluxe Convertible; S/N 14GKH59428; Regal Maroon/Maroon vinyl, Beige cloth; Beige cloth top; Estimate $30,000 – $40,000; Cosmetic restoration, 3 condition; No Reserve; Hammered Sold at $31,000 plus commission of 10.00%; Final Price $34,100 – 3-speed, turn signals, remote spotlight, pushbutton radio, skirts, cigarette lighter, hubcaps, trim rings, wide whitewalls, grille guard, power top. – Decent older repaint, top, chrome and interior. The engine compartment is orderly but old and never fully restored. Good steering wheel, dash and gauges. A good driver. – Remarkably, in 1949 Chevrolet built over 32,000 Styline Deluxe Convertibles. Few have survived, which may explain why this aged and used but sound example brought this much money. The result is generous, but not excessively so. 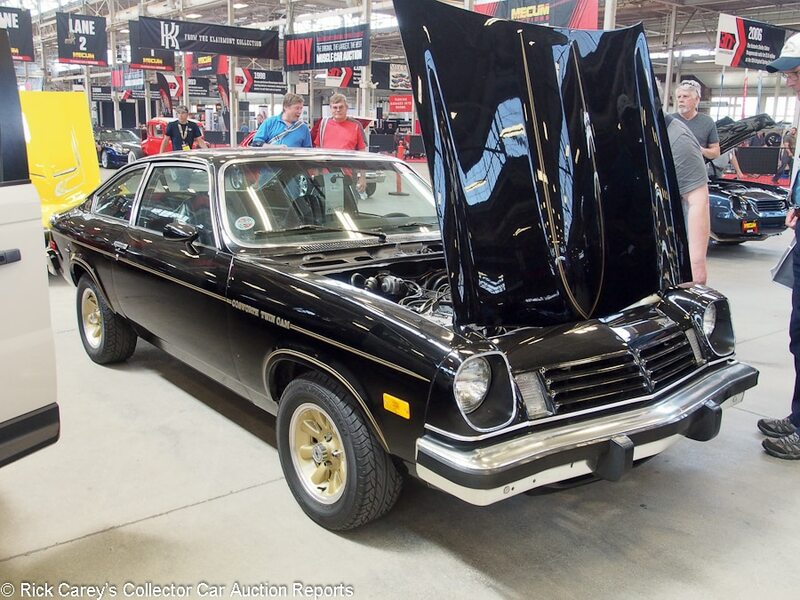 Lot # W127 1975 Chevrolet Vega Cosworth Coupe; S/N 1V77E5U224499; Black, Gold/Black vinyl; Visually maintained, largely original, 2- condition; With Reserve; Not sold at Hammer bid of $12,000 – AM/FM radio, stainless steel headers, gold wheels, tinted glass, bucket seats. – Paint is good with a few minor scratches and some swirl marks. Panel fit is very good. Brightwork is showing some age and pitting. Engine compartment is very clean with only minor signs of wear. Underneath is very clean with factory undercoating. Interior is very good. Some wear to the carpet. Weather stripping on the doors is dry and should be replaced. A mostly original car with an older repaint. Showing 56,520 miles, which are claimed to be from new. – Sold for $22,550 at Mecum Kissimmee one year and eight miles ago. That was an excessive result then, and although prices have shot up a bit since, it is still expensive today. The reported high bid here is much more in line with what the car is actually worth. Over the years GM has done a number of really innovative, forward-thinking cars and the Cosworth Vega is one of them. None of them amounted to anything significant except Corvette and a collection of GM’s forward-thinking ideas could be assembled with a hundred thousand dollars or less. But for the fact that the someone paid far too much at Kissimmee last year the high bid here could have been taken. 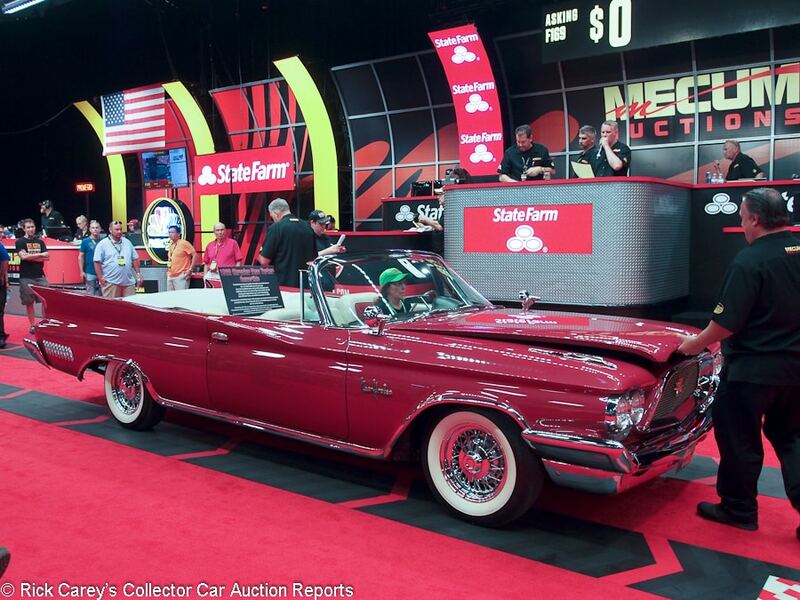 Lot # F169 1960 Chrysler New Yorker Convertible; S/N 8303117389; Plum/Red, Cream vinyl; White vinyl top; Older restoration, 2- condition; With Reserve; Hammered Sold at $77,000 plus commission of 10.00%; Final Price $84,700 – 413/350hp, automatic, power steering, brakes and windows, chrome wire wheels, wide whitewalls, air conditioning, remote outside mirrors, swivel split bench seat. – Beautiful paint and chrome, very good interior. Engine compartment was restored like new but now is showing some age, as is the underbody, This is a 300F caliber restoration of a New Yorker – Sold at Barrett-Jackson WestWorld in 2008 for exactly the same price and every bit as good now as it was in 2002 when RM offered it in Arizona. Lot # G082 1956 Citroen 2CV 4-Dr. Sedan; S/N 303308; Blue/Blue plaid; White cloth top; Visually maintained, largely original, 3- condition; With Reserve; Hammered Sold at $7,500 plus commission of 10.00%; Final Price $8,250 – Grey steel wheels, Michelin X tires, folding full length soft roof. – Poor old repaint in several shades. Won and faded original seat coverings The inside of the folding roof is black with mildew. Loose, wobbly front seats. Tired but lovable. – Barrett-Jackson sold this Deux Chevaux at Las Vegas in 2012 for $13,750. 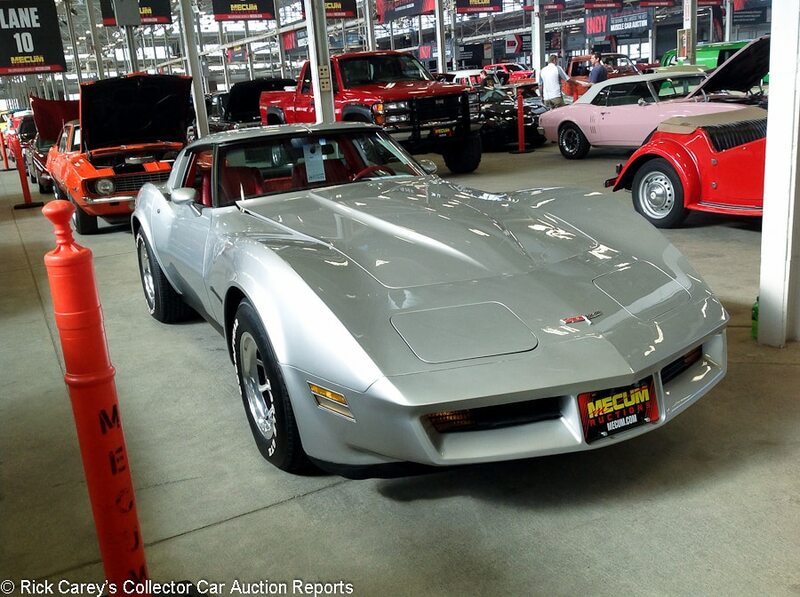 Eleven months later Auctions America sold it at Burbank for $22,000. Offered from the Larry Klairmont collection, it probably has done nothing but sit around and gather dust since then, and looks the part. The bidders didn’t get excited about it and this is actually a reasonably strong price for its condition. 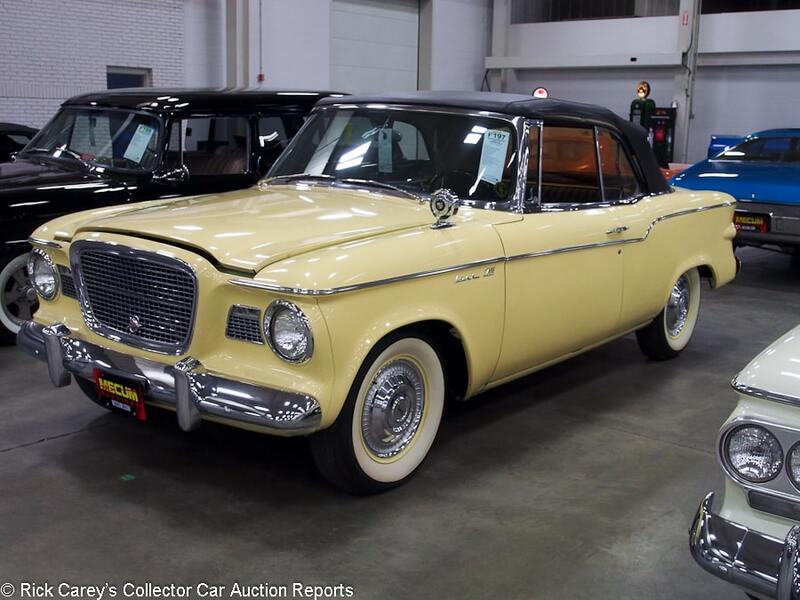 Lot # W043 1962 Daimler Majestic Limousine, Body by Hooper; S/N 1M20085; Black/Beige vinyl; Visually maintained, largely original, 3- condition; With Reserve; Hammered Sold at $15,000 plus commission of 10.00%; Final Price $16,500 – 4.2 liter six, automatic, body color wheels with trim rings and hubcaps, fender mirrors, power division window, drinks cabinet, power 4-wheel disc brakes, steering and windows, air conditioning. – Quick old repaint that didn’t bother with filling the holes for the missing outside mirror. Good replaced upholstery and cloth interior trim. The paint is cracked below the left windshield post and right rear roof corner. The engine compartment and underbody are orderly and original. Weak, pimpled cast trim chrome, but good major chrome. Pretty nasty. – A post-block sale at Ft. Lauderdale in April for $13,500 and brought a surprising price here in Indy. Next time you call for an Uber this Daimler might show up. 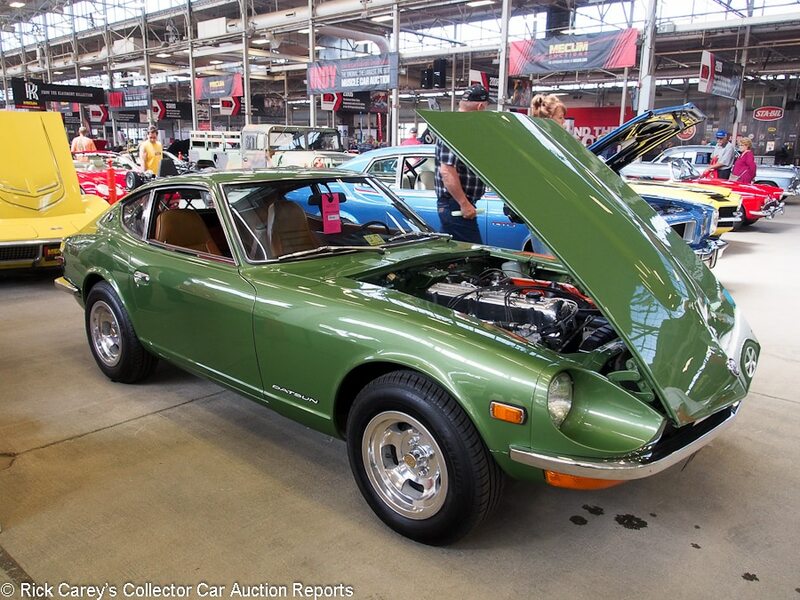 Lot # W140 1972 Datsun 240Z Coupe; S/N HLS3066477; Metallic Medium Green/Tan leatherette; Visually maintained, largely original, 3+ condition; With Reserve; Not sold at Hammer bid of $24,000 – Polished alloy wheels, aftermarket CD stereo, polished cam cover, factory air conditioning. – Sound body with no appreciable filler. Orderly but not restored engine compartment. Good upholstery. Repainted assembled with masking misses here and there. Decent chrome. A presentable cosmetic restoration. – Rerun later as F301 and reported sold for $25,000 hammer after being sold at Kissimmee in January for $24,200 all-in, a consistent record of value in a variety of venues. 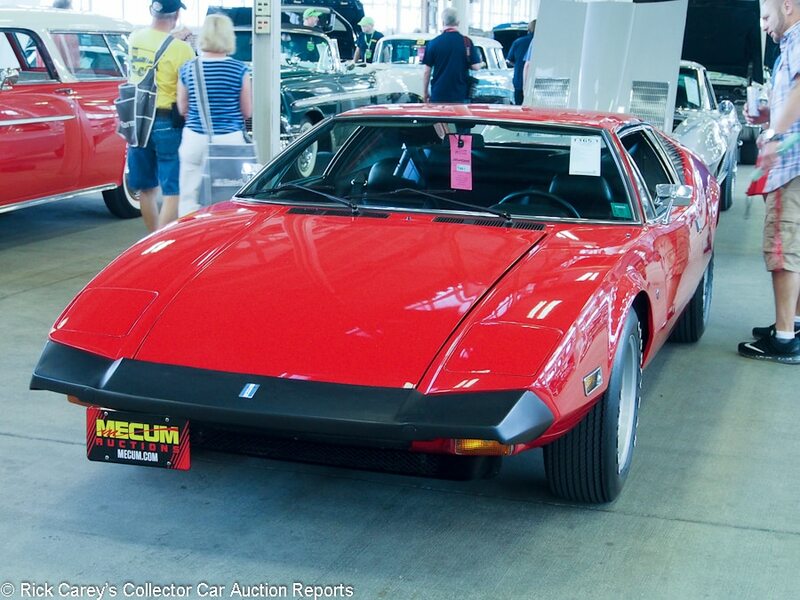 Lot # T165.1 1974 De Tomaso Pantera Coupe; S/N THPNPU07350; Red/Black vinyl; Estimate $100,000 – $125,000; Unrestored original, 2 condition; With Reserve; Hammered Sold at $105,000 plus commission of 10.00%; Final Price $115,500 – 351/266hp, 5-speed, Campagnolo wheels, Goodyear tires, AM/FM radio, power windows, window sticker documented. – Represented as unrestored with original paint and as a two-owner car. Front bumper is dull. Original paint is sound and presentable but aged. Fantastic interior. Showing 10,942 believable miles. A remarkably well preserved, unmolested later Pantera. – Sold at Mecum’s Portland auction last June for $110,000, at Monterey and Kissimmee it was bid to $100,000, at Houston a month ago the reported bid was $110,000. After a year trying to get out from under an optimistically priced acquisition the seller took the money on offer in Indianapolis and got out after sustaining only a moderate loss. Lot # T217 1960 DeSoto Adventurer 2-Dr. Hardtop; S/N 7203122664; Black, White roof/Silver, White vinyl, Black cloth; Estimate $35,000 – $45,000; Older restoration, 3- condition; With Reserve; Hammered Sold at $28,000 plus commission of 10.00%; Final Price $30,800 – 383/325hp, 4-barrel, pushbutton automatic, power steering, power brakes, pushbutton radio, wheel covers, whitewalls, dual rear antennas, dual outside mirrors, bench seat. – Restored long ago to the standards of the time and on its way to another restoration. The paint, chrome, interior, engine compartment and chassis are all sound, they’re just old and neglected. It is a neat and rare car in need of a caring home. – Fully priced for what it is, but a rare and visually distinctive car from the penultimate year for DeSoto and a statement in finned elegance. 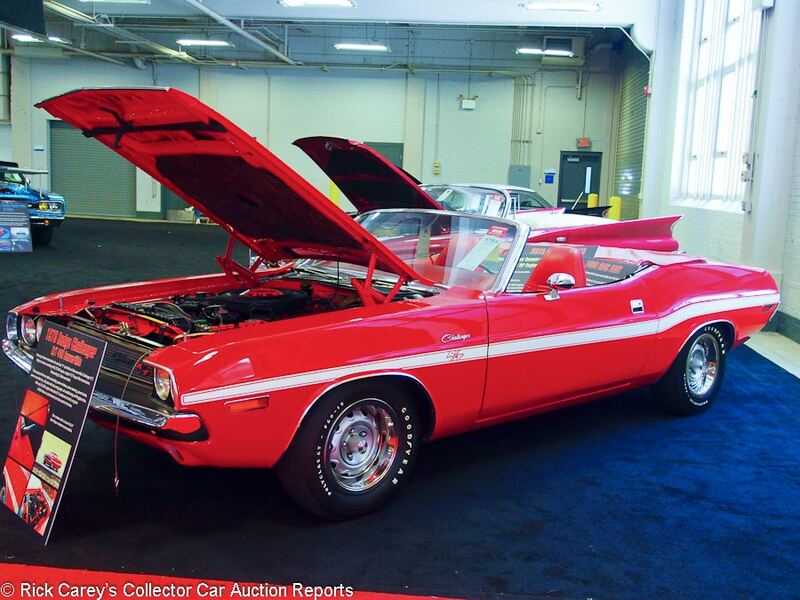 Lot # S164 1970 Dodge Challenger R/T Convertible; S/N JS27U0B218251; Red/Red vinyl; White vinyl top; Estimate $100,000 – $125,000; Recent restoration, 2+ condition; With Reserve; Hammered Sold at $105,000 plus commission of 10.00%; Final Price $115,500 – 440/375hp Magnum, automatic, air conditioning, power steering and brakes, woodgrain steering wheel, power windows, AM-FM, hood pins, dual chrome outside mirrors, Rallye wheels, trim rings, Polyglas GT tires. – Possibly a promotional car used on the Bob Hope show, restored to showroom condition but for a little storage dust underneath. – Weighted down with options, the performance of this 440 Magnum is majestic at best, but still a car that can be enjoyed and appreciated in the more mellow environment of collector car cruises and tours. Put the top down on a fine day, then put up the top, raise the power windows and turn on the A/C for the drive back home in rain and cold. Today’s collectors think in terms of today’s cars with power assists and climate control for every circumstance and this is a viable and correctly presented alternative to an expensive Resto-Mod bought at a realistic price. 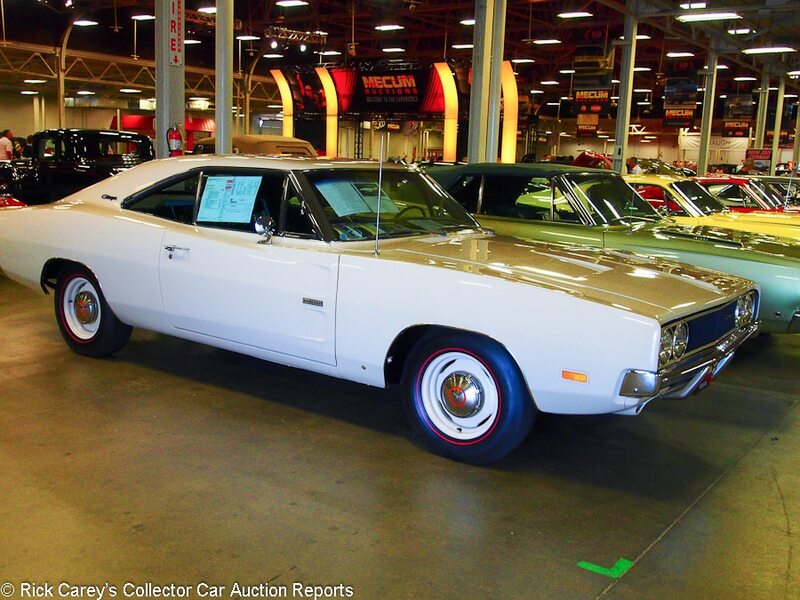 Lot # S110.1 1969 Dodge Charger 500 Hemi 2-Dr. Hardtop; S/N XX29J9B248656; White, Black tail band/Black vinyl; Estimate $160,000 – $180,000; Older restoration, 2- condition; With Reserve; Not sold at Hammer bid of $120,000 – 426/425hp Hemi, dual quads, automatic, buckets and console, indash 8-track, power steering, power front disc brakes, power windows, 6-way adjustable seat, rear defogger, body color wheels, hubcaps, red line tires. – Represented as one of 392 Charger 500 Hemi coupes. In the Wellborn Musclecar Museum since 2004. Featured in a 2005 article in Muscle Car Review. Good old paint with some cracking on the drip rails. The brightwork is excellent throughout. The engine compartment shows minimal aging as does the underbody. The interior has been well kept since the restoration. An old restoration that has been exceptionally well kept. – To say it is unusual to find a Hemi Charger with a laundry list of options is a major understatement and this was a car obviously not bought to lay thick streaks of rubber down a dragstrip. When it appeared (with no result reported) at Auburn in 2000 it showed 43,850 miles and today is has just 399 mile, some of it accumulated at Kissimmee in 2015 where it sold for $145,800, B-J Palm Beach three months later where it sold for $165,000 and B-J WestWorld earlier this year where it brought just $101,200. It was a huge value then, and its condition and performance make it understandable why the consignor would expect to find it bringing a little more. 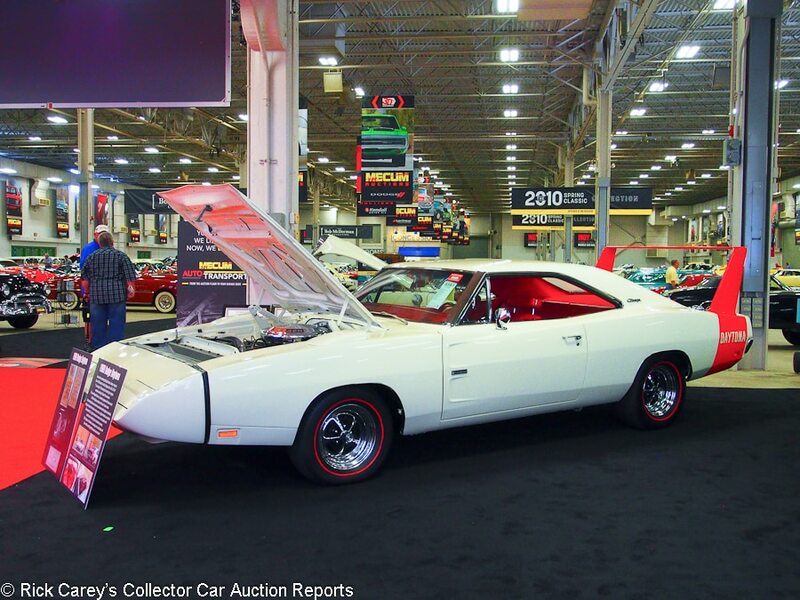 Lot # S163 1969 Dodge Charger Daytona 2-Dr. Hardtop; S/N XX29L9B410786; Snow White (W1), Orange tail band/Red vinyl; Modified restoration, 2+ condition; With Reserve; Hammered Sold at $225,000 plus commission of 10.00%; Final Price $247,500 – 440/375hp Magnum now with a date code correct 426 Hemi with dual quads, 4-speed, power steering and brakes, Hurst shifter, pushbutton radio, bucket seats, no console, styled wheels, red line tires. – Concours quality paint, chrome and interior. The engine compartment and underbody are like new, gauges are crisp and clear. The stainless brightwork is brilliant. Even the nose cone fit is excellent. It is above reproach, except it isn’t what it wants to be. – It is almost sacrilegious that a “date code correct” Hemi was used to fluff up this Charger Daytona when an original Hemi Daytona could use that engine at least to make it right. The price is appropriate for what it is. 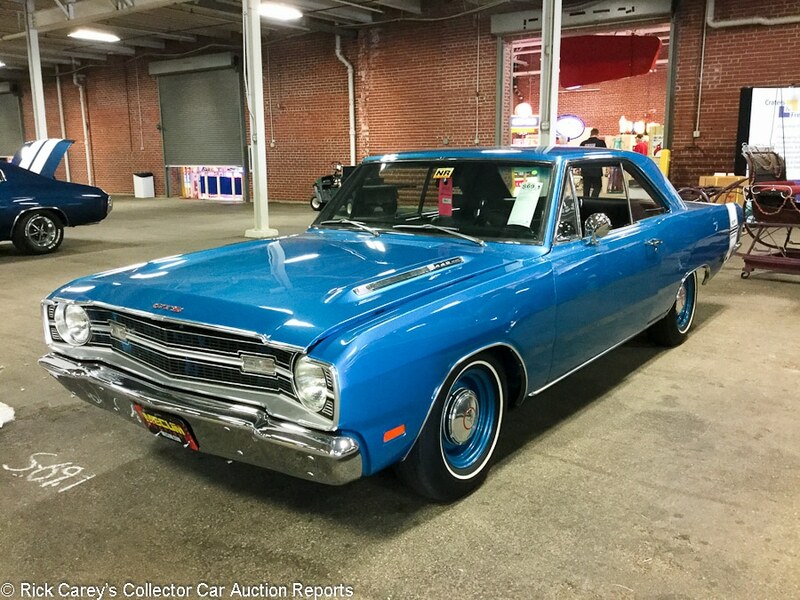 Lot # S069.1 1969 Dodge Dart GTS 2-Dr. Hardtop; S/N LS23M9B300679; Blue, White stripe/Black vinyl; Recent restoration, 2+ condition; No Reserve; Hammered Sold at $55,000 plus commission of 10.00%; Final Price $60,500 – 440/375hp Magnum engine, automatic, original broadcast sheet, radio delete, dog dish hub caps, whitewalls. – Represented as matching numbers with the rare 440 cid engine, reportedly one of 640 cars so equipped. Paint looks excellent with next to no flaws. Panel fit is very good. Brightwork is very good other than some pitting and dings on the rear sail panel. Engine compartment is very clean with no signs of use or wear. Underneath is as clean as it would have left the factory. Interior is excellent. Everything looks new. Fully restored in 2014 to remarkably high standards and still looking fresh. – Oddly, the “M” in the VIN indicates the 440 should have a Six Pack intake, but there’s only a 4-barrel Magnum under the hood. Either way it’s highly unusual and should be extremely fast. The combination of rarity and a quality restoration makes it a sound value at this result. 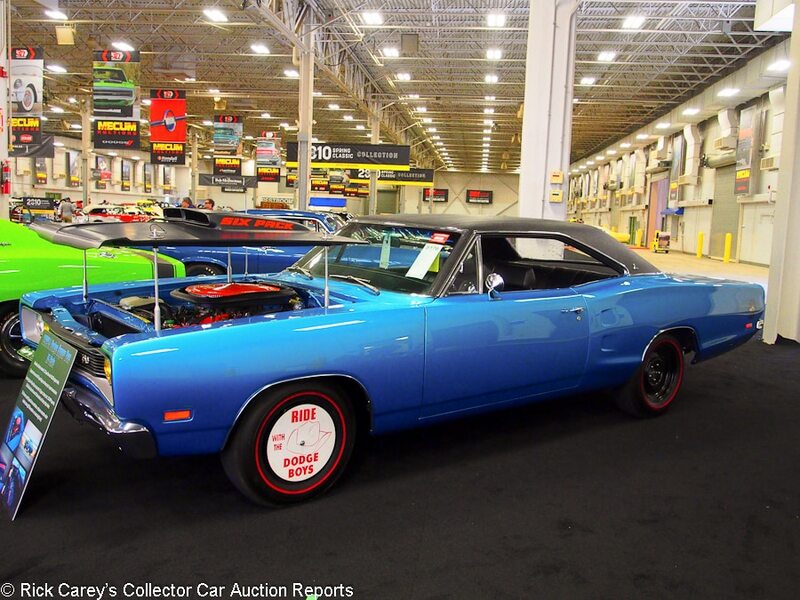 Lot # S170 1969 Dodge Super Bee 2-Dr. Hardtop; S/N WM23M9A301760; Blue, Matte Black hood, Black vinyl roof/Black vinyl; Estimate $85,000 – $115,000; Recent restoration, 2+ condition; With Reserve; Hammered Sold at $75,000 plus commission of 10.00%; Final Price $82,500 – 440/390hp Six Pack, 4-speed, 4.1 Sure Grip, lift off fiberglass hood, manual brakes and steering, pushbutton radio, black steel wheels, red line tires. – Represented as a date code correct engine. Restored like new with show quality cosmetics and no detail overlooked. Bright, crisp gauges. Fresh interior, good panel fits and gaps. – The Super Bee was conceived as a bare-bones stripped straight line performance car, with a little bit of visual identity for corporate positioning purposes. This is everything that “Super Bee” intended, with nothing to detract from its performance or weight it down except the radio. It is a purist’s choice, not something that will be happily driven by those who don’t remember cranking on a manual steering wheel through multiple turns or leaning on the brakes to make them work. It’s limitations in drivability are reflected in the appropriate price it brought, as well as the replacement engine. 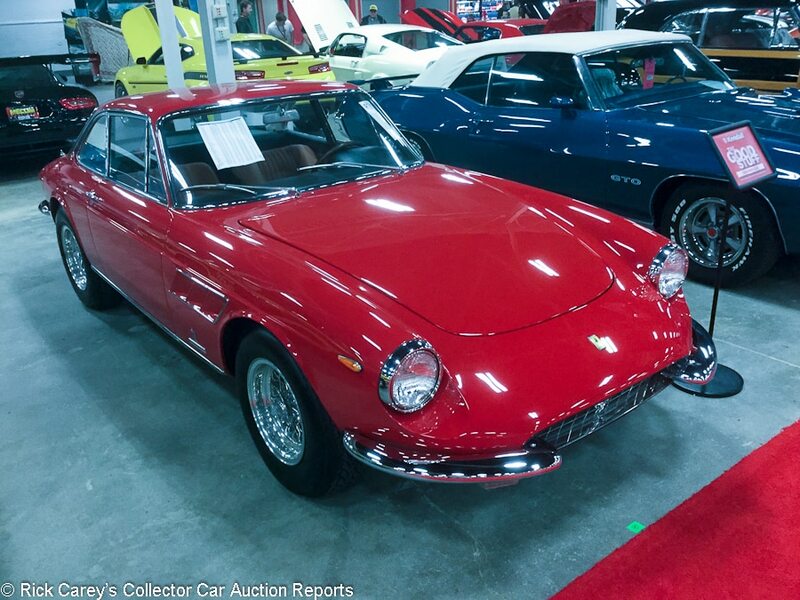 Lot # S181 1967 Ferrari 330 GTC Coupe; S/N 9955; Red/Tan leather; Estimate $550,000 – $675,000; Visually maintained, largely original, 2- condition; With Reserve; Not sold at Hammer bid of $575,000 – Factory air conditioning, power windows, Borrani wire wheels, Michelin XWX tires, tool kit, woodrim steering wheel, Becker Europa stereo, Ansa exhaust. – Excellent two year old upholstery. The rest of the interior is very good and without major flaw but older. Engine bay shows plenty of signs of age and use. Very good, not show-stopping paint. Some road dirt on the underbody and pitting on the exhaust. Restored in the late 1990s and enjoyed. Really just a driver, but a pretty one. – Like several other high-end cars over the past year or so, this GTC has been a repeat performer at Mecum, failing to meet reserve again and again. It hammered not sold at a $600,000 high bid at Mecum Kissimmee last year, then it hammered not sold again at Mecum Monterey last year at a $550,000 high bid. 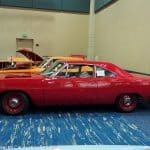 It got to a $575,000 high bid at Mecum Dallas last year and only got to a $580,000 at Mecum Kissimmee earlier this year. The car arguably deserves more even than the reported high bid in Indy, but with so many failed trips across the block, the bidders seem to have soured on it and the owner isn’t likely to get the number he wants. It’s time to change venue, try the private market, or just keep the car and enjoy it for a little while. 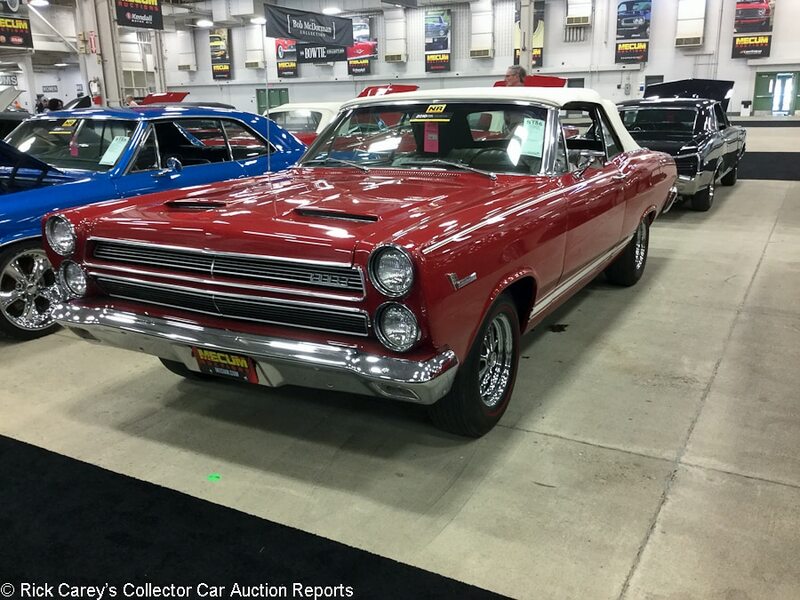 Reported by Mecum as bid to $650,000 in the post-sale results, the result as observed on the block was $575,000, confirmed with HammerPriceLive’s report. Either bid was within the pre-sale estimate and the car should have been sold. Lot # F275 1994 Ferrari 348 GTS Spider, Body by Pininfarina; S/N ZFFRG43A2R0098543; Rosso Corsa/Tan leather; Black cloth top; Unrestored original, 3 condition; With Reserve; Hammered Sold at $39,500 plus commission of 10.00%; Final Price $43,450 – Power windows, air conditioning, tan boot cover. – Represented with 30,000 miles. Paint is bright with only moderate swirling. No rock chips or deep scratches. Rubber is good. Top is good. Engine bay looks a bit dirty and neglected with heavy discoloration on the aluminum and light rust on the exhaust. Interior is dirty with stained carpet and small tears in the driver’s seat. No representation of service history. A used car and a rough one by Ferrari standards. 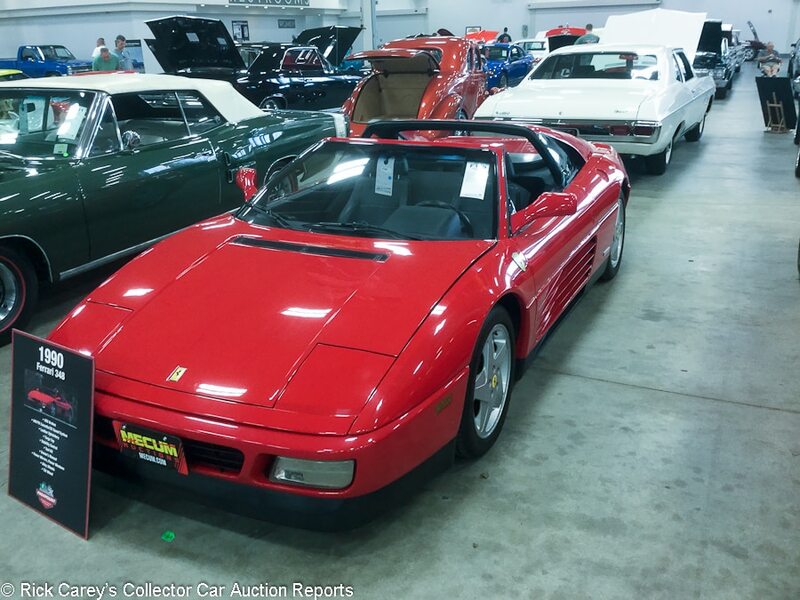 – The Indy bidders as well as the seller recognized this 348 for what it is and what it isn’t, and it sold at a price that reflects both the noticeable wear and the mechanical unknowns. The problem for the new owner is that while he may have gotten a cheap Ferrari for now, it will only take a few services before it’s not cheap anymore. 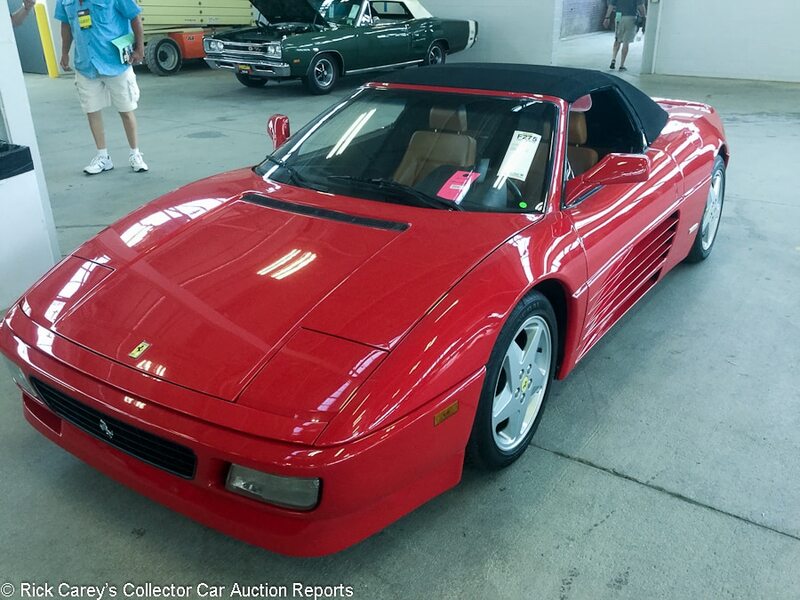 Lot # F189 1990 Ferrari 348ts Targa, Body by Pininfarina; S/N ZFFFG36A6L0087111; Rosso Corsa, Black roof/Black leather; Estimate $60,000 – $80,000; Unrestored original, 3 condition; With Reserve; Hammered Sold at $54,000 plus commission of 10.00%; Final Price $59,400 – Tool kit, owner’s manual, tilt steering column, power windows and mirrors, stability control, CD stereo. – Showing 13,815 miles. Paint shows heavy swirl marks. Rubber trim is good. Engine bay has a film of dirt and could do with a good detail. Trunk carpet has a patch of burnt carpet on the passenger side about the size of an orange and dirt and leaves collecting in its corners. Underside shows basic signs of outdoor use. Interior shows wear corresponding with the mileage. Paint chipping off the windshield vent covers. Long crack on the rear window. Headliner is falling down behind the driver’s seat. Belt service two years ago. A driver quality 348. – 348s have long been one of the cheaper ways to get into Ferrari ownership, so lots of them haven’t enjoyed the typical pampered existence that most Ferraris do. This one is very much a used car, but it has low miles and that’s apparently all the bidders were paying attention to. This price should have bought a much better example. 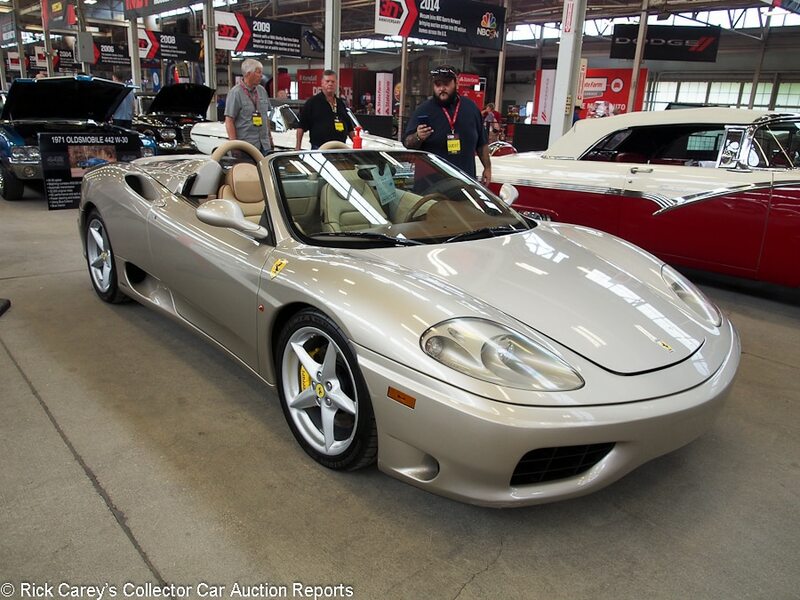 Lot # F212 2001 Ferrari 360 Spider, Body by Pininfarina; S/N ZFFYT53A410123007; Ingrid/Taupe leather; Black cloth top; Estimate $70,000 – $90,000; Unrestored original, 2- condition; With Reserve; Hammered Sold at $87,000 plus commission of 10.00%; Final Price $95,700 – 6-speed, yellow calipers, SF shields, Pioneer stereo. – Assembly number 40172. A clean used car that needs new tires. The odometer shows 33,412 miles. The car card calls this distinctive color “Ingrid”. A better description might be “Orchid”. – Open gate 6-speed cars, despite the performance advantage of the F1 paddle shift gearbox, have entered a period of collector preference which this distinctive color 360 Spider’s price reinforces. This is beyond retail, unless you really like the color. 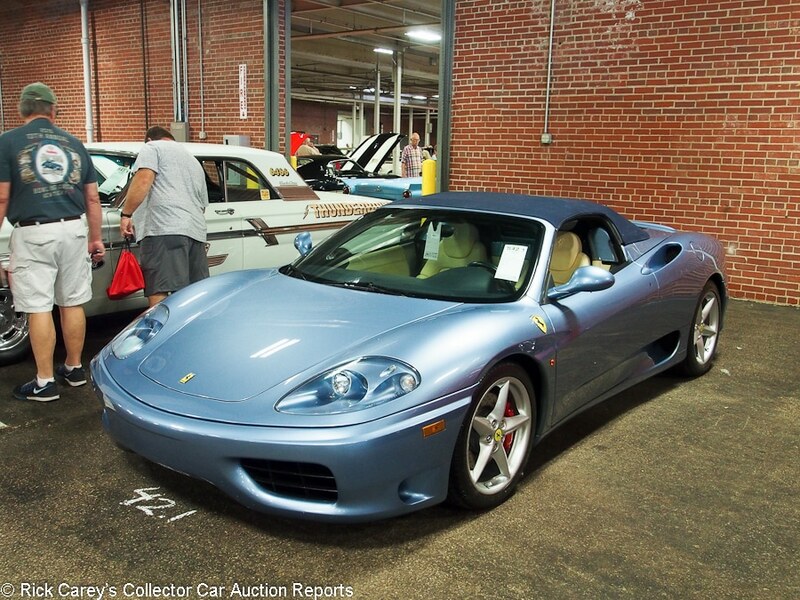 Lot # S042.1 2002 Ferrari 360 Spider, Body by Pininfarina; S/N ZFFYT53A220128143; Azzuro California/Crema leather; Blue cloth top; Unrestored original, 2 condition; With Reserve; Not sold at Hammer bid of $115,000 – 6-speed, Red calipers, SF shields, power seats, books. – Assembly number 45271. Clean used car represented with 13,900 miles from new and represented to have had a “recent” belt service. – 6-speed Ferrari 360s are worth more than the F1 gearbox models, but no more than the reported high bid here. 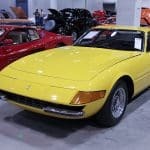 Lot # F137 1973 Ferrari 365 GTB/4 Daytona Berlinetta, Body by Pininfarina; S/N 16109; Yellow/Black leather; Estimate $625,000 – $750,000; Older restoration, 2- condition; With Reserve; Not sold at Hammer bid of $625,000 – Borrani wire wheels, Michelin XWX tires, Ansa exhaust, Simpson lap belts, Momo leather-wrapped steering wheel, factory air conditioning, power windows, later Alpine cassette stereo. – Fully restored in the 1990s and 8,000 miles ago. Very good paint other than a chip at the back edge of the hood and two more small ones at the back edge of the passenger’s side door. Lightly scratched window frames. Very light wear to the steering wheel and seats but otherwise very good interior. Lightly used but tidy underneath. Well restored in the first place, 1998 FCA Platinum winner, and quite well kept since. – Reported in Mecum’s results as bid to $725,000, well over the low estimate. Onsite I heard only $625,000 (confirmed with HammerPriceLive), so $725,000 must be a data entry error. This car has made the full Mecum tour, starting at Kissimmee last year and failing to sell a high bid of $800,000. Then it was off to Monterey, where it was not sold again at a $650,000 high bid and then Dallas back in November, once again not selling at a high bid of $700,000. At Kissimmee this year the high bid was $650,000 and at Houston a month ago it was $625,000, the low estimate here. The consignor is paying attention, but not anticipating the Daytona market’s course. 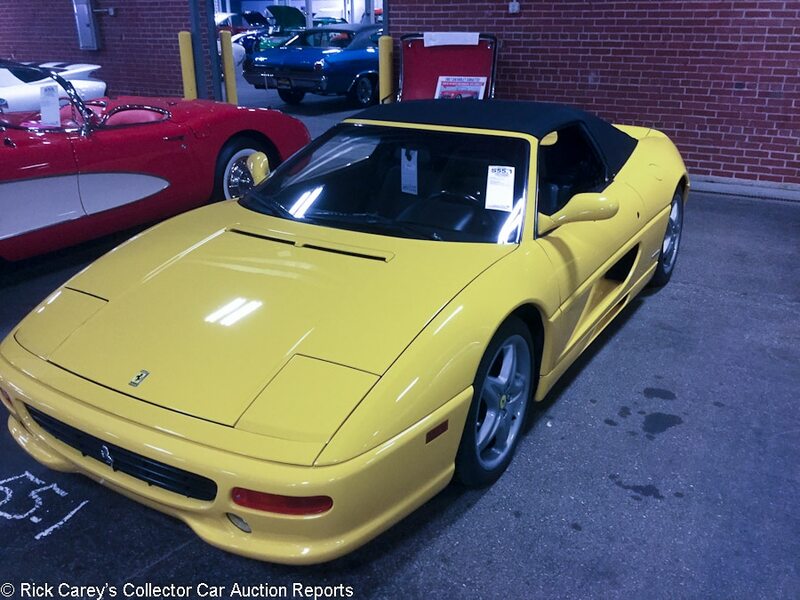 Lot # S055.1 1998 Ferrari F355 Spider Convertible, Body by Pininfarina; S/N ZFFXR48A7W0109753; Yellow/Black leather; Black top; Unrestored original, 2- condition; With Reserve; Not sold at Hammer bid of $75,000 – 6-speed, air conditioning, power windows, cassette stereo. – Paint is very good. The top is clean and straight-fitting. Engine compartment is clean, although there are some scratches on the diff housing and the red Ferrari valve covers could use a dusting. Underbody has light road wear, interior is clean but worn. Seats look dull and worn. Carpet is faded. Center console leather is warped from moisture. Represented as having its 15,000-mile service, showing 18,123 miles. – From a valuation standpoint, F355s with a 6-speed can almost be considered a separate model from cars with paddle shifters because they’re just worth so much more. If this car had an F1 gearbox, the reported high bid would be just about top dollar, but even with the worn interior the owner of this car was probably expecting closer to six figures for this 6-speed Spider. It sold at Auburn Spring in 2014 for $63,800 and would not have been unreasonable to move on at or close to this bid today. 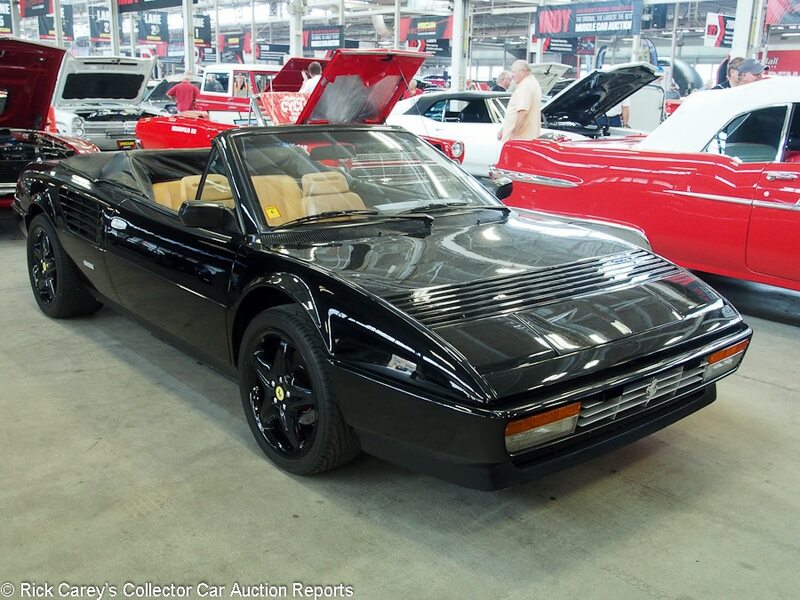 Lot # F255.1 1986 Ferrari Mondial 3.2 Cabriolet; S/N ZFFXC26A9G0065037; Black/Tan leather; Black cloth top; Unrestored original, 3 condition; With Reserve; Not sold at Hammer bid of $27,000 – CD stereo, Black F355 18 inch alloy wheels, Yokohama tires, Momo leather rim steering wheel. – Sound original paint and interior aged appropriately for the 60,593 miles on the odometer. – Sold by Kruse at Concorso Italiano in 2005 for $26,568, at RM’s Boca Raton auction in 2006 for $31,565, at RM Ft. Lauderdale in 2008 for $25,300. It’s put just 523 miles on the odometer since 2005 and looks pretty much now as it did then. It could have been sold for the reported high bid here, and is unlikely to do much if any better by being dragged along to another auction. 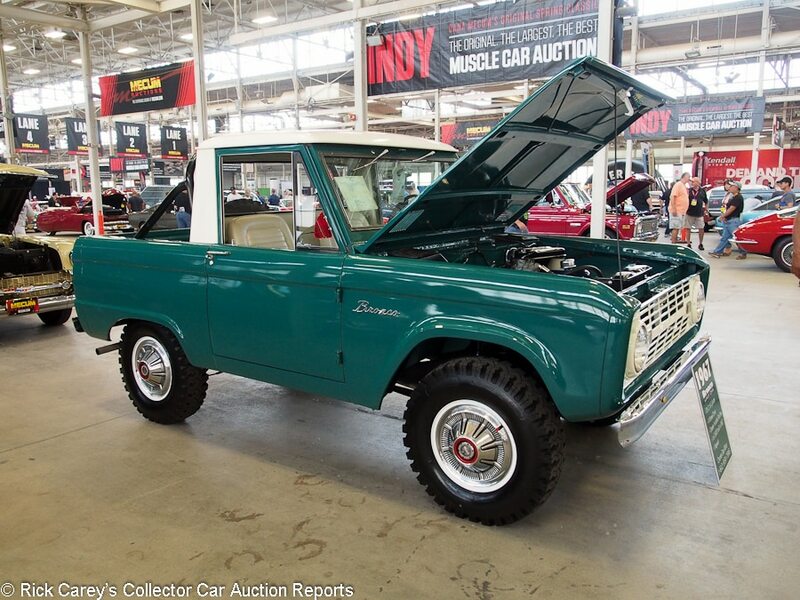 Lot # T164 1967 Ford Bronco Pickup 4×4; S/N U14FLA46415; Holly Green, White roof/White vinyl; Estimate $40,000 – $50,000; Truck restoration, 3+ condition; With Reserve; Hammered Sold at $33,000 plus commission of 10.00%; Final Price $36,300 – 170/105hp six, 3-speed, 4WD. – Paint is new, but there is overspray on some rubber trim and over corrosion spots. Watermarks and heavy swirling in the rear. Moderate chipping in the bed. Engine compartment is great and freshly painted. Hoses and wires look new. Underside is newly painted but looks to be covering corrosion. Interior is clean but panels are patched with tape and poor paint patching. Represented with new tires, new radiator and new engine gaskets. A quick, truck-quality restoration. – The work on this truck looks like it was rushed through to try to take advantage of the current rage for first gen Broncos, but looks like the effort worked in Indy. On closer inspection, this Bronco is far from perfect, but the Bronco-hungry bidders were apparently content enough with the fresh paint, clean engine bay and pickup body to bid it to a price that really should have bought a better example. 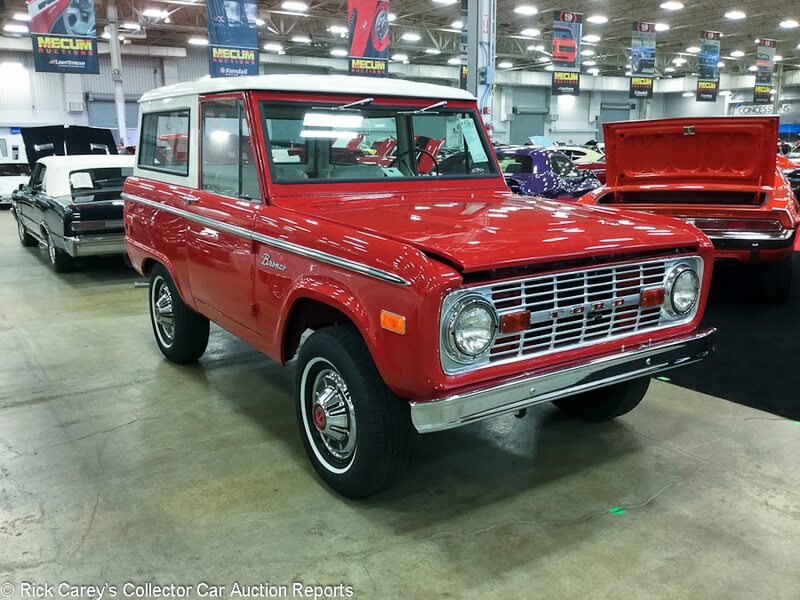 Lot # F138.1 1973 Ford Bronco Wagon 4×4; S/N U15GLR08671; Red, White top/Parchment vinyl; Estimate $50,000 – $75,000; Recent restoration, 2- condition; With Reserve; Hammered Sold at $49,000 plus commission of 10.00%; Final Price $53,900 – 302/139hp V8, automatic, wheel covers, narrow whitewalls, bucket seats, floor shift, side molding trim. – Paint looks very good other than two cracks in the hood and a small chip in the front fender. Panel fit is slightly uneven. Brightwork looks new. Engine compartment is very clean and looks barely run. Underbody is clean and well restored. Interior is mostly new, with the original steering wheel showing age and a small tear in the rear seat. Door sill has some deep scratches from the bottom of the door rubbing on it. Body-off restoration finished in 2016 and done to mostly excellent standards, but a handful of corners were cut. Broncos are starting to be worth enough that an expensive restoration makes a lot more financial sense, and this recently finished one is a perfect example of that. – Further proof that first generation Broncos are hot right now, with what one would normally consider top dollar paid for a less than perfect example. 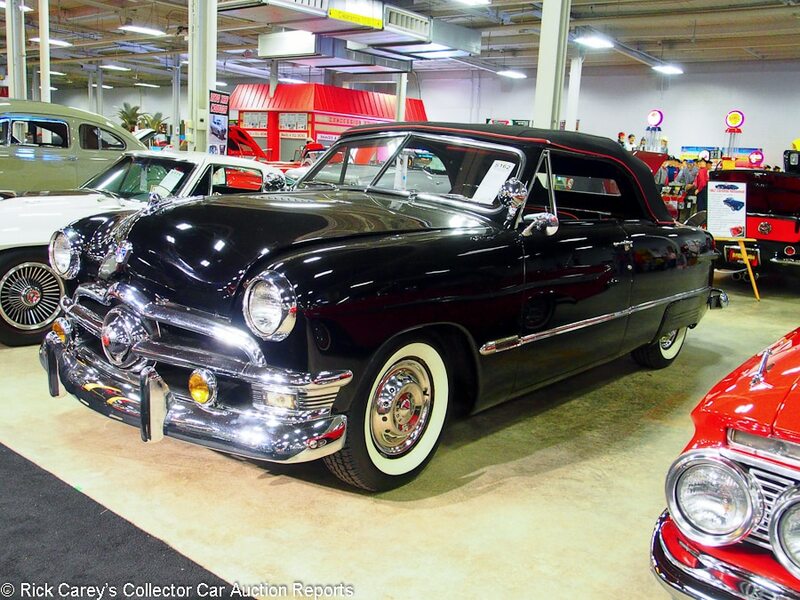 Lot # S162 1950 Ford Custom Convertible; S/N B0CS159184; Black/Black, Red leatherette; Black cloth top; Estimate $50,000 – $75,000; Modified restoration, 3+ condition; With Reserve; Not sold at Hammer bid of $35,000– 4-barrel, aluminum heads, duals, 3-speed, pushbutton radio, Sun tach, underdash gauges, clock, dual remote spotlights, skirts, fog lights, lowered, wheel covers, whitewalls, continental kit. – Good older paint, chrome and interior. Underbody is covered in old undercoat. It has a look. All it needs is a set of lakes pipes. – This isn’t a $35,000 Ford, but neither is it a $50,000 Ford. Somewhere in the middle is a sweet spot, and it’s closer to $35,000 than it is to $50,000. It’s a car that begs to be taken to the Goodwood Revival in the UK, driven by some old guy in Levis and a white tee-shirt with a pack of Luckys rolled up in the sleeve. 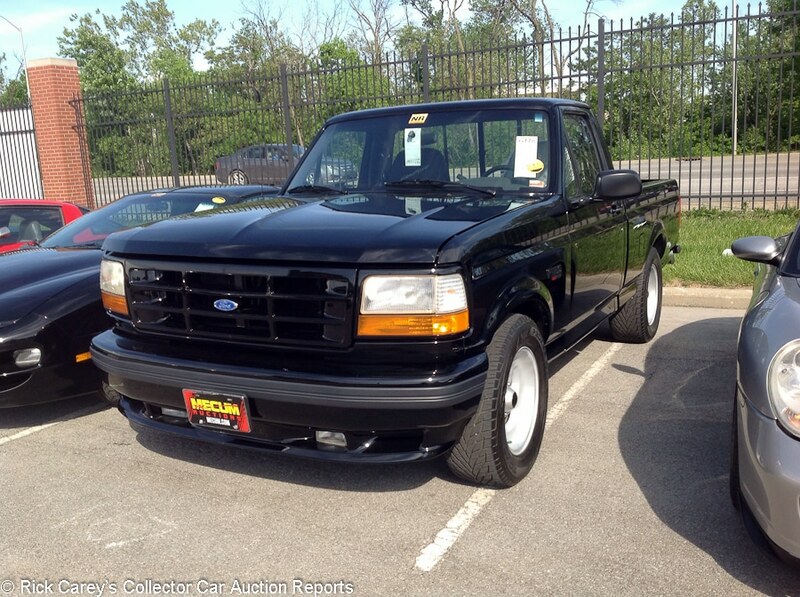 Lot # G178 1993 Ford F-150 SVT Lightning Regular Cab Pickup; S/N 1FTDF15RXPLA62382; Black/Gray cloth; Unrestored original, 2- condition; No Reserve; Hammered Sold at $11,000 plus commission of 10.00%; Final Price $12,100 – Automatic, cruise control, power windows, power locks, cassette stereo, console. – Represented with 67,998 believable miles and looks like a truck with much fewer. Paint looks very good with only a very few minor blemishes on the front. There are a few very small dents in the painted bed. Engine bay is very clean other than some paint peeling on the master cylinder. Interior looks excellent with only a little wear showing on the driver’s seat. Underneath is clean with some paint flaking on the frame and rear axle. An incredibly well kept and seldom seen first-year Lightning. – When it comes to the sporty pickups of the early ’90s, most people think of the GMC Syclone or Chevrolet 454 SS, and that’s what you tend to see at auction. The SVT Lightning is still pretty darn quick, though, and typically worth less than both of its GM rivals. This one brought a somewhat modest result given its remarkable level of preservation, but if the recent interest in collector trucks is any indication, these first generation Lightnings won’t be overlooked for long. Lot # S006 1963 Ford Galaxie 500XL 2-Dr. Hardtop; S/N 3U68R173178; Black/Black vinyl; Recent restoration, 2 condition; With Reserve; Hammered Sold at $50,000 plus commission of 10.00%; Final Price $55,000 – 427/425hp with dual quads, 4-speed, buckets and console, Hurst shifter, hubcaps, blackwall tires, pushbutton radio, heater. – Represented as two owners and 42,553 miles, replacement engine. Stored with a blown engine from 1965 until 2011. Very good paint, bright chrome and stainless, good original interior. The engine compartment is like new. – Very thoughtfully and thoroughly presented and the replacement engine is more the norm than the exception for these avidly thrashed runners. This is a strong car, sympathetically and thoroughly done and is a sound value at this price early in Saturday’s auction where the pickings are often good. 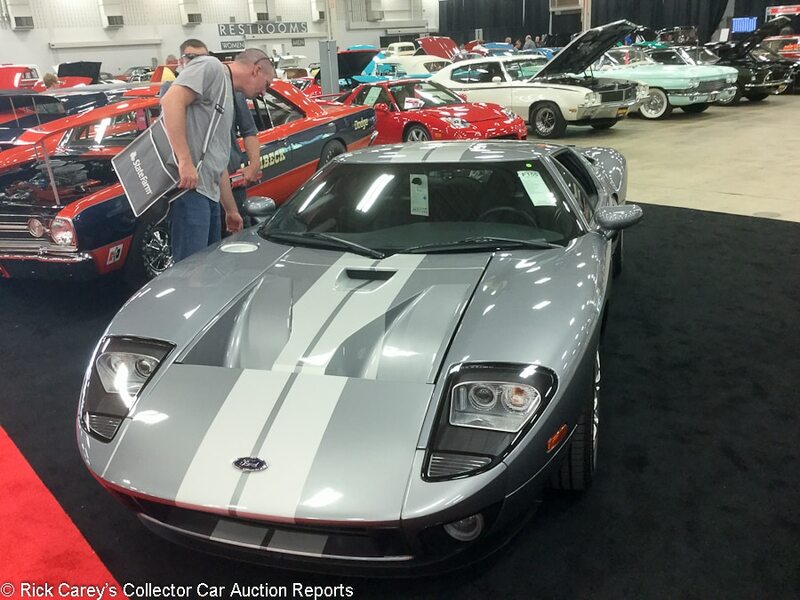 Lot # F155 2006 Ford GT Coupe; S/N 1FAFP90S06Y400619; Tungsten Gray Metallic, White stripes/Black leather; Estimate $300,000 – $350,000; Unrestored original, 2 condition; With Reserve; Hammered Sold at $300,000 plus commission of 10.00%; Final Price $330,000 – Books and records, window sticker, factory car cover, factory battery charger, BBS wheels, McIntosh stereo. – 1,285 original miles. Excellent paint. Engine bay is perfect other than some dusty hoses and some stickers have curling edges. Underside is perfect. Interior is flawless. Yet another like-new Ford GT, although this one is at least finished in a somewhat unusual one-year-only color. – This seems to be just about the going rate these days for a like-new Ford GT, which apparently is all of them. 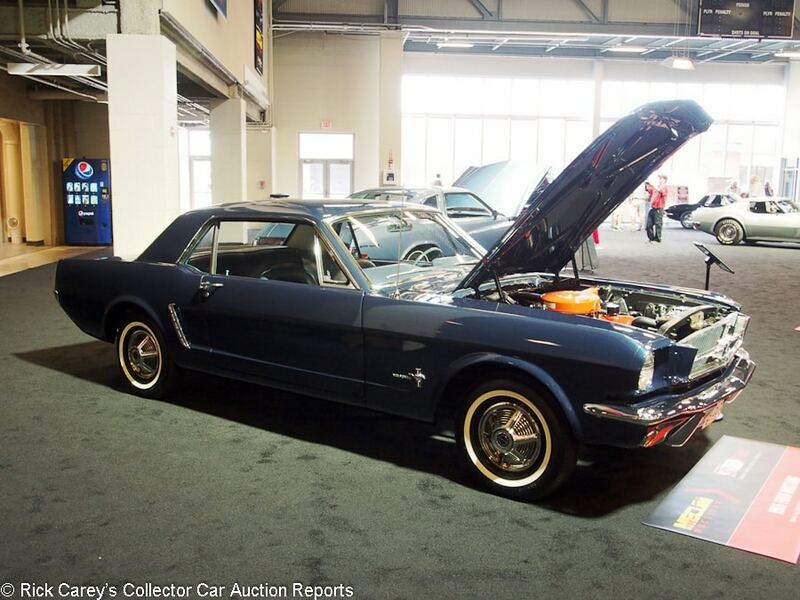 Lot # S125 1965 Ford Mustang Notchback; S/N 5F07U100002; Caspian Blue/Blue vinyl; Estimate $450,000 – $650,000; Recent restoration, 2 condition; With Reserve; Not sold at Hammer bid of $300,000 – 170/105hp six, 3-speed, pushbutton radio, wheel covers, narrow whitewalls, 13-inch wheels, floor shift. – VIN 100002, described as the first Mustang coupe to receive a VIN, built on the pilot line for early delivery to a British Columbia dealer for the Mustang introduction, but never arrived there, instead arriving at Whitehorse, Yukon Territories a month after introduction and spending its early years as a driver in the Yukon. Replacement date code correct engine. Several early pre-production features not carried over into regular production. Restored like new, and then they reused to old thin chrome door handles. The first Mustang coupe, an historic car, even if the drivetrain has little appeal. – This Mustang was carefully described as “the first Mustang coupe to receive a VIN”, and that is about all that is interesting about it. Certainly not the 1-barrel six cylinder 3-speed drivetrain or the basic trim level. The “First Mustang” is forever ensconced in The Henry Ford in Dearborn and no one knows if, despite the VIN, this is the second Mustang or the seventeenth given the order in which Ford builds cars. This boring Mustang is never going to get more exposure than it got here in Indianapolis but Mark Delzell gave up even pretending at this bid. It’s going to be a hard sell at a big price when rational people would prefer a K-Code GT Convertible with a VIN in the hundreds of thousands, and a price in high five-figures. 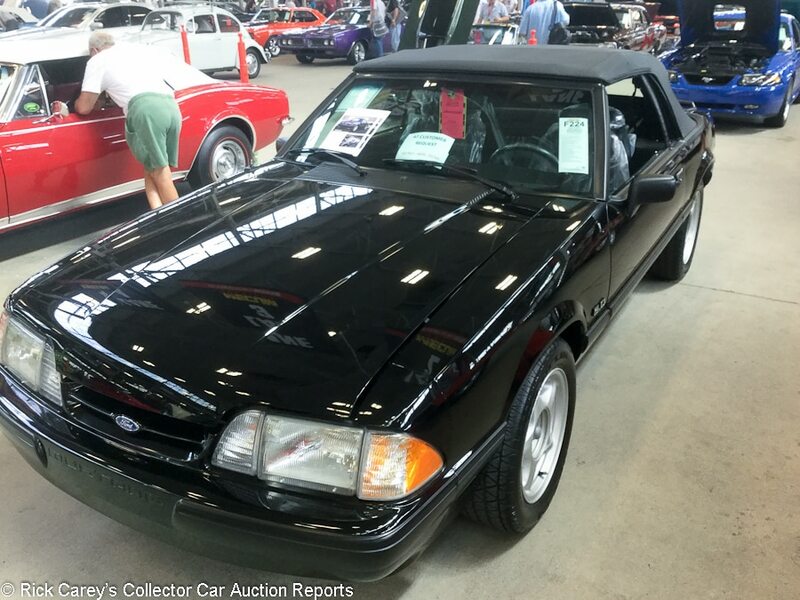 Lot # F224 1991 Ford Mustang 5.0 LX Convertible; S/N 1FACP44E3MF125170; Black/Black; Black top; Estimate $35,000 – $45,000; Unrestored original, 2 condition; With Reserve; Not sold at Hammer bid of $31,500 – 302/225hp, automatic, Traction-Lok, power top, sports seats, power windows, cassette stereo. – Showing 48 miles and never titled. Still on original MSO. Paint is like new. Engine compartment is also near perfect with only some oxidation showing on alternator and A/C pump. Underside is flawless along with the interior. There’s not much you can say about this car other than that it looks new and technically still is. 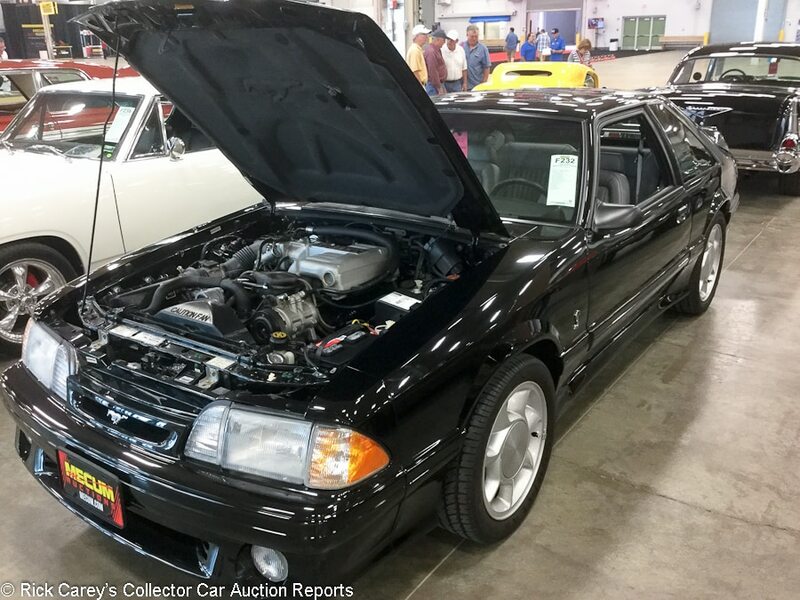 – Barrett-Jackson had a group of like-new Fox body Mustangs in Scottsdale this year and they brought truly remarkable prices, including $82,500 for a 1990 LX Convertible with 16 miles on it. The consignor of this similarly mothballed Mustang probably had that car in mind during the whole trip to Indy, so even though this was huge money for a ’91 Mustang of any kind, the consignor can’t be judged too harshly for having dollar sign-tinted glasses and refusing to take less than half of what he just saw a similar car sell for. Lot # F232 1993 Ford Mustang 5.0 SVT Cobra Hatchback; S/N 1FACP42D4PF155194; Black/Gray leather; Estimate $35,000 – $45,000; Unrestored original, 2 condition; With Reserve; Hammered Sold at $49,000 plus commission of 10.00%; Final Price $53,900 – 302/230hp, 5-speed, window sticker, disc brakes, open air roof. – Represented with 700 original miles. Paint shows moderate swirl marks but no other flaws. Trim looks new. Engine compartment is clean with minor discoloration on the metal parts. Hoses look a little faded but the belt and wires look fresh. Underside looks great, as does the interior. Seats show very light wear, but otherwise the interior is flawless. Essentially looks like a new SVT Cobra. – Ford’s Special Vehicle Team was started in 1993, so these Mustang Cobras along with ’93 Lightning pickups have the significance of being the first vehicles built under that program. This example is further distinguished by essentially being a new car. The price is huge, but so are other recent results for mothballed Fox body Mustangs like this. 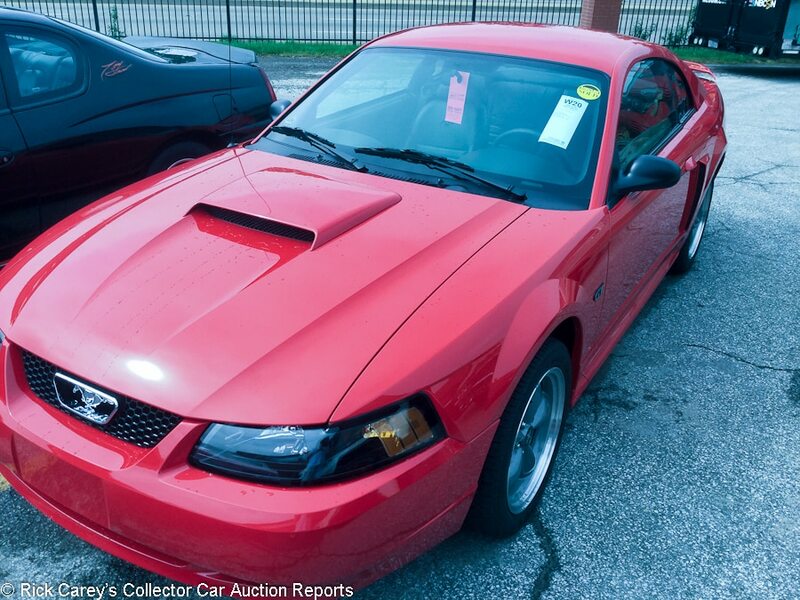 Lot # W020 2002 Ford Mustang GT Coupe; S/N 1FAFP42X82F190935; Red/Black leather; Unrestored original, 2 condition; With Reserve; Hammered Sold at $10,000 plus commission of 10.00%; Final Price $11,000 – 281/260hp V8, 5-speed, factory stereo, power windows, air conditioning. – Showing 1,980 original miles. Paint and trim are flawless. Engine is clean, but looks like it hasn’t been run in a long time. Everything else looks good. Interior is flawless as well. It looks just about fresh off the lot. – Still essentially new, but also still in used car territory price-wise. This car would have cost about 25 grand when new, which makes you wonder what the point of keeping it sitting still for so long was. 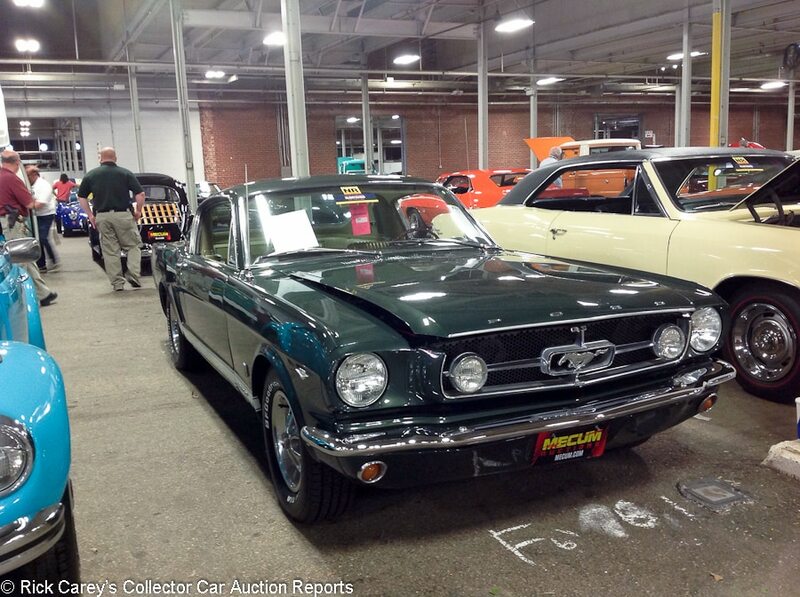 Lot # F061 1965 Ford Mustang GT Fastback; S/N 5F09A731348; Ivy Green/Light Ivy Gold, White vinyl; Estimate $30,000 – $40,000; Older restoration, 3+ condition; No Reserve; Hammered Sold at $29,000 plus commission of 10.00%; Final Price $31,900 – 289/225hp, Pony interior, 4-speed transmission, woodrim steering wheel, pushbutton AM radio, front disc brakes. – From the Dallas and Ammie Hawkins collection, an A-Code 2+2 fastback. Paint looks good with some small chips at the panel edges. Brightwork has a quite a few dings and scratches throughout. Exhaust manifolds have a lot of heat rash and the intake is discolored, but the engine bay is mostly tidy. Underneath looks good with some light wear and tear showing. Interior is showing some age, with small tears in passenger’s seat, cracks in the driver’s door panel and fading around the gauges. Restored a while ago and on a budget, but absolutely a car you could be proud of. – With the serial number 2 sucking up a lot of the attention from Mustang fans in Indy, it might have been easy to look past this perfectly good GT. This is a lot more car, and it sold at a reasonable price. Lot # F225 2003 Ford Mustang Mach 1 Coupe; S/N 1FAFP42R63F430194; Azure Blue, Black/Black leather; Estimate $25,000 – $35,000; Unrestored original, 2 condition; With Reserve; Hammered Sold at $22,500 plus commission of 10.00%; Final Price $24,750 – 281/305hp, 5-speed, 3.55 Traction-Lok, Mach 1 suspension, air conditioning, CD stereo, power driver’s seat. – Paint is near perfect other than a few swirl marks. Engine compartment is perfect, as is the interior. Showing 941 represented as original miles and looks like a new car. – Ford spun the visually uninspiring ’99-’04 Mustang with several special editions, including the Mach 1 with its 305-hp engine based on the Cobra, a shaker hood scoop, Magnum 500-style wheels and a suspension setup similar to that found on the Bullitt Mustang. This car would have cost about $30,000 when new almost 15 years ago. It’s still in like-new condition, but in terms of value it’s still in used car territory, as this price demonstrates. It’ll be a few years yet before collectors really start to appreciate a mothballed 2000s Mustang like this (if ever). 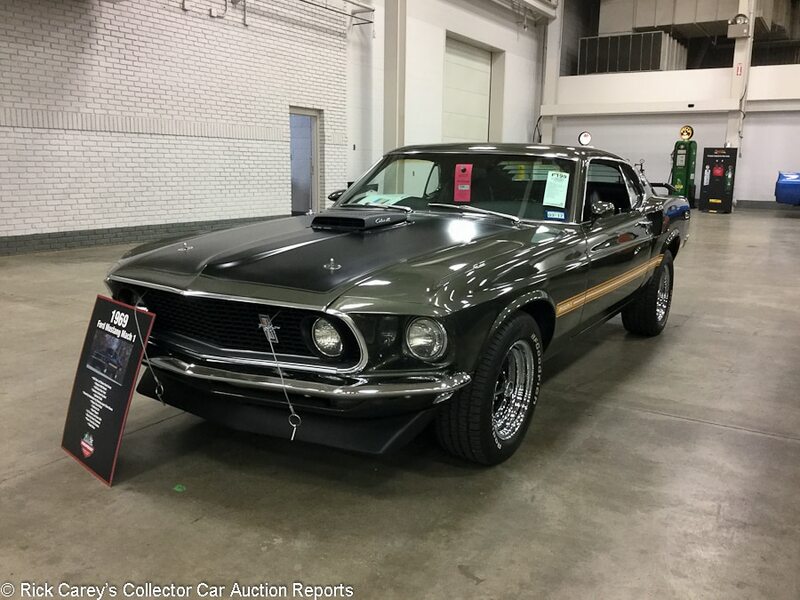 Lot # F199 1969 Ford Mustang Mach 1 SportsRoof; S/N 9R02R190533; Black Jade, Black/Black vinyl; Estimate $95,000 – $115,000; Visually maintained, largely original, 2- condition; With Reserve; Hammered Sold at $67,500 plus commission of 10.00%; Final Price $74,250 – 428/335hp, 4-speed, power front disc brakes, Hurst T-Handle shifter, rear window slats, front and rear spoilers, aftermarket radio, 3.50 rear end, power steering, Magnum 500 wheels. – Paint looks very good other than a few small chips and scratches on the front. Panel fit is factory. Brightwork looks good other than some pitting and scratches on the window trim. Engine compartment is clean but lightly used. Underneath is very clean. Interior looks new. A cosmetically restored Cobra Jet Mach 1 showing 5,557 miles and very carefully kept since new. Won the unrestored class at the MCA Grand National concours in 2012. – Reported sold for $75,000 at Motostalgia Indy last year. This very similar result is also somewhat modest for such a solid unrestored example in desirable colors. 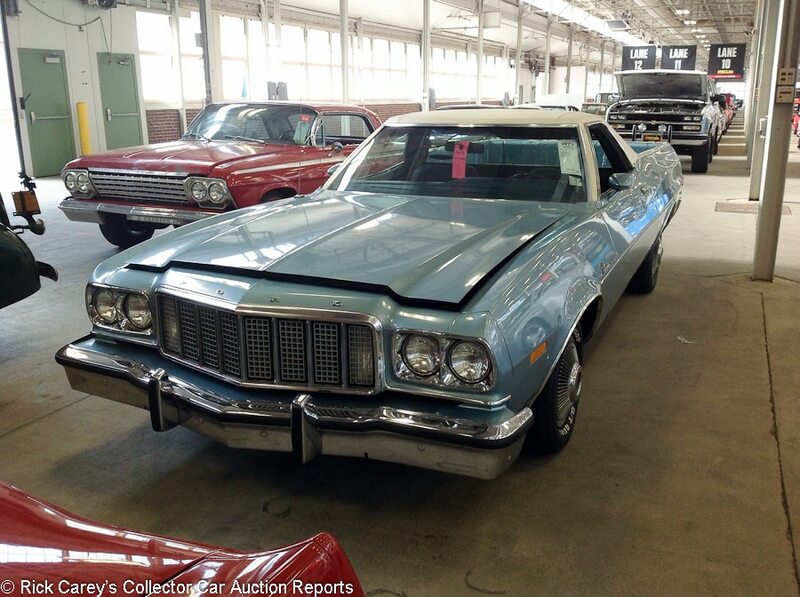 Lot # W077 1975 Ford Ranchero 500 Pickup; S/N 5A47H145138; Light Blue Metallic, White vinyl roof/Light Blue vinyl with cloth inserts; Unrestored original, 3 condition; With Reserve; Hammered Sold at $9,000 plus commission of 10.00%; Final Price $9,900 – 351/154hp, automatic, factory air conditioning, gauge package, AM/FM radio with 8-track, CB radio, deluxe interior, tilt steering column. – Paint looks a little dull with scratches and chips all over. Panel gaps are a little uneven. Vinyl roof looks very good. Engine bay looks good and showing typical wear for the age. Underneath has a decent amount of surface rust and the undercoating is beginning to peel off. Interior is very good and showing very little wear. Represented as original and showing 38,622 believable miles, it’s a lightly used and pretty carefully preserved ’75 Ranchero. There can’t be many around quite like it. – Given a slight premium for its level of preservation, but it has the smallest engine available in ’75. The bidders rightly didn’t get carried away and took into account the needs a 40-year-old vehicle like this will inevitably have. An equitable result for both parties. 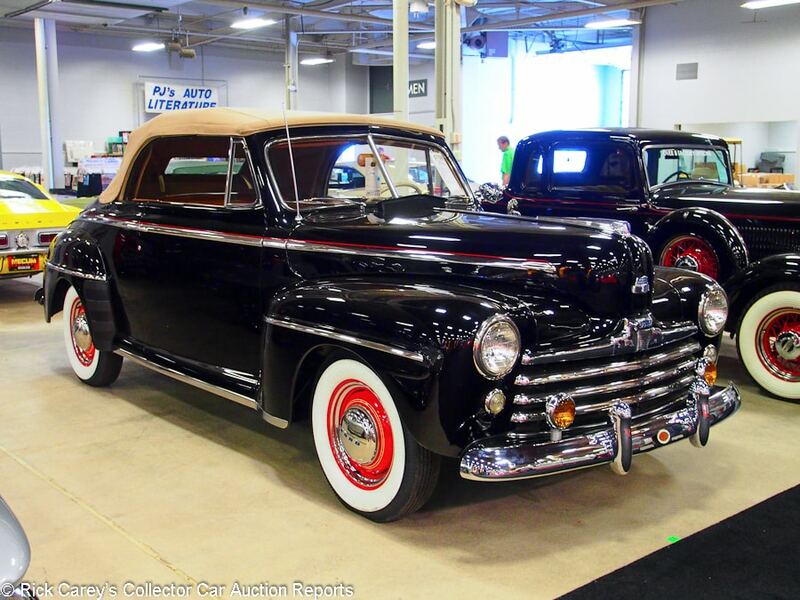 Lot # S158 1947 Ford Super Deluxe Convertible; S/N 799A1594294; Black/Tan leather, cloth; Beige cloth top; Estimate $50,000 – $75,000; Older restoration, 3+ condition; With Reserve; Not sold at Hammer bid of $35,000 – Power top, heater, radio, remote spotlight, fog lights, red wheels, hubcaps, trim rings, wide whitewalls. – 135,649 miles showing. Good older paint except for the taillights and rear fenders. Doors fit and close perfectly. Underbody was done like new but now is aged, with a little surface rust on bare metal. The interior, dash and gauges are like new. 1986 AACA National First Prize and looks like it. – Hammered not sold at Mecum Monterey last year at a $35,000 high bid. The bidders have spoken twice with the exact same high bid, and while that would ordinarily suggest that the consignor should adjust his expectations, this car really does deserve more. 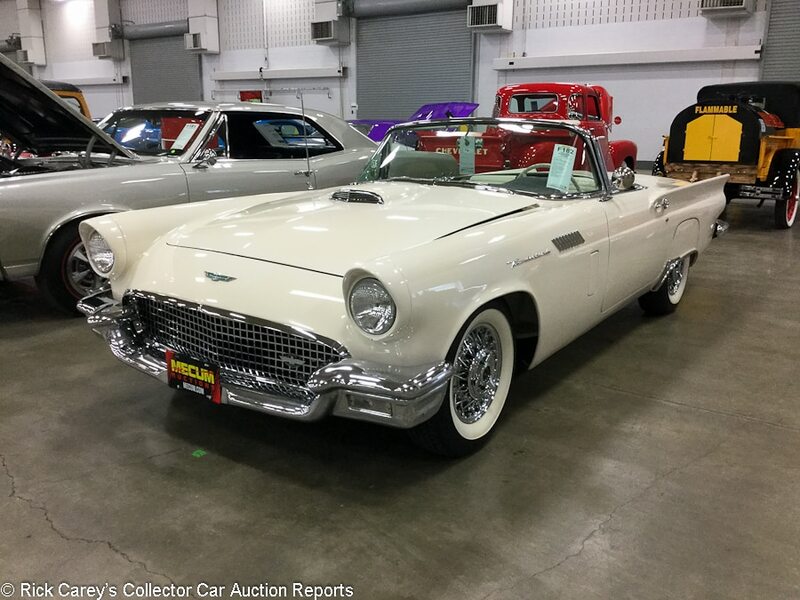 Lot # S118 1957 Ford Thunderbird Convertible; S/N F7FH394879; White, White hardtop/Black, White vinyl; Estimate $175,000 – $195,000; Recent restoration, 2+ condition; With Reserve; Not sold at Hammer bid of $140,000 – 312/300hp, automatic, power steering and brakes, Town & Country radio, chrome wire wheels, wide whitewalls, skirts, power windows, power seats. – Excellent paint, chrome and interior. Engine compartment, chassis and underbody are like new. Above reproach and better than new. – The consignor must have been disappointed at this F-Bird’s reception, but not so disappointed as to become resigned to taking what was on offer. It is far better than the amount offered. 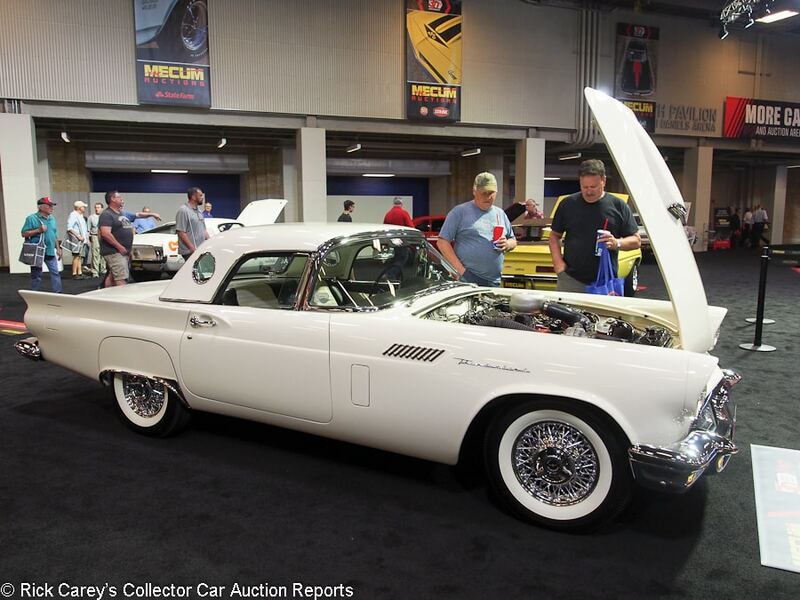 Lot # W204 1957 Ford Thunderbird Convertible; S/N D7FH164847; Black, White hardtop/Black, White; White vinyl top; Older restoration, 2- condition; With Reserve; Hammered Sold at $38,500 plus commission of 10.00%; Final Price $42,350 – 312/245hp, automatic, power steering, power brakes, air conditioning, chrome wire wheels, whitewalls, porthole hardtop. – Paint looks bright but has noticeable swirl marks. Brightwork shows some scratches and slight pitting. Rubber is fresh with some warping in places. Engine bay is very clean with fresh engine block paint. Chromed valve covers. Underside is clean but not recently detailed like the engine bay. Interior is great with no signs of use or age. Represented with recent work on the cooling system, suspension, brakes and exhaust. – Sold at Mecum Kissimmee in 2012 for $53,000, then sold at Mecum Kissimmee in 2015 for $39,420 and sold at Mecum Indy in 2015 for $61,560, a result that defies comprehension. 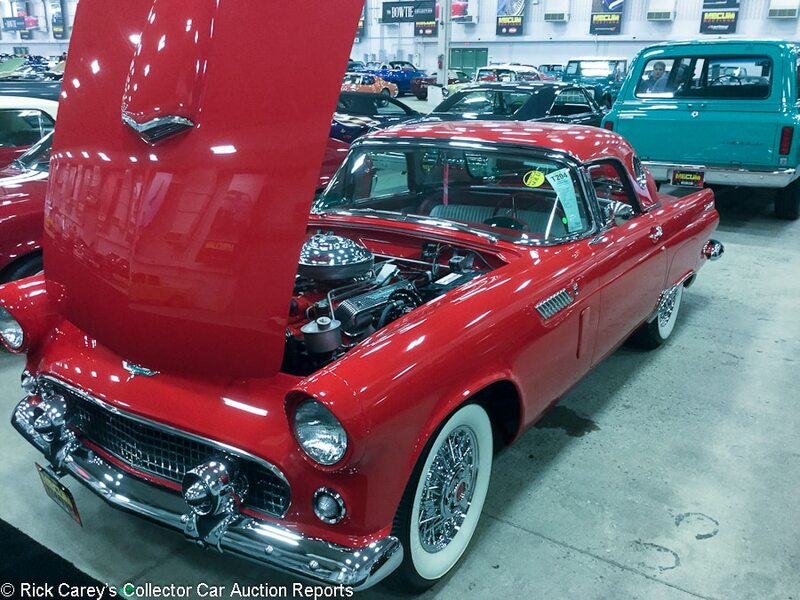 The result today is a mainstream price for a usable but not exceptional ’57 T-bird. 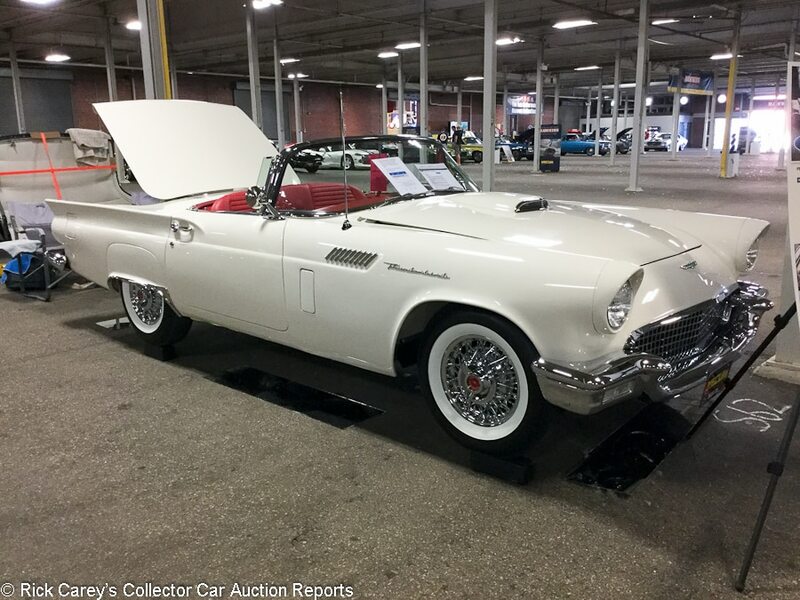 Lot # F182 1957 Ford Thunderbird Convertible; S/N E7FH188956; Colonial White/Black, White; Black top; Estimate $80,000 – $95,000; Older restoration, 2- condition; With Reserve; Hammered Sold at $60,000 plus commission of 10.00%; Final Price $66,000 – 312/270hp E-Code engine with dual quads, automatic, power brakes, Town and Country radio, padded dash, whitewalls, fender skirts, chrome wire wheels, heater and defroster, 12-volt electrics. – Last year for the baby bird. Paint looks very good. Brightwork looks beautiful. Panel fit is very good, but the trunk could use a little adjustment. Engine bay is very clean, with some signs of a small fluid leak near the distributor. Underneath is very clean with very little signs of wear. Interior looks very good with slight signs of wear on the driver’s seat. No hardtop present or represented. Fully restored 10 years ago to high standards and lightly used since. – Hammered not sold at a $65,000 high bid at Mecum Kissimmee earlier this year. 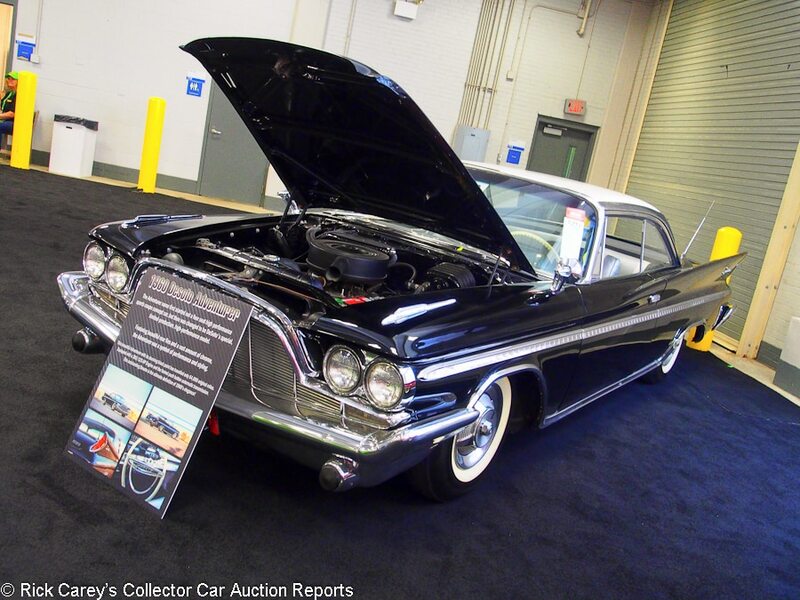 Both bids were light for such a good E-Code Thunderbird even taking the lack of a hardtop into account, but the seller decided to save the hassle of more auction trips and let it go. The new owner got a heck of a bargain, especially since the car has no apparent needs. It was offered at Kissimmee in January where it was reported bid to $65,000, a result consistent with what it brought here. Lot # S062 1957 Ford Thunderbird Convertible; S/N D7FH229336; Colonial White, White hardtop/Red; Recent restoration, 2+ condition; With Reserve; Not sold at Hammer bid of $80,000 – 312/245hp, automatic transmission, air conditioning, power steering, power brakes, two tops, power windows, power seat, factory wire wheels, whitewalls. – Excellent paint. Even gaps. Brightwork is all very good other than two small scratches on the rear bumper. Engine compartment looks better than factory. Underneath is just as clean. Interior is all new and installed perfectly. A beautiful and showable fresh restoration. – It’s clear that a lot of time and money went into this car, but given this car’s equipment the reported high bid here was an eminently fair, and even a little generous, offer and could have been taken. Lot # S187 1969 Ford Torino Cobra 2-Dr. Hardtop; S/N 9H46R217821; Candyapple Red/Black vinyl; Older restoration, 2- condition; No Reserve; Hammered Sold at $43,000 plus commission of 10.00%; Final Price $47,300 – 428/335hp Ran Air Cobra Jet, 4-speed, bucket seats, no console, AM-FM, chrome wheels, hubcaps, trim rings, Radial T/A tires, hood pins, Ram Air hood, underdash gauges, power brakes and steering, oil cooler, Hurst shifter. – Represented as matching numbers engine and 37,652 miles from new, Marti Report and build sheet documented. Very good paint, chrome and interior. There are some light scuffs on the left side of the hood. The engine compartment, chassis and underbody are restored but now show some age but little use. – Sold here in 2010 for $41,340. Reach your own conclusion. 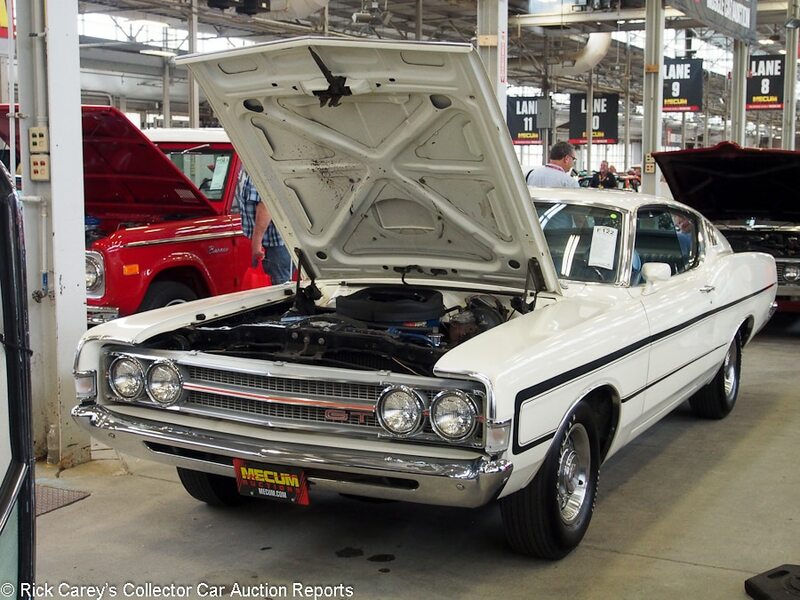 Lot # F122 1969 Ford Torino GT 2-Dr. Hardtop; S/N 9K42R100061; White/Blue vinyl; Cosmetic restoration, 3+ condition; With Reserve; Hammered Sold at $31,000 plus commission of 10.00%; Final Price $34,100 – 428/335hp Cobra Jet, automatic, power brakes and steering, buckets and console, rally wheels with hubcaps and trim rings, Polyglas tires. – Marti Report shows order type: Introductory Show Unit, apparently intended for promotions, and an early VIN. Good repaint, chrome and interior. The engine compartment, chassis and underbody are clean, dry and original with some surface rust and paint loss. – While this Torino GT doesn’t show like a restored car, it is handsomely maintained in impressively original condition and has an appealing story to tell. It was bought here at a realistic but modest price and is a good value. Lot # S052.1 1991 GMC Syclone Pickup; S/N 1G0CT1423M8801057; Black/Black cloth piped in Red; Unrestored original, 2- condition; With Reserve; Hammered Sold at $25,500 plus commission of 10.00%; Final Price $28,050 – 262/280 Turbo V-6, automatic, all wheel drive, air conditioning, power windows, power locks, power steering, power brakes. – Showing 28,600 believable miles. The original paint looks very good with a few minor chips and touch ups on the front. Panel fit is very good. Front grille has two deep scratches. Engine compartment looks spotless and is recently detailed. Interior is well maintained and spotless. Not the best Syclone in existence, but original and it does almost look new with enough miles on it that you wouldn’t feel guilty every time you took it out for an exciting drive. – Syclone/Typhoon prices have nearly doubled over the past few years and stayed high. And given the generally high interest in both collectible trucks and collectible vehicles from the 1990s, they’re likely to remain high. This result was pretty much right on the money. 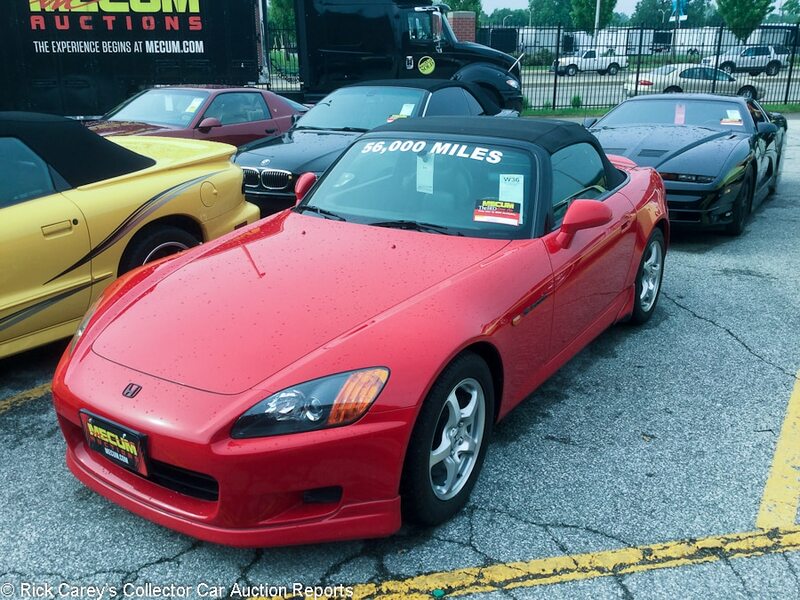 Lot # W036 2000 Honda S2000 Convertible; S/N; Red/Black leather; Black top; Unrestored original, 2- condition; With Reserve; Not sold at Hammer bid of $16,000 – Power top, power windows, air conditioning, factory CD stereo. – Paint shows significant rock chips and scuffs on the front bumper as well as poor attempts to patch paint flaws. Rubber trim looks sun baked and there are some scuffs from a buffing tool. Engine bay looks well cared for. Underside is rust free. Interior is in good condition but could use a detailing. Represented with 56,189 miles. A used car, but a lightly used one. – The S2000 is a true modern driver’s car that does everything a Miata does, just a little bit better. The earlier AP1-series cars with their 2.0-liter engines and screaming 9,000 rpm redlines are particularly desirable. S2000s depreciated but they never really got cheap, and top-notch examples have already started going up in value. This example is no better than average, though, and arguably could have gone home at this price. 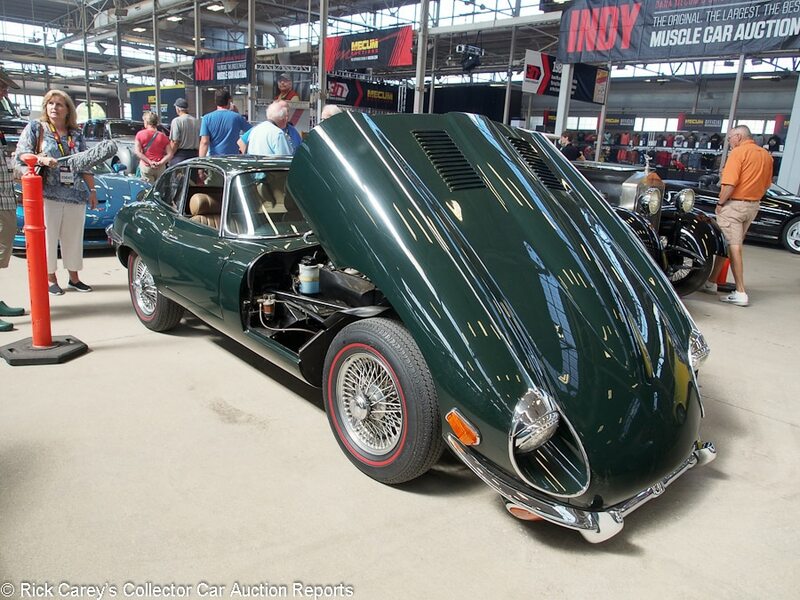 Lot # W119 1970 Jaguar XKE SII Fixed Head Coupe; S/N 1R27691; Dark Green/Biscuit leather; Visually maintained, largely original, 3- condition; No Reserve; Hammered Sold at $36,500 plus commission of 10.00%; Final Price $40,150 – 4-speed, aftermarket AM-FM, chrome wire wheels, red line Michelin X tires. – No engine number on the cylinder head. Mediocre old repaint, minor edge chips, good glass and chrome. Lightly stretched upholstery. Engine compartment and chassis are original with some cosmetic attention long ago. Old, gooey undercoat under the hood. Filled body sills. JDHTC documented. A marginal driver with potential but not very pleasing as presented here. – Evaluating this car’s value took a little effort and compromise to balance competing attributes but in the end the bidders arrived at a reasonable compromise. Lot # F135.1 1969 Jaguar XKE SII Roadster; S/N 1R7694; Primrose Yellow/Black; Black cloth top; Older restoration, 3 condition; With Reserve; Hammered Sold at $84,000 plus commission of 10.00%; Final Price $92,400 – 4-speed, chrome wire wheels, blackwall tires, factory radio. – Thick repaint over old paint, a few prep flaws and touched up edge chips, lightly stretched upholstery. Good chrome. A competently restored car with a few miles. 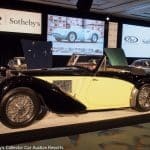 – Offered by Motostalgia at Amelia Island last year and reported bid to $76,000, then went to Auctions America’s Ft. Lauderdale sale three weeks later and brought a bid of $65,000 but at Hilton Head in November the bid was just $51,000. 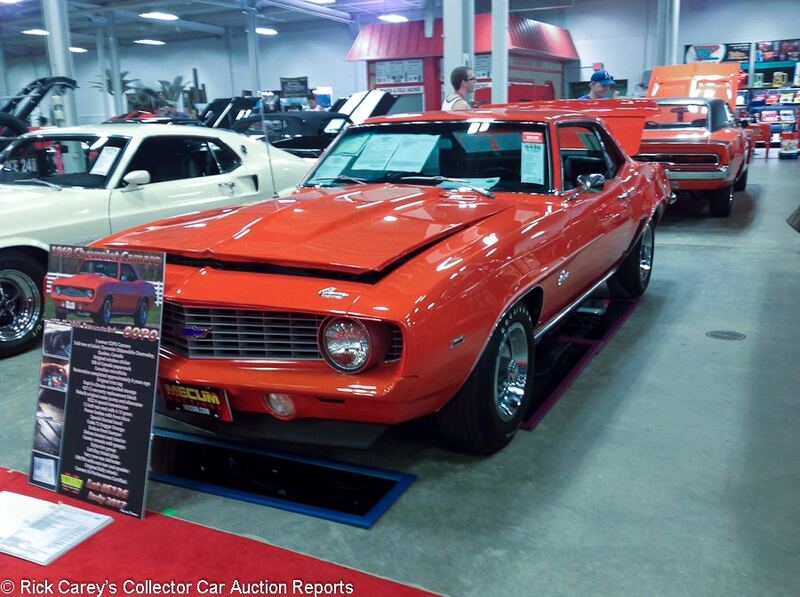 Barrett-Jackson sold it at Westworld this year for $57,200, Worldwide missed in Dallas last month on a $72,000 bid. Then it came to Indianapolis and struck gold in this transaction, a massive price for a mediocre older restored Series II E-type with miles since it was done. 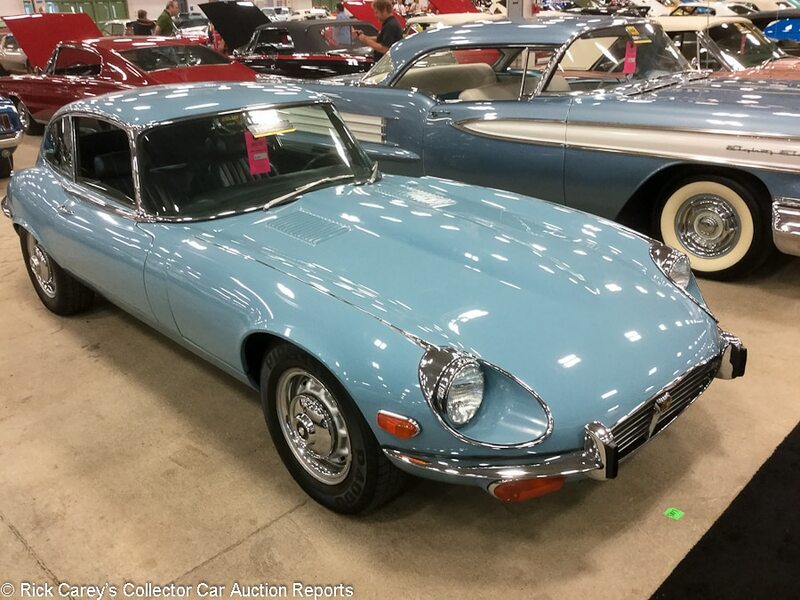 Lot # S107 1971 Jaguar XKE SIII V12 Coupe 2+2; S/N 1S71345BW; Cotswold Blue/Dark Blue leather; Estimate $35,000 – $45,000; Visually maintained, largely original, 3 condition; No Reserve; Hammered Sold at $29,000 plus commission of 10.00%; Final Price $31,900 – Automatic transmission, air conditioning, power steering, power brakes, AM/FM stereo. – Paint shows swirl marks all over but no blemishes. Brightwork is shiny but lightly scratched. Engine bay is dirty with rusted bolts and hose clamps. Light corrosion on aluminum parts. Some incorrect Phillips head screws used where bolts should be. Hoses look good, but the wires are frayed. Interior is unrestored, with the seats cracked and peeling at places. Dash is peeling back on the edges. Repainted, but otherwise a very much used and unrestored Series III 2+2. – Appropriately discounted for its automatic and sold for a price corresponding to its condition, it’s nevertheless something of a leap of faith to buy a 12-cylinder car without any service history represented. It was sold here in 2010 for $37,630. The XKE 2+2 is an interesting case that was successful when new (outselling the fixed head coupe) but is largely dismissed by collectors who value the lines of the OTS and FHC more than the practicality of the 2+2. 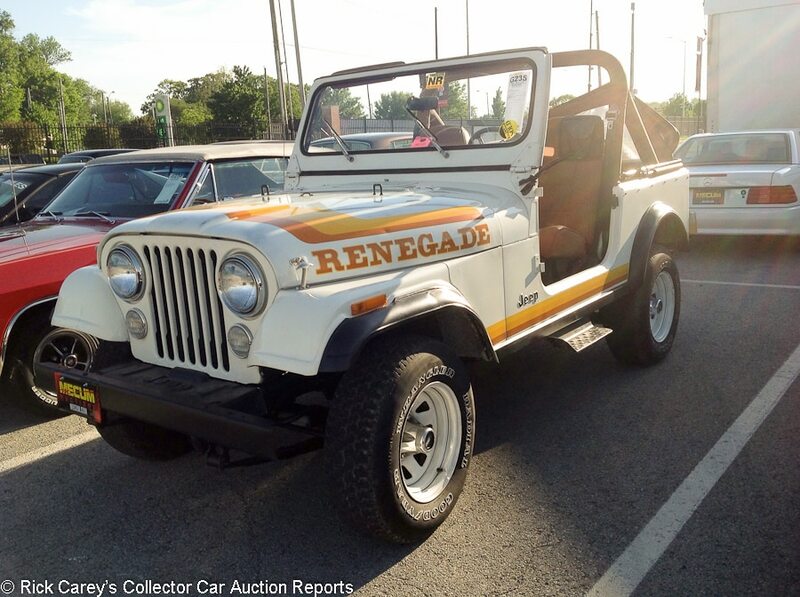 Lot # G235 1981 Jeep CJ-7 Renegade Utility Vehicle 4×4; S/N 1JCCM87A9BT073401; White, Yellow graphics/Tan; Tan top; Visually maintained, largely original, 3- condition; No Reserve; Hammered Sold at $12,000 plus commission of 10.00%; Final Price $13,200 – Goodyear Wrangler tires, rear-mounted spare. – Paint has a lot of issues from flat spots, fish eyes, scratches and cracks. Tailgate was resprayed and does not match. Sticker on the hood is very cracked. Engine bay looks decent, as it was recently cleaned and detailed. Underneath looks to have been recently sprayed to cover wear and tear. Interior is decent with seats that have been recovered, but the dash is cracked and the carpet is faded. A presentable driver in off-road-ready condition or a candidate for a straightforward restoration. 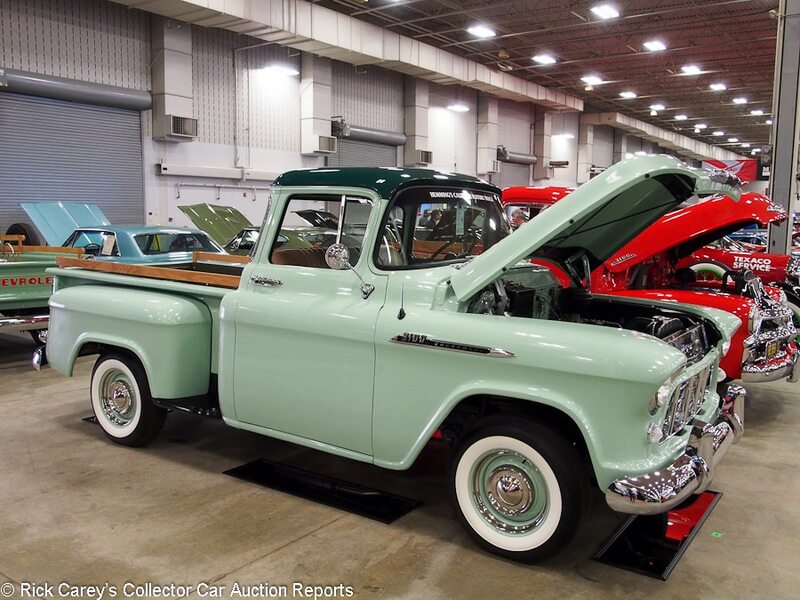 – So far at auction this year, vintage trucks and SUVs have been on the upswing, and that of course includes old CJs. This very strong result for a pretty tired example corroborates that. 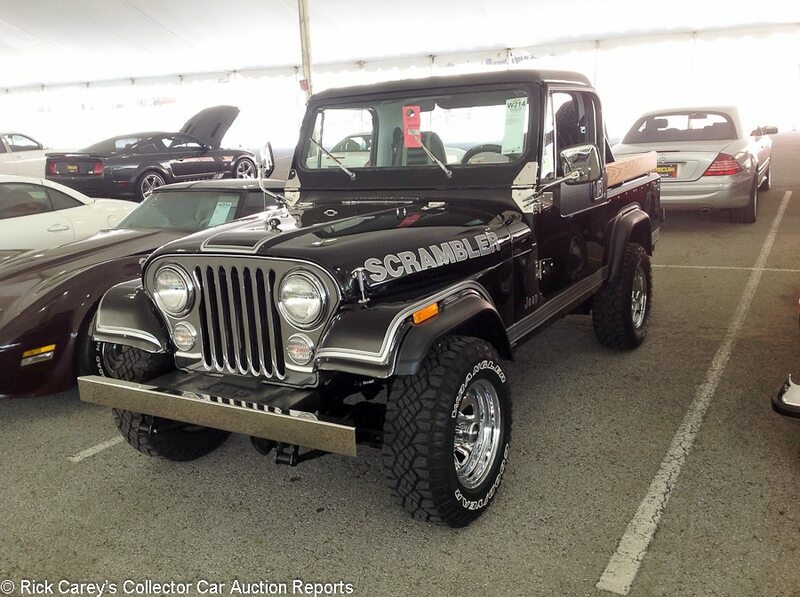 Lot # W214 1983 Jeep CJ-8 Scrambler Pickup 4×4; S/N 1JCCN88E6DT001363; Black, Silver/Black vinyl; Visually maintained, largely original, 3 condition; With Reserve; Hammered Sold at $20,000 plus commission of 10.00%; Final Price $22,000 – 258/116hp six, 5-speed, Laredo package, tilt steering column, console, tachometer. – Paint looks good with a few minor flaws and scratches. Panel fit is uneven, and the doors do not close tightly. Brightwork looks very good. Engine compartment is clean and detailed. Underneath looks good with minimal oxidation, and the rear end is leaking a little. Interior is very clean but the steering wheel has wear and tear. Not totally original but not restored, either. – The CJ-8 was a long wheelbase version of the CJ-7 and it’s quite a bit rarer, which translates to quite a bit more valuable. This was a pricy result, but you don’t often come across good examples and this was an opportunity. For reference, an ordinary CJ-7 in this condition probably wouldn’t break half this result. 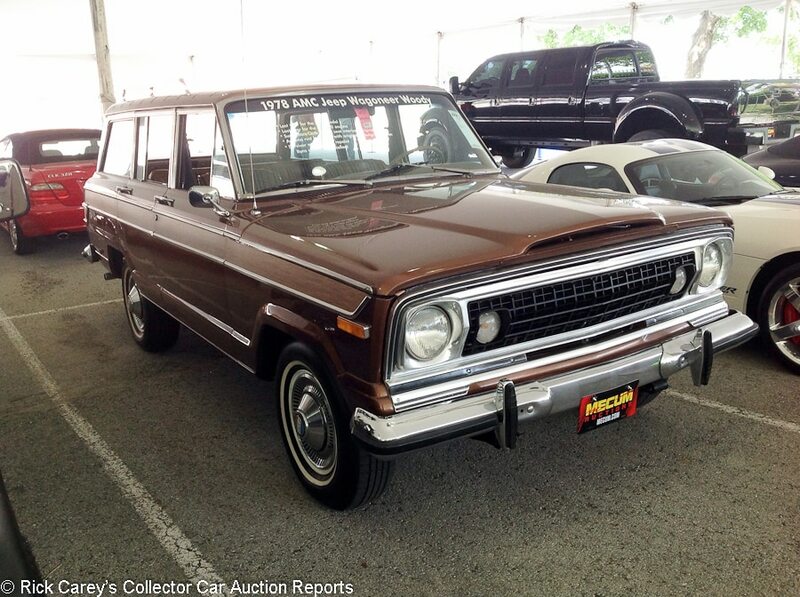 Lot # W216 1978 Jeep Wagoneer Station Wagon 4×4; S/N J8A15NZ016125; Bronze, Woodgrain/Brown vinyl and pattern cloth; Visually maintained, largely original, 3+ condition; With Reserve; Hammered Sold at $12,500 plus commission of 10.00%; Final Price $13,750 – 401/235hp, automatic transmission, tilt steering column, CB radio, aftermarket cassette stereo, wheel covers, narrow whitewalls. – 1978 was the last year for the AMC name in Jeeps. Paint looks good with some blemishes and touch ups all over. Brightwork has some dings, scratches and pitting. Gaps are uneven. Engine compartment is very clean with very few signs of wear and use. Underneath is very clean other surface rust on the exhaust. Interior looks very good, console armrest showing the most wear. Single repaint but otherwise largely original. Described as an Arizona car, supported by the absence of tin worm leavings. Showing 102,980 miles represented as actual, but most of them must have been on the highway because this is a very well preserved Wagoneer. – Strong but not excessive money for a top-of-the-line ’78 Wagoneer, which have so far lagged behind the later Chrysler-era Grand Wagoneers in terms of value growth. 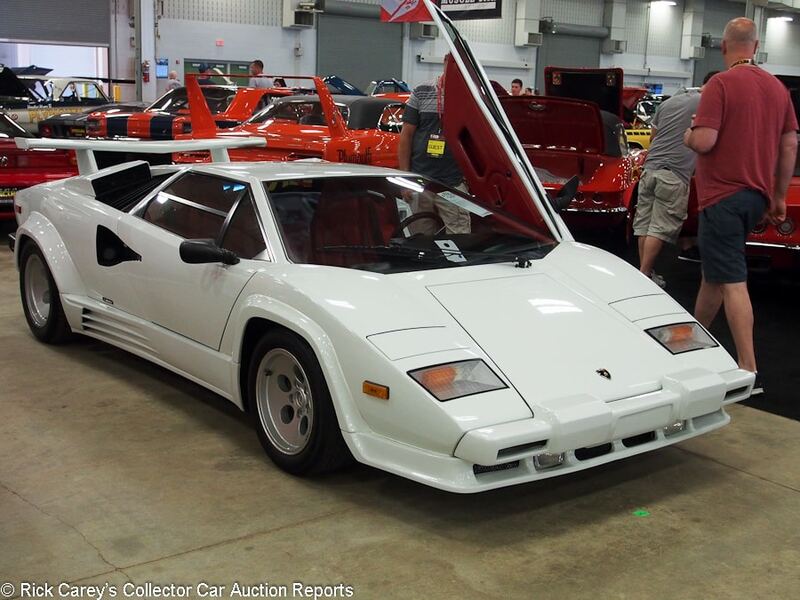 Lot # F115.1 1988 Lamborghini Countach LP5000 QV Coupe; S/N ZA9CA05AXJLA12340; White/Red leather; Unrestored original, 2- condition; With Reserve; Hammered Sold at $255,000 plus commission of 10.00%; Final Price $280,500 – OZ wheels, wing, climate control, power windows, leather-wrapped steering wheel. – Paint shows light longitudinal swirl marks throughout and early evidence of cracking on the roof. Gaps look even and the rubber trim looks new. Evidence of pooled water in the driver’s side headlight and dirt collecting in corners of the glass panels. Engine bay is clean but the engine is dull and rubber hoses look discolored. Underside looks clean as well if a bit dull. Interior is in good condition. Leather is bright and taught, with slight creases on driver’s seat. Carpet is very good. A mostly good car with slight hints of previous use, but it really should be better given the 13,795 km showing. – Not sold at a $300,000 high bid at RM Sotheby’s Arizona sale in 2016 and changed hands here at a realistic price. It is a conversation piece in White over bright Red; very Eighties. 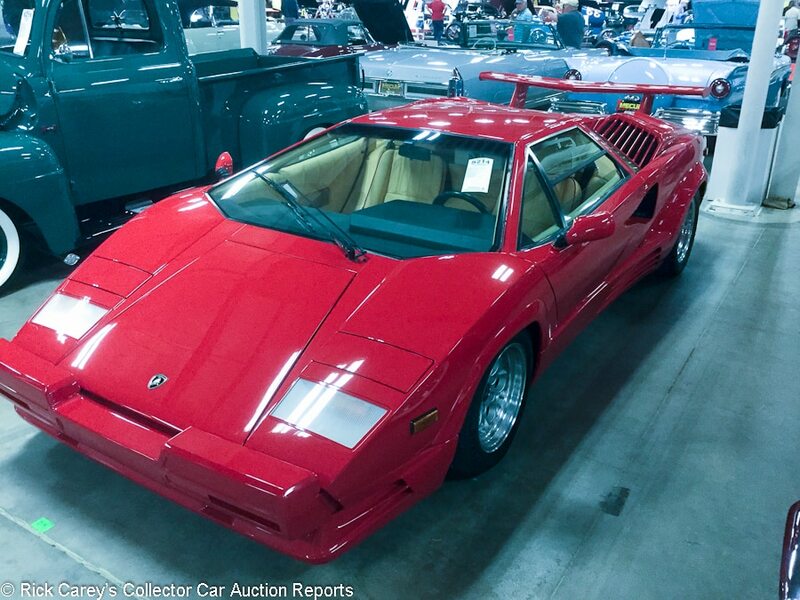 Lot # S214 1989 Lamborghini Countach Silver Anniversary Coupe; S/N ZA9CA05A3KLA12651; Rosso Siviglia/Beige leather piped in Red; Estimate $275,000 – $350,000; Unrestored original, 3 condition; With Reserve; Not sold at Hammer bid of $290,000 – OZ wheels, Pirelli tires, power windows, air conditioning. – Represented as 10,565 km from new, described as U.S. spec but with a speedometer in km. Original paint shows moderate swirl marks as well as cracking around the roof and panel gaps. Silicone has been used to repair the windshield seal. Driver’s side door won’t open with the outside latch. Engine bay is dusty but rust and corrosion free. Hoses and wires look good. Underside is rust free. Interior is worn, and the leather is loose on the seats. Scuff marks on the rest of interior leather. Carpet is faded but clean. Looking like a car with more mileage than is represented. Not a bad car, but there are plenty of better Countaches out there. The 25th Anniversary cars were the most refined of the Countaches, but also had the fussiest styling. – Sold at Mecum Kissimmee in 2015 for $378,000, then hammered not sold at Mecum Kissimmee last year at a $325,000 high bid and not sold at a $275,000 high bid at Mecum Kissimmee earlier this year. These cars were on the upswing in 2015, but that’s no longer the case today. The reported high bid here was perfectly reasonable given recent transactions for similar cars, and it was even well within Mecum’s presale estimate range. Why it didn’t change hands is suspect. 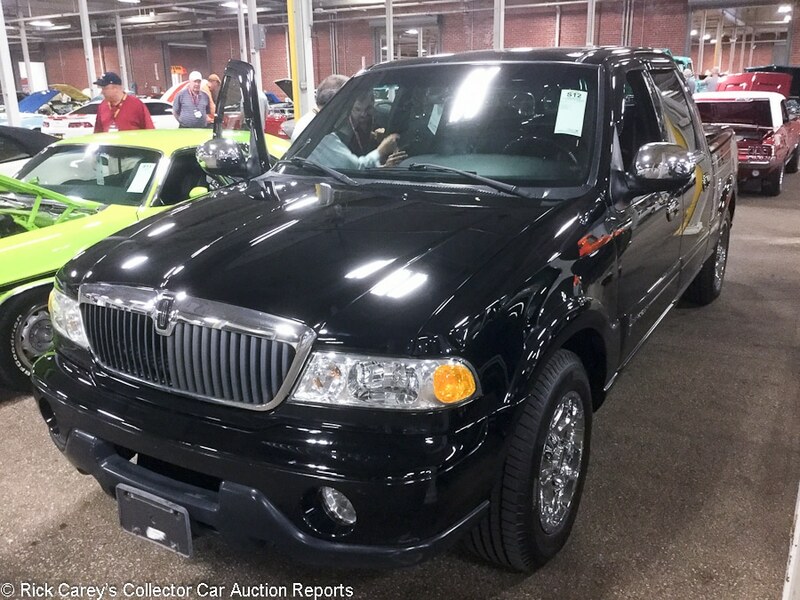 Lot # S012 2002 Lincoln Blackwood Crew Cab Pickup; S/N 5LTEW05A72KJ00283; Black/Black leather; Unrestored original, 3+ condition; With Reserve; Hammered Sold at $14,000 plus commission of 10.00%; Final Price $15,400 – Fog lights, chromed wheels, power windows, air conditioning, power seats, sunroof, CD stereo. – Paint shows deep swirl marks and significant rock chipping on front bumper. Brightwork is also aged. Rubber trim looks weather worn. Bed shows some scuffing on the inside silver trim. Engine bay is slightly dirty, and there is rust on exhaust. Underside shows some rust. Interior looks recently detailed but the seats are cracking and the steering wheel leather is worn smooth. The carpet in the bed (yes, there is carpet in there) is lightly worn. An average used truck in every sense of the term. – The Blackwood was essentially an F-150 in a rented tuxedo. Less than 3,500 were made, not in order to make it exclusive but because nobody wanted to pay the ludicrous $50,000-plus asking price as Lincoln struggled to find its identity. They still seem a bit silly 15 years on, and the seller was lucky to get this much for it. 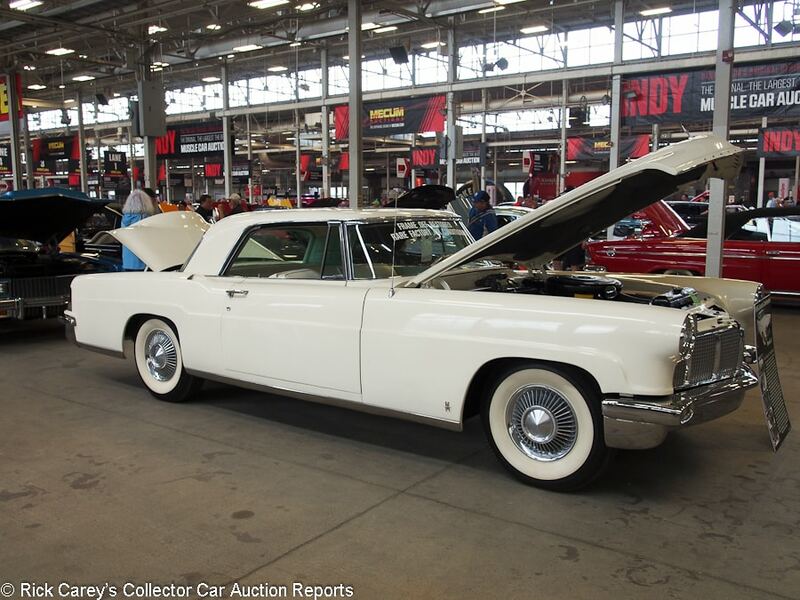 Lot # T091 1956 Lincoln Continental Mark II Coupe; S/N C56B1943; Ivory/Ivory, Light Green leather; Older restoration, 3+ condition; Reserve; Not sold at Hammer bid of $50,000 – 368/285hp, automatic, air conditioning, power steering, power brakes, Town & Country radio, power seat, power windows, wheel covers, bias ply wide whitewall tires. – Dull old paint with a smattering of edge chips. Sound but worn and aged upholstery and interior trim. Decent chrome. Restored many years ago to the much less stringent standards of the time and now presents like a well maintained used car. – Back in 1991, twenty-six years ago, this Continental was sold at The Auction in Las Vegas for $7,140 in beaten up, dilapidated, nearly parts car condition: “older paint, nicked and dinged, rust in sills and around trim, vinyl interior, cracked dash; not a nice car.” It’s obviously had a restoration since then, but it is now showing age and plenty of miles. The reported high bid was adequate for this Mark II’s condition. 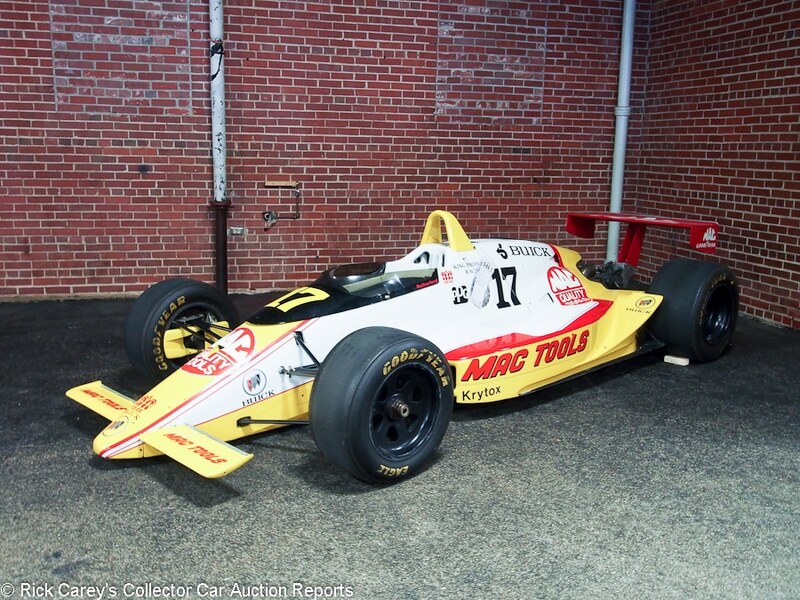 Lot # S044.1 1987 Lola T8700 Indy Car; S/N HU12; White, Yellow “Mac Tools”/None; Competition car, original as-raced, 3- condition; Reserve; Hammered Sold at $18,000 plus commission of 10.00%; Final Price $19,800 – 3.3 Buick turbo V-6. – Raced at Indy by Kenny Bernstein’s King Racing, driven by Johnny Rutherford in his final Indy start, classified 22nd. Display car condition. – A neat piece of decor for garage or man cave, but not destined to be enshrined in any Indy car collection and this is a realistic price for it that should make the seller happy. 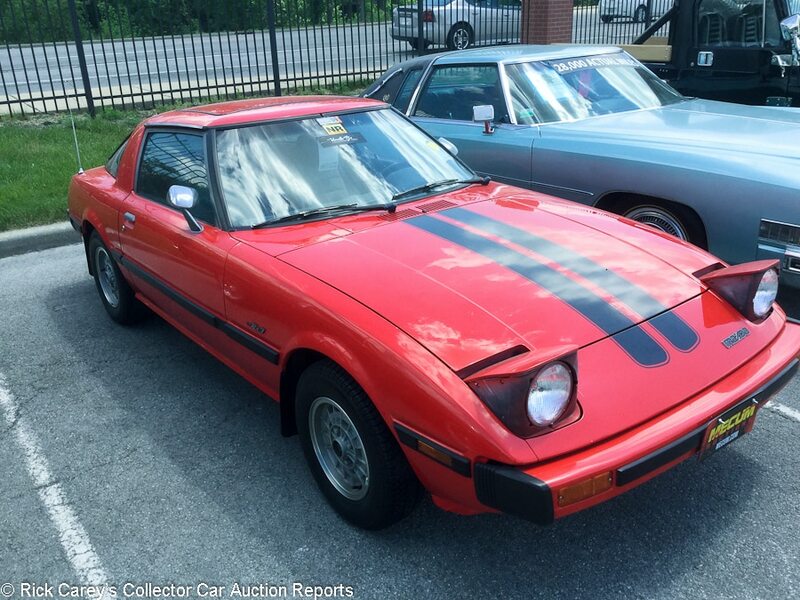 Lot # G200 1979 Mazda RX-7 Coupe; S/N SA22C5114471; Red, Black stripes/Black vinyl with Gray cloth inserts; Unrestored original, 4+ condition; No Reserve; Hammered Sold at $3,750 plus commission of 13.33%; Final Price $4,250 – Air conditioning, rear window slats. – From the ‘Uncle TJ’s collection.’ Paint shows significant swirl marks, fading, moderate chips and bubbling. Cracks in the indicator lights. Rubber trim is dry and falling apart. Engine compartment is dirty and shows corrosion on all aluminum parts and even rust showing on all non-painted metal parts. Cracked rubber hoses and frayed wires. Underside has light but even surface rust all over. Dirty, cracked and faded upholstery with missing buttons and dangling wires. Represented with 77,450 actual miles, but it’s a very tired car. – First generation RX-7s are great budget classics that are both fun and dependable, and the usual rotary engine bugs like apex seal failure and burning oil shouldn’t discourage anybody from considering one. They have been so cheap for so long, though, that worn out examples like this are unfortunately the norm. The result here is about what this one is worth. 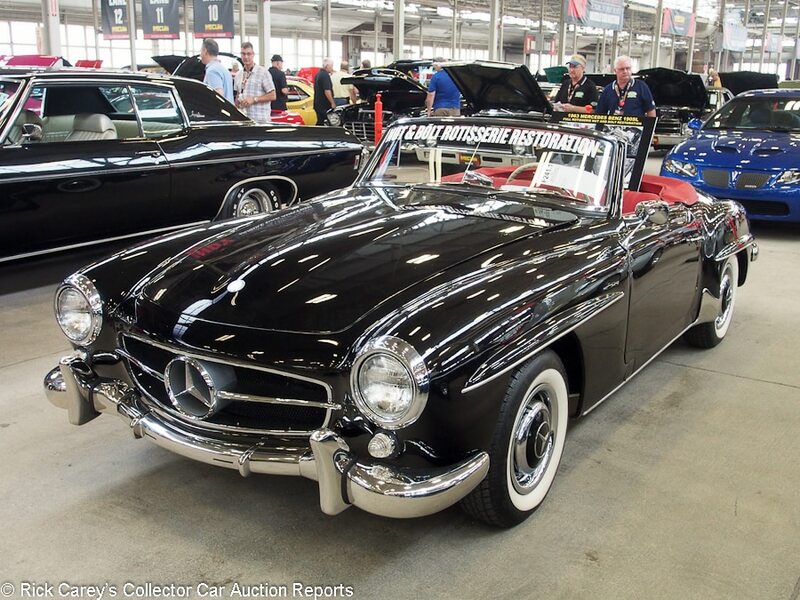 Lot # F241.1 1963 Mercedes-Benz 190SL Convertible; S/N 12104210024218; Black/Red leather; Black cloth top; Recent restoration, 2- condition; With Reserve; Hammered Sold at $110,000 plus commission of 10.00%; Final Price $121,000 – Becker Europa AM-FM, hubcaps, trim rings, whitewalls, Solex carbs. – This is the opposite of most auction cars, The engine compartment is immaculate, fresh and like new. The chassis and underbody are the same. The interior, gauges and dash are like new. And the repaint is atrocious. Fisheyes, scrape on the hood, chip on the front of the hood. – It is really difficult to figure out what happened to this 190SL but it is at least plausible that the restoration got underway doing the engine and chassis to high standards, then rushed to completion with an Earl Scheib repaint. The price it brought is difficult to appreciate because this result impinges upon the value range for carefully, freshly restored 190SLs. Maybe the new owner owns a body shop with a good painter. Lot # F104 1964 Mercedes-Benz 230SL Roadster; S/N 11304210002664; Light Yellow, Havana Brown hardtop/Tan; Brown cloth top; Estimate $65,000 – $85,000; Visually maintained, largely original, 3+ condition; With Reserve; Not sold at Hammer bid of $42,500 – 4-speed, Blaupunkt AM-FM, hubcaps, trim rings, Bridgestone blackwall tires, Euro headlights, two tops. – Good paint, chrome and interior. Wheelwells have been repainted over old undercoat. The engine compartment is unrestored but unusually clean and orderly. A reassuring, well equipped and attractive cosmetically redone SL. 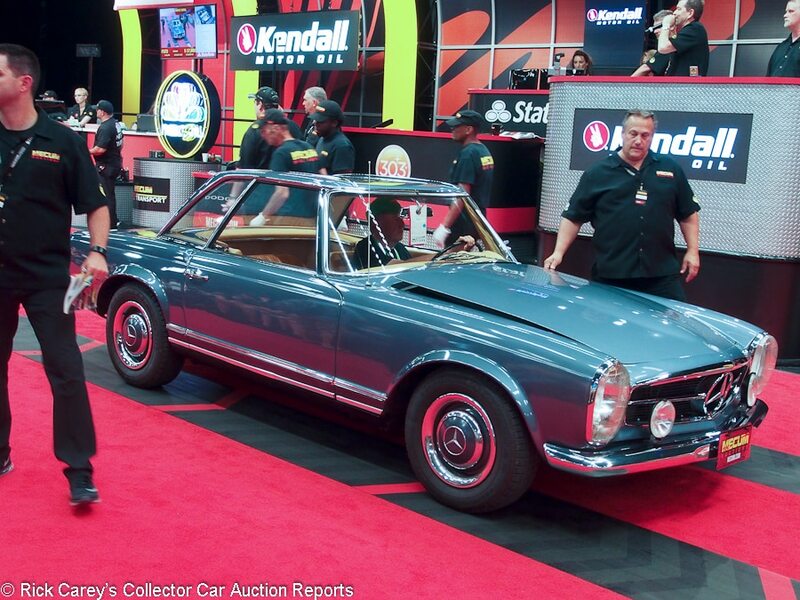 – This car was reported bid to $55,000 at Mecum Monterey last August and the SL market hasn’t done anything to abet the consignor’s desire to get more for it. Right now the car and the expectations are chasing a declining market and it’s time to take any reasonable money offer. Lot # F173 1964 Mercedes-Benz 230SL Roadster; S/N 11304210004879; Blue, Blue hardtop/Saddle leather; Black cloth top; Estimate $45,000 – $60,000; Visually maintained, largely original, 3- condition; With Reserve; Hammered Sold at $31,000 plus commission of 10.00%; Final Price $34,100 – 4-speed, two tops, Euro headlights, foglights, Sparkomatic stereo, hubcaps, trim rings, Goodyear blackwall tires. – Sound repaint but full of dirt inclusions and some cracks and shrinkage. Prep is visible under the paint. Good new upholstery with old interior trim. The varnish is cracking on the dashtop wood trim. The engine compartment is original and has been cleaned up and received some recent maintenance work. Original undercoat underneath. Not a confidence builder. 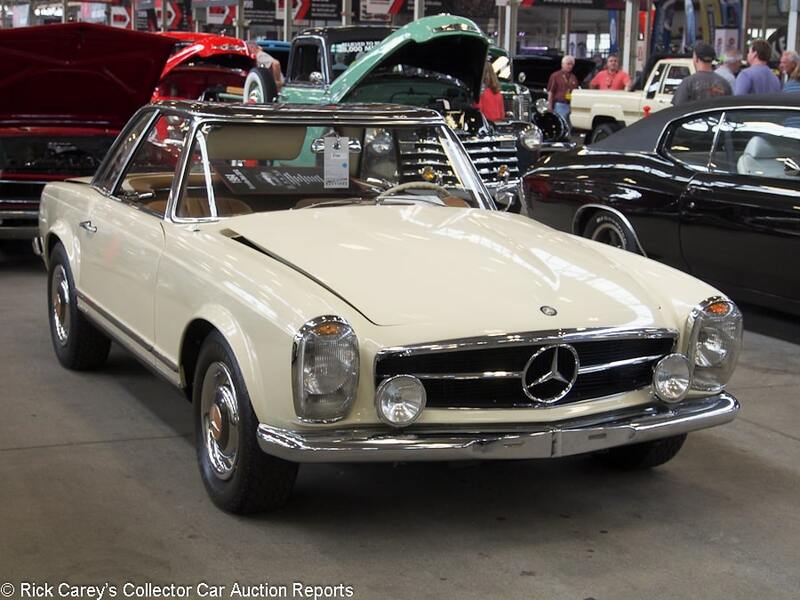 – Given “a lick and a promise” for the auction, this is a suspect 230SL and the bidders suspected it enough that this was all they were willing to pay. The consignor’s acceptance of the bid proves how right the bidders were. 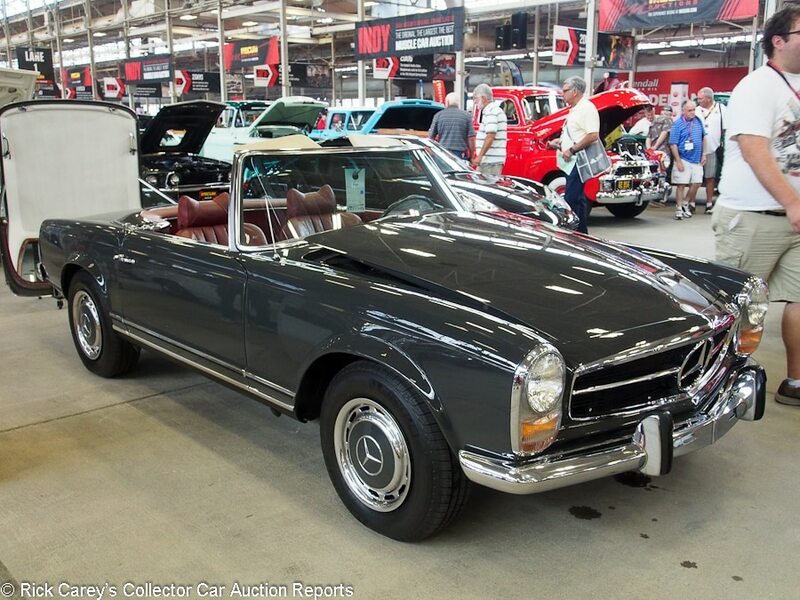 Lot # F121 1969 Mercedes-Benz 280SL Roadster; S/N 11304412009998; Dark Grey, Dark Grey hardtop/Dark Red vinyl; Black cloth top; Estimate $65,000 – $75,000; Visually maintained, largely original, 3+ condition; With Reserve; Hammered Sold at $54,000 plus commission of 10.00%; Final Price $59,400 – Automatic, Blaupunkt AM-FM, wheel covers, Michelin blackwalls, two tops. – Thick repaint, good chrome and interior. The wheelwells have been resprayed black over old undercoat. The engine compartment is clean, orderly and unrestored. The unusual colors help this cosmetically maintained driver quality SL. – Once one of the hotter classic cars in the market, the W113-series Mercedes SLs have seen demand and prices soften over the past year, and the people who are still looking for one want a top-notch example. Driver quality examples aren’t exactly sought after at the moment, as the lackluster bidding and modest result show. 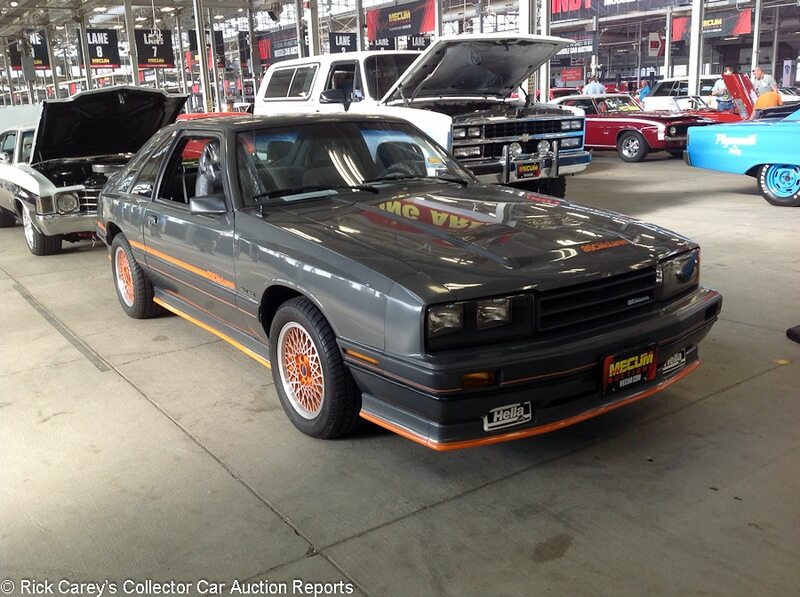 Lot # W098 1986 Mercury Capri ASC McLaren Fastback; S/N 1MEBP79MXGF615762; Smoke Charcoal Gray Metallic, Orange stripes/Gray cloth; Unrestored original, 2 condition; With Reserve; Not sold at Hammer bid of $25,000 – 302/200hp, automatic, cassette stereo, fog lights, automatic, air conditioning, power windows. – Paint looks very good, although the plastic fender extensions are a little faded. Panel gaps are very good. Engine compartment is very clean with only some slight wear and dirt. Underneath is clean, with just a little surface rust on the lower A arms and fuel/brake line brackets. Interior looks excellent and has no signs of wear. A very well kept car showing 692 believable miles, although it doesn’t look showroom fresh. Reportedly number 109 of 115 coupe versions built. – 1980s Capris are already relatively obscure compared to their Fox-body Mustang cousins, but the ASC McLaren versions are next level oddballs. It was mostly cosmetic stuff like the box flares, decals and sports seats that distinguished these ASC-built Capris that were available in both convertible and coupe form, but they did also have McLaren wheels and suspension as well as a hotter cam. Given how hot Fox bodies have been lately, one would expect this car to do quite well and the seller is arguably reasonable to hold out for more than the reported high bid. Then again, this car is so obscure that it’s hard to put a value on. Lot # S186 1966 Mercury Comet Cyclone GT Convertible; S/N 6H28S605711; Red/White; White top; Estimate $35,000 – $50,000; Older restoration, 3+ condition; No Reserve; Hammered Sold at $29,000 plus commission of 10.00%; Final Price $31,900 – 390/335hp, automatic transmission, power steering, AM radio, center console, gauges, 3.25 gears, red line tires. – The paint is very good with only a few very minor scratches. Striping is starting to peel off in a couple places. Brightwork looks good with some minor scratching throughout and pitting on the rear sail panel. Convertible top is showing some wear and grime. Engine compartment is clean with some signs of use and paint missing in a few spots. Underneath looks good with some minor surface rust showing on the frame rails. Interior looks very good with wear on the driver’s door panel near armrest. A lightly aged older restoration. – The ’66 Comet Cyclone GT was essentially Mercury’s answer to the Pontiac GTO, but it wasn’t nearly as successful. They’re still attractive, quick early muscle cars, though, and a pretty solid value today compared to a similarly equipped GTO. This result was no less than deserved for an attractive but flawed Cyclone GT convertible, but still a lot of performance and rarity per dollar, especially after it was reported sold here in 2010 for $43,460, 27% more than it brought today. 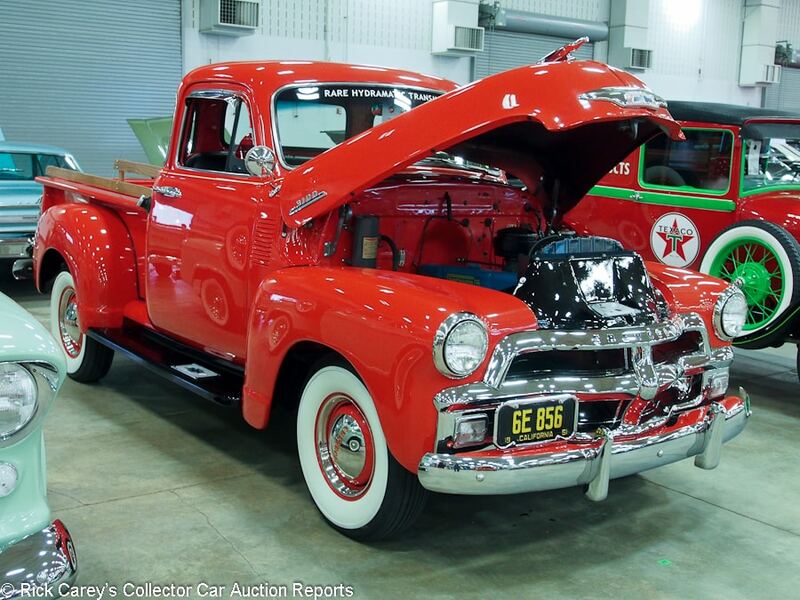 Lot # F164.1 1950 Mercury M47 Pickup; S/N MD83H5031883; Red, Black fenders/Gray vinyl; Estimate $40,000 – $55,000; Older restoration, 2+ condition; With Reserve; Hammered Sold at $42,000 plus commission of 10.00%; Final Price $46,200 – 239/100hp, 3-speed, chrome hub caps and trim rings, whitewalls, dual mirrors, heater, radio, wood bed. – Paint looks very good with some small scratches on the front fenders. Wood in the bed looks amazing. Brightwork is very good. Panel fit is a little uneven. Engine compartment is clean with light signs of use. Underneath is very clean with a newer muffler, but there is surface rust on the rest of the exhaust. Interior looks great, with some wear on the edges of the steering wheel and some pitting in the center. A rarely seen Mercury pickup (Mercury pickups were only built until 1967 for the Canadian market and are essentially identical to the U.S. Ford-badged counterparts) and exquisitely restored in the not too distant past. – Sold at Barrett-Jackson Reno/Tahoe just three years ago for $29,700, making this a great example of how far the vintage truck market has come. The rarity of Mercury pickups in the U.S. earns them a slight premium over their Ford F-1 counterparts. 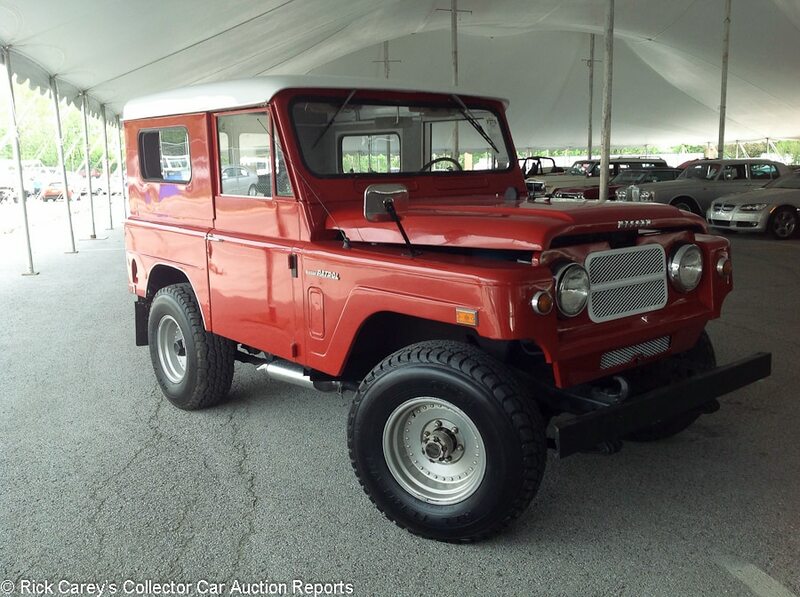 Lot # F276 1969 Nissan Patrol Utility Vehicle 4×4; S/N L6021813; Red/Gray, Black vinyl; White roof top; Truck restoration, 3- condition; With Reserve; Hammered Sold at $11,000 plus commission of 10.00%; Final Price $12,100 – Dual mirrors, rear-mounted spare, 4-wheel drive, bench seat. – Paint looks good with some overspray on the door hinges. Panel gaps are a little uneven. Nissan emblems on the sides are losing plating. Most of the engine bay was sprayed crudely with bed liner. The underbody was undercoated on the outer frame rails, but there is surface rust in the middle. The interior also looks to have been crudely sprayed over dust and dirt. Seats look new. A rarely seen short wheelbase Nissan Patrol and represented with a body-on restoration, but it only takes a second to see how cheaply it was done. – Suddenly all those expensive Toyota FJ40s we see at collector car auctions make even less sense. Here is essentially the same thing but a whole lot rarer and with a Nissan badge bought for about half of what the equivalent Toyota in this condition would bring. It’s not the outdoorsman’s icon that the FJ is, but the Nissan Patrol looks to be a solid value if you can find one. Most of them seem to be trundling militias around the Middle East. 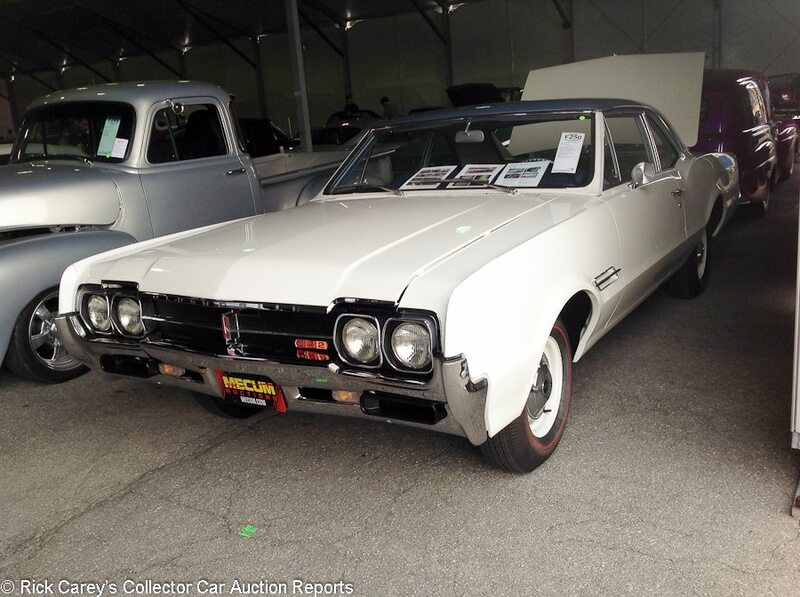 Lot # S080.1 1969 Oldsmobile 4-4-2 Hurst 2-Dr. Hardtop Holiday; S/N 344879M366528; White, Gold stripes/Black vinyl; Visually maintained, largely original, 3+ condition; No Reserve; Hammered Sold at $53,000 plus commission of 10.00%; Final Price $58,300 – 455/380hp, automatic transmission, factory air conditioning, power steering, power trunk, power brakes, AM/FM radio, Dunlop GT Qualifier tires. – The older paint looks good other than a few chips on the panel edges. Panel fit is very good. Brightwork is showing age with lots of scratches, pitting and dings. Engine compartment looks good other than some discoloration to the heads and intake. Underneath is clean with surface rust on the exhaust. Interior is very good with only the steering wheel showing wear. With the same owner since 1977. Not totally original but not fully restored and currently in attractive driver condition. – This result is probably less than the consignor hoped for but is not sufficiently inexpensive to call it a bargain; call it a good value and enjoy it. 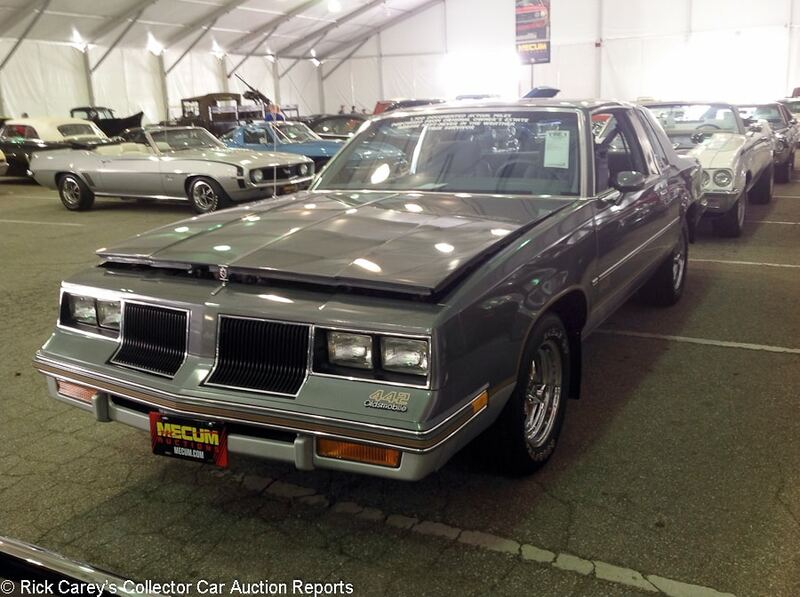 Lot # T096.1 1986 Oldsmobile Cutlass 4-4-2 2-Dr. Hardtop; S/N 1G3GK4792GP369934; Gray/Gray cloth; Unrestored original, 2 condition; With Reserve; Hammered Sold at $22,000 plus commission of 10.00%; Final Price $24,200 – 307/180hp, automatic, tilt steering column, AM/FM cassette stereo, power windows, power locks, power brakes, Rally wheels, Eagle GT tires. – Showing 1,715 miles. Paint looks excellent with only a few small chips on the panel edges and on the rear bumper. Panel fit looks great. Engine compartment looks hardly run with only a bit of dirt and grime. Underneath shows almost no sign of use or age. Interior is spotless without even the slightest hint on wear. It still smells new. A time-warp example with 1,715 miles from new. – After dropping the Hurst/Olds package for 1985, Oldsmobile still wanted a performance-oriented Cutlass and revived the 4-4-2 name with a higher output engine, F41 suspension, and stickers. With 180hp and boring G-body styling, though, they’re nothing to write home about and why someone would keep one like this in such great shape is a mystery. A few people who had one of these when they were 17 must have been in the room in Indy, because only nostalgia can explain why someone would pay 20 grand for an ’85 Cutlass. 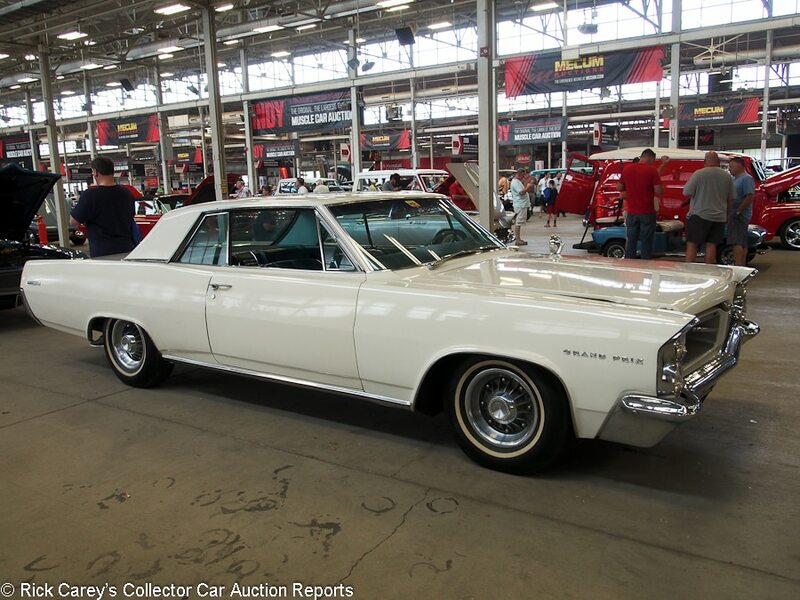 Lot # F250 1966 Oldsmobile Cutlass 4-4-2 2-Dr. Sedan; S/N 334076M393703; White, Blue roof/Blue vinyl with cloth inserts; Recent restoration, 2+ condition; With Reserve; Hammered Sold at $92,000 plus commission of 10.00%; Final Price $101,200 – 400/360hp, three deuce intake, 4-speed, Tru-Trac rear end with 4.11 gears, radio and heater delete, dog dish hubcaps, red line tires, Protect-O-Plate, floor shift. – Paint is excellent. Panel gaps are even. Brightwork all looks excellent. Engine compartment is very clean and showing very light signs of use. Underneath is spotless. Interior all looks brand new. Body-off restored recently and to better than new standards but with a “date code correct” engine. – How rare is this 4-4-2 with three deuces? Very rare, and that feeds the price it brought along with the quality of the restoration, but even at that someone wanted it very badly to come up with this much money. 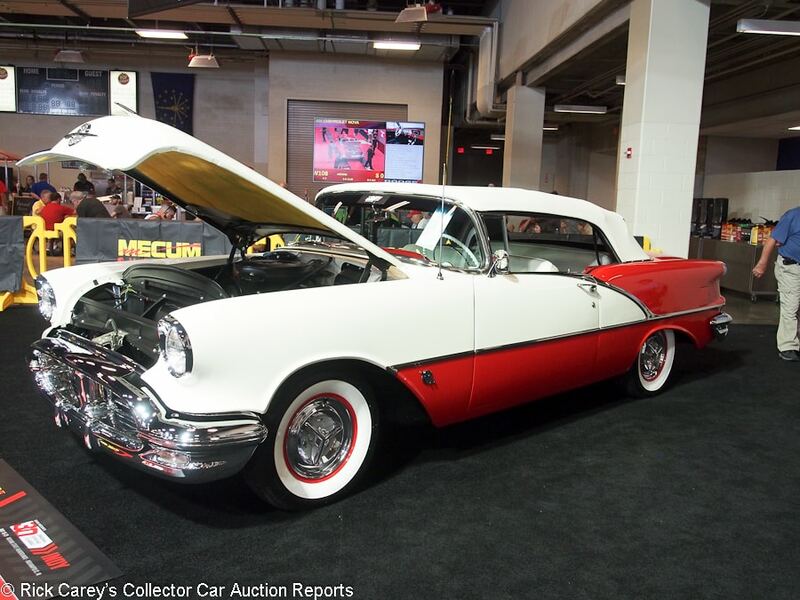 Lot # S118.1 1956 Oldsmobile Super 88 Convertible; S/N 568M36274; Red, white/Red, White leather; White vinyl top; Estimate $60,000 – $75,000; Recent restoration, 2+ condition; With Reserve; Hammered Sold at $72,000 plus commission of 10.00%; Final Price $79,200 – 324/230hp, automatic, power brakes and steering, spinner wheel covers, wide whitewalls. – Excellent paint, chrome, top and interior. Doors don’t quite close flush but the gaps are even. Trunk lid fit is very good. Engine compartment and underbody are like new. A show quality Oldsmobile. – This result is no more than could be expected for a ’56 Chevy Bel Air convertible with Power Pack V8, giving the new owner a more rare, powerful and distinctive automobile with luxury equipment for a reasonable price. It is a sound value in this transaction, an astute acquisition for a collector not fixated on a Chevy. 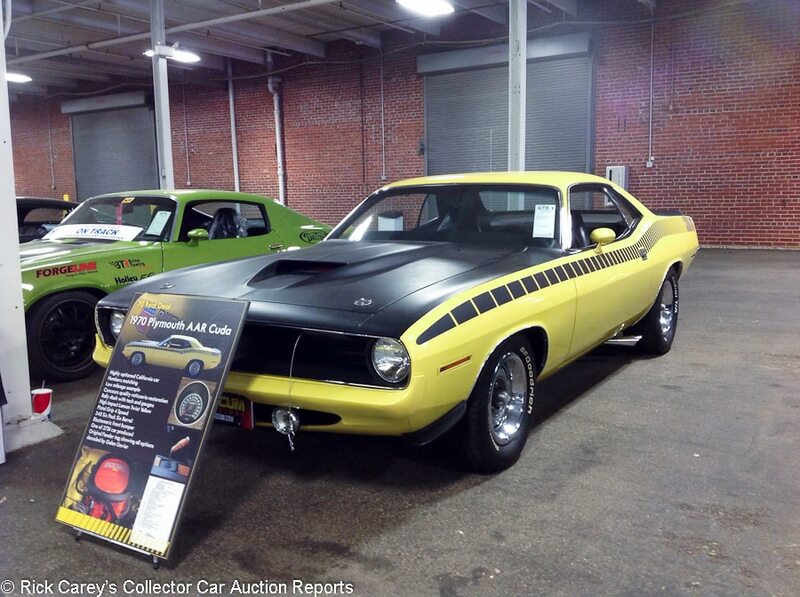 Lot # S070.1 1970 Plymouth ‘Cuda AAR 2-Dr. Hardtop; S/N BS23J0B294233; Lemon Twist Yellow, Black/Black vinyl; Older restoration, 2- condition; With Reserve; Hammered Sold at $75,000 plus commission of 10.00%; Final Price $82,500 – 340/290hp, 6-Barrel, 4-speed, pistol grip shifter, AM radio, hood pins, hood scoop, fog lights. – Represented as 24,545 miles from new. Paint looks very good other than a few small chips on the panel edges. Panel fit is very good. Brightwork is very good with some scratching around the door windows. Engine compartment is very clean with only light signs of use. Underneath looks great with new undercoating. Interior is very good with very little to no wear. Console right next to the shifter is cracked. Represented with a concours restoration, but stones were left unturned and this car is certainly not perfect. – Sold at Russo and Steele in Arizona in 2007 for $110,000, then at Barrett-Jackson Scottsdale in 2009 (not a good time to be selling muscle cars) for $73,700. Muscle car prices have since recovered to their pre-Recession levels in many cases, but this was still a modest result for mostly very good AAR ‘Cuda. 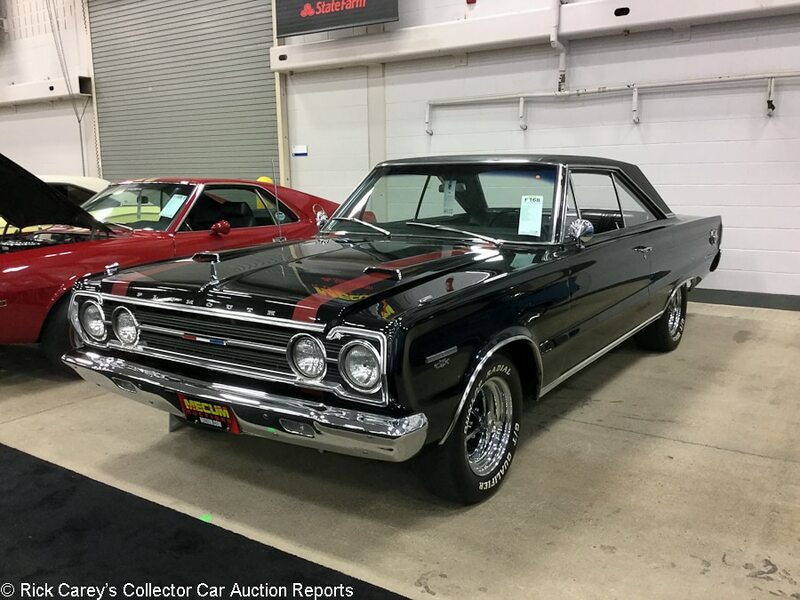 Lot # F168 1967 Plymouth GTX 2-Dr. Hardtop; S/N RS23L77221110; Black, Red stripes, Black vinyl roof/Black vinyl; Estimate $50,000 – $75,000; Older restoration, 3+ condition; With Reserve; Not sold at Hammer bid of $34,000 – 440/375hp, 4-speed, pushbutton radio, Dunlop GT Qualifier tires, bucket seats, console, Hurst shifter, Edelbrock intake, Dana 60 rear end, aftermarket sway bar, dual mirrors, aftermarket CD stereo. – From the Clarence Arnoldussen collection. First year for the GTX. Paint looks very good. Panel fit is very good. Vinyl roof looks new. Brightwork looks good other than some pitting around the tail lights. Engine bay is clean, but it looks like the engine was sprayed in the car and there is engine paint on the crossmember. Underneath is very clean with light road wear. Interior looks good, but the door sill plate is pretty beat up. The door panels have wear. The center of the steering wheel and the console have some pitting. A basic older restoration that doesn’t have any major needs but is certainly no show car. – With no representation of the engine’s originality and an inconsistent driver quality presentation the consignor has unrealistic expectations of value. Even though the reported high bid is modest, it is definitely in the ballpark enough so the consignor should have lifted the reserve and seen if it would spark another round of bidding. Lot # S157 1933 Plymouth PD Coupe 5-Window; S/N 2145682; Black/Brown cloth; Estimate $55,000 – $75,000; Older restoration, 2- condition; With Reserve; Hammered Sold at $37,000 plus commission of 10.00%; Final Price $40,700 – 190/70hp, 3-speed with overdrive, red wire wheels, wide whitewalls, trim rings, dual enclosed sidemounts, rumble seat, luggage rack, dual taillights. – Good older paint, interior and chrome, scant evidence of use. Engine compartment and chassis are nearly like new. Not fresh, but very good. – Finally, something that no one, ever, will characterize as a Muscle Car, but a neat little 5-window coupe with deft Plymouth styling and design. The new owner could be forgiven for feeling this was an advantageous acquisition of a well restored and rarely seen automobile. 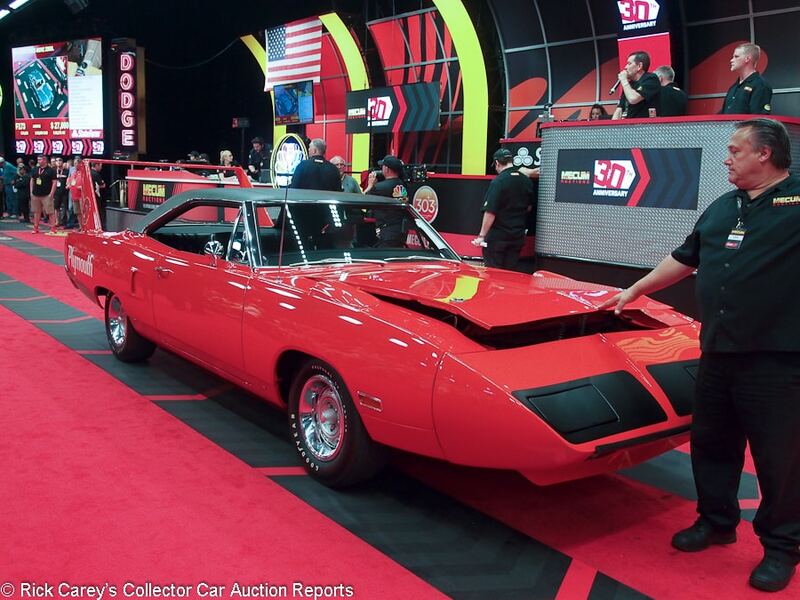 Lot # F174 1970 Plymouth Road Runner Superbird Hemi 2-Dr. Hardtop; S/N RM23R0A166207; Tor Red, Black vinyl roof/Black vinyl; Estimate $300,000 – $375,000; Visually maintained, largely original, 2- condition; With Reserve; Hammered Sold at $230,000 plus commission of 10.00%; Final Price $253,000 – 426/425hp Hemi, automatic, power brakes, power steering, Rally wheels with trim rings, Polyglas GT tires, pushbutton radio, bench seat, no tail stripe. – 9,812 miles, represented as matching numbers engine and mostly original but it has had extensive paintwork including over the old undercoat in the wheelwells. Broadcast sheet documented. Sound paint, chrome and upholstery. – Sold at Barrett-Jackson WestWorld in 2003 for $145,800 when the odometer showed 9,619 miles. It is at 9,812 now, just three more than it showed when it was reported sold at Kissimmee four months ago for $242,000. While this result is 4.5% more than at Kissimmee, after commissions the seller was holding an empty bag. 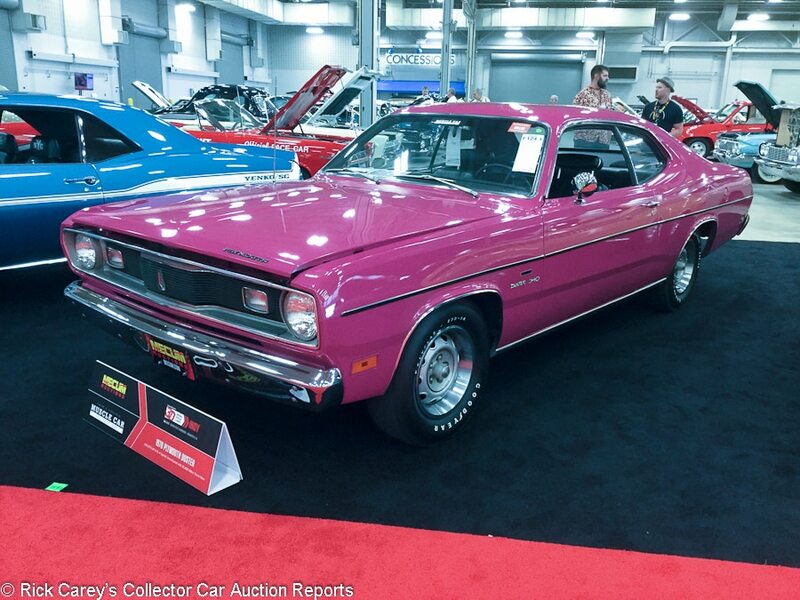 Lot # F124.1 1970 Plymouth Valiant Duster 340 2-Dr. Hardtop; S/N VS29H0B417260; Moulin Rouge/Black vinyl; Estimate $40,000 – $60,000; Unrestored original, 2- condition; With Reserve; Hammered Sold at $46,000 plus commission of 10.00%; Final Price $50,600 – 340/275hp, 4-speed, bench seat, floor shift, broadcast sheet, Polyglas tires, 3.91 gears. – Original paint looks very good for its age with some scratches and chips on the panel edges. Panel fit is very good. Brightwork is lightly scratched from age but shiny, and there are small chips in the front bumper. The engine compartment is showing some dirt and grime, and paint is peeling from the block. Underneath looks good, with some signs of a fluid leak near the transmission. Interior is excellent, and the only signs of wear are on the shifter handle. Showing 18,366 miles, which are represented as actual. Sold new in Massachusetts and was later part of a collection in Europe. Documented with two broadcast sheets, original window sticker, vehicle order, owner’s manual and paper. 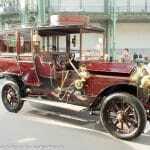 It presents as all original, and must be one of the best preserved Dusters around. – The adage in this hobby that something is only original once resonates among collectors of just about any kind of car, including Mopar muscle. This remarkably original and unmolested Duster 340 was a singular opportunity for such collectors. You don’t often see these cars at auction in any kind of condition, let alone almost perfectly preserved. The price was huge, but not outrageous for the bidders who knew that they’ll never come across another one like this or so thoroughly documented. 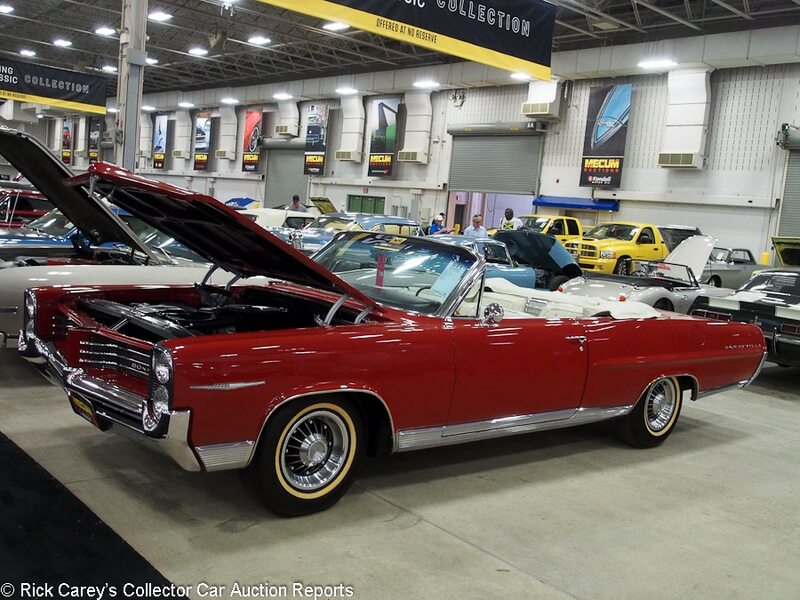 Lot # S091 1964 Pontiac Bonneville Convertible; S/N 884P173241; Engine # 366327 27P; Red/Parchment vinyl; White vinyl top; Older restoration, 2- condition; No Reserve; Hammered Sold at $32,000 plus commission of 10.00%; Final Price $35,200 – 389/303hp, automatic, power steering and brakes, 8-lug wheels, narrow whitewalls, pushbutton radio, bench seat. – Represented as the original engine. Very good repaint with some small dirt inclusions and a little orange peel along the side window trim. Driver’s door gaps are uneven, passenger’s taper. The engine compartment is like new, but there is some dust in the nether regions. Very good chrome and stainless. Painted hood hinges. Lots of observations, but none of them amount to much in what is an attractive Bonneville with a quality restoration now showing some age. – Sold here seven years ago for $29,680, it brought little enough more today and is a lot of car for the money. No one should be in the least reticent to drive and enjoy this Pontiac. 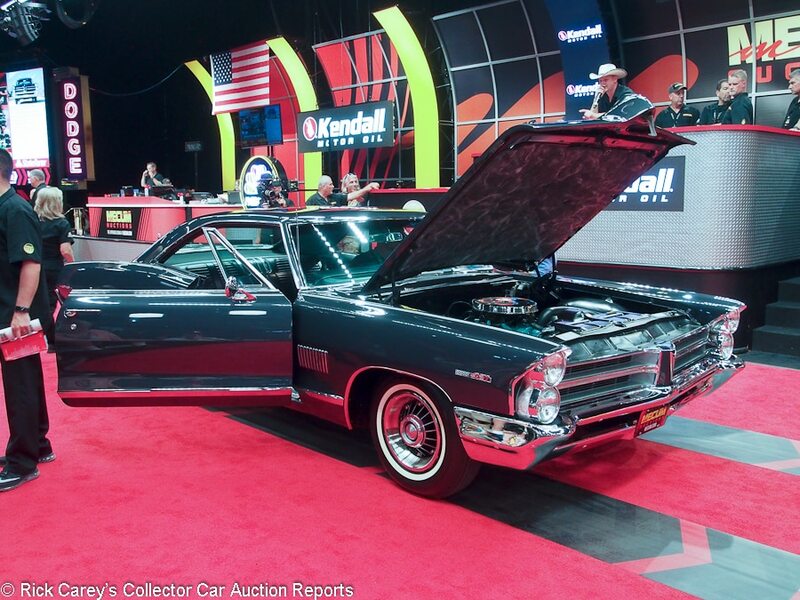 Lot # T169 1965 Pontiac Catalina 2+2 2-Dr. Hardtop; S/N 52375P320970; Engine # YH; Nightwatch Blue/Blue charcoal vinyl; Estimate $55,000 – $70,000; Recent restoration, 2- condition; With Reserve; Hammered Sold at $55,000 plus commission of 10.00%; Final Price $60,500 – 421/338hp, automatic, automatic, power steering and brakes, 8-lug wheels with trim rings, buckets and console, AM-FM, sport steering wheel, factory, tach, bias ply narrow whitewalls. – Pitted rear fascia chrome molding and grille trim, otherwise very good chrome, paint and interior. The engine compartment is like new, as is the underbody. Represented as the original drivetrain. Let down by some last minute chrome trim issues but all in all a superb Catalina 2+2. – This is 2+2 convertible money, but the top doesn’t go down on this one. The bidders were obviously impressed by the condition and the 421 engine but their impression got carried away. 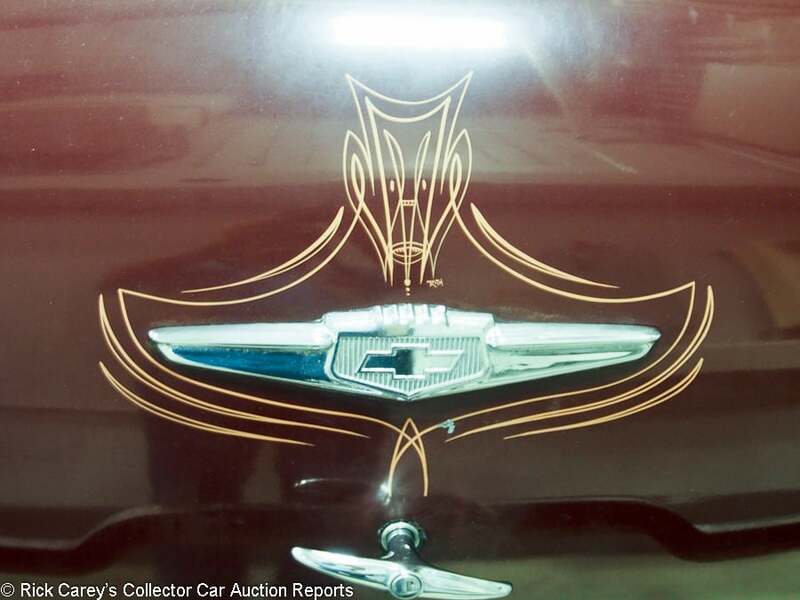 Lot # T143 1950 Pontiac Chieftain 2-Dr. Hardtop Catalina; S/N P8TH58583; Sierra Rust, San Pedro Ivory roof/Rust, Ivory leather; Cosmetic restoration, 3 condition; No Reserve; Hammered Sold at $28,000 plus commission of 10.00%; Final Price $30,800 – 268/108hp, Automatic, pushbutton radio, skirts, wheel covers, wide whitewalls, lighted hood ornament, driving lights, bumper overriders. – Driver’s door is hard to close. Hood is hard to open. Paint, chrome and upholstery are good. Headliner bows and side window frames are badly rust pitted. The underbody is unrestored, dry and dusty. A sound car, but best suited as the basis for restoration. – As the basis for a restoration the price paid here is going to make it impossible to complete without going seriously underwater. Better to address some of its more noticeable shortcomings and use it as a weekend driver and parade car for which it is only 100% over-priced. 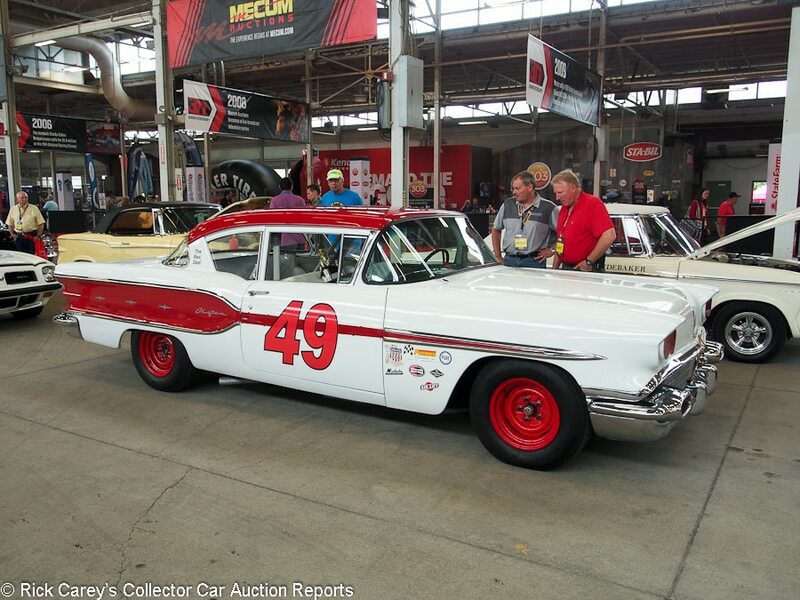 Lot # F215 1958 Pontiac Chieftain USAC Race Car; S/N P758H38632; White, Red roof and accent/Silver vinyl, Grey cloth; Estimate $50,000 – $75,000; Competition restoration, 2 condition; With Reserve; Not sold at Hammer bid of $22,000 – 370/300hp, 3-speed, roll cage, bench seat, SW gauges, Eagle GTII tires. – Most trim removed, gutted interior, bungee cord hood and trunk hold downs. Very good cosmetics inside and out. Documented period Midwest USAC racing history. Restored better than new. – Someone made a serious effort to establish the history of this Pontiac and restored it probably better than it ever was back in the Fifties. The bidders reluctance to offer more than this parsimonious amount for this meticulously restored, rare, Fifties stock car is probably more a lack of understanding among the Indy bidders than it is to the history and quality of the car. 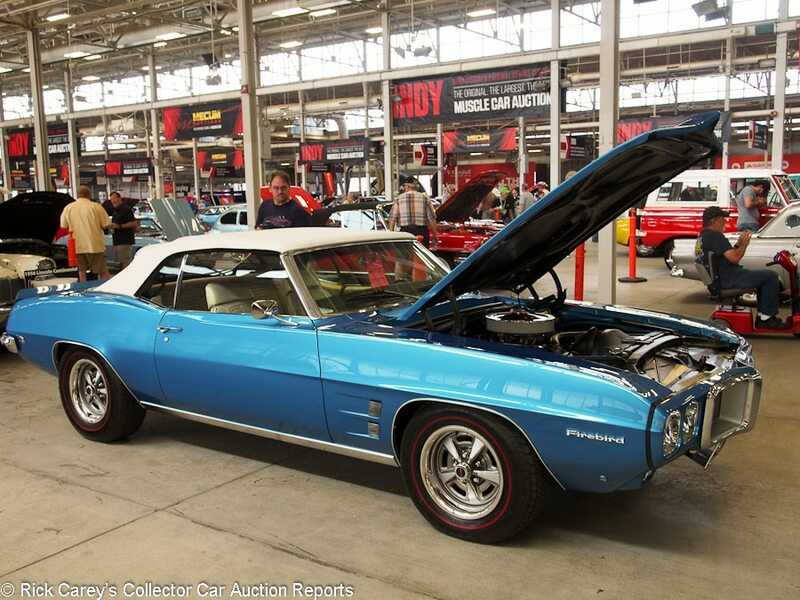 Lot # T090 1969 Pontiac Firebird Convertible; S/N 223679U103064; Engine # WC; Blue/Pearl; White vinyl top; Older restoration, 2 condition; With Reserve; Hammered Sold at $33,000 plus commission of 10.00%; Final Price $36,300 – 350/265hp with a 4-barrel on an Edelbrock intake, 4-speed, power steering and brakes, styled wheels with trim rings, red line tires, hood tach, Hurst shifter, spoiler. – Badged and described as a 400, but it isn’t. Very good paint, chrome, interior and top. The engine compartment, chassis and underbody are like new. – Sold by Barrett-Jackson at Palm Beach in 2010 for $42,350, then in Las Vegas in 2013 where it brought $42,560, this is an attractively restored and maintained car, but it isn’t what it’s represented to be and that is a great disappointment that seems to be better reflected in the price it brought here than in the two earlier B-J results. 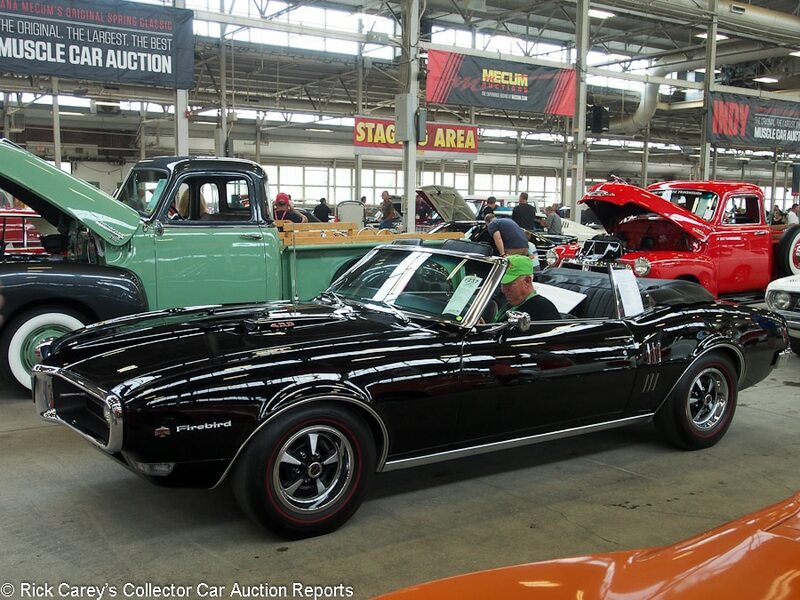 Lot # F237 1968 Pontiac Firebird 400 Convertible; S/N 223678U161306; Black/Black vinyl; Black vinyl top; Estimate $80,000 – $100,000; Older restoration, 2 condition; With Reserve; Hammered Sold at $75,000 plus commission of 10.00%; Final Price $82,500 – 400/330hp, 4-speed, power steering and brakes, factory 8-track, woodgrain steering wheel, console, gauges, pushbutton radio, Super Stock wheels with trim rings, red line tires, handling package, Hurst shifter, no tach. – Two owners, 77,044 miles, represented as the original engine. Documented by PHS, tank sticker, factory order. Shiny paint with a few flaws and blemishes. Good interior and chrome. Underbody has been done, then lightly driven. – It’s not a Trans Am, but the top goes down and that means a lot, as does the known miles, two owners and a quality restoration that is holding up well. That warrants a premium price but it is hard to support this much of a premium and it would have been fully priced $10,000 less. 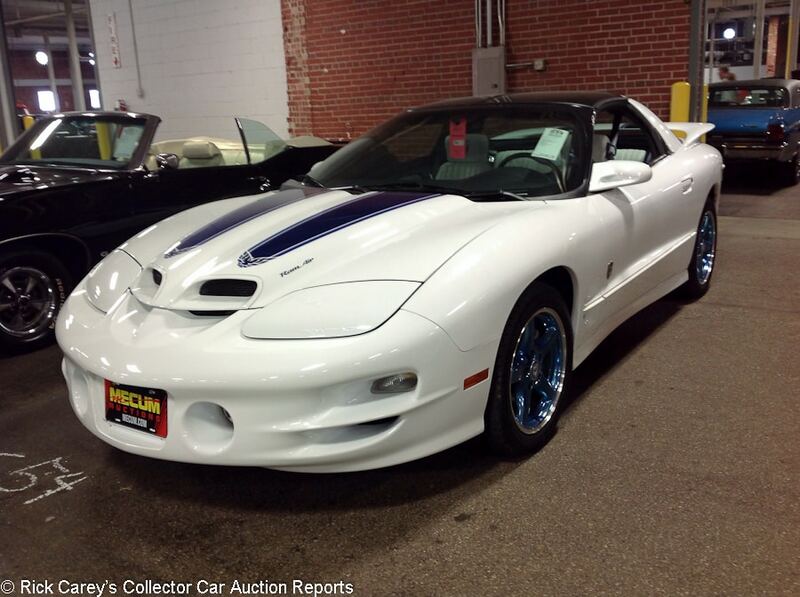 Lot # S054 1999 Pontiac Firebird Trans Am 30th Anniversary Coupe; S/N 2G2FV22G1X2223923; White, Blue stripes/White leather; Unrestored original, 2- condition; With Reserve; Hammered Sold at $28,000 plus commission of 10.00%; Final Price $30,800 – 346/320hp, 6-speed, power windows, power locks, air conditioning, WS6 performance package, window sticker. – Paint looks excellent other than a few little stone chips on the fender wells. Panel fit is excellent. Engine compartment is all original and not nearly as clean as the rest of the car, with a few small signs of surface rust underneath the car as well. Interior is very clean and showing very little to no wear. One owner, showing 2,648 miles and mostly very well kept, but it may have lived outside for a time. – The low miles and shiny paint inspired the bidding on this car, with the wear and dirt underneath apparently ignored. This is big but not crazy money for a 30th Anniversary car with this kind of odometer reading. 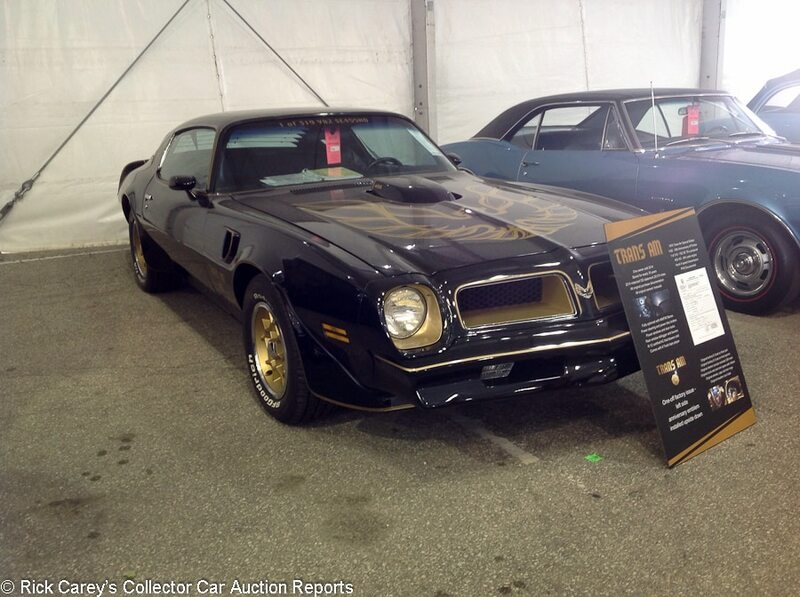 Lot # T223 1976 Pontiac Firebird Trans Am Limited Edition Coupe; S/N 2W87W6N601918; Black, Gold/Black vinyl; Estimate $60,000 – $75,000; Visually maintained, largely original, 2 condition; With Reserve; Not sold at Hammer bid of $52,500 – 455/200hp, Hurst shifted 4-speed, air conditioning, power windows, power locks, 8-track player, snowflake wheels, Radial T/A tires. – 50th Anniversary car. 1 of 319 Y82 Trans Ams without T-tops. Newer paint looks very good. Panel fit is factory. Engine compartment is very clean. Underneath is very clean and undercoated. Original interior looks excellent with some wear showing on the console armrest. Anniversary emblem on the driver’s side is upside down, but it’s said to be from the factory that way. Showing 29,630 miles and original other than a repaint, represented to have the original engine. – Sold at Mecum Indy a year ago for $64,900, then at Kansas City last December for $77,000 and hammered not sold again at Mecum Kissimmee earlier this year at a high bid of $62,000. That Kansas City result isn’t likely to be repeated any time soon. The repeated offers in the sub-70 grand range are much more realistic to this car’s value. The non-T-top feature is rare, but does that offset the loss of open air driving? Apparently someone thought so in KC, but no one has embraced the concept since then. Lot # T089 1963 Pontiac Grand Prix 2-Dr. Hardtop; S/N 963P161115; Cameo Ivory/Turquoise vinyl; Unrestored original, 4+ condition; No Reserve; Hammered Sold at $14,500 plus commission of 10.00%; Final Price $15,950 – 389/313hp Tri-Power, automatic, power steering, power brakes, air conditioning, power windows, power seat, tilt steering column, console-mounted vacuum gauge, 8-lug wheels with trim rings, narrow whitewalls, cruise control. – One old repaint of indifferent quality, now dull with flaws and some rust blisters behind the passenger’s door and roof. Sound interior and chrome. Filthy engine compartment has no evidence of anything but occasional maintenance. The body structure in front of the rear wheels is rusting and needs attention soon. Essentially original and in need of a new home. – The Grand Prix carried the design theme of the Continental Mk II: clean, unembellished but distinctive body lines, a long hood and generous greenhouse that communicated this was a car for a subtle, refined driver. It backed it up with performance, in this case the 313hp Tri-Power 389, and even decent aluminum drum brakes. This example, however, is largely neglected, with a challenged repaint and filthy, neglected chassis and engine. It is a desirable car, but even less desirable than the price it brought. 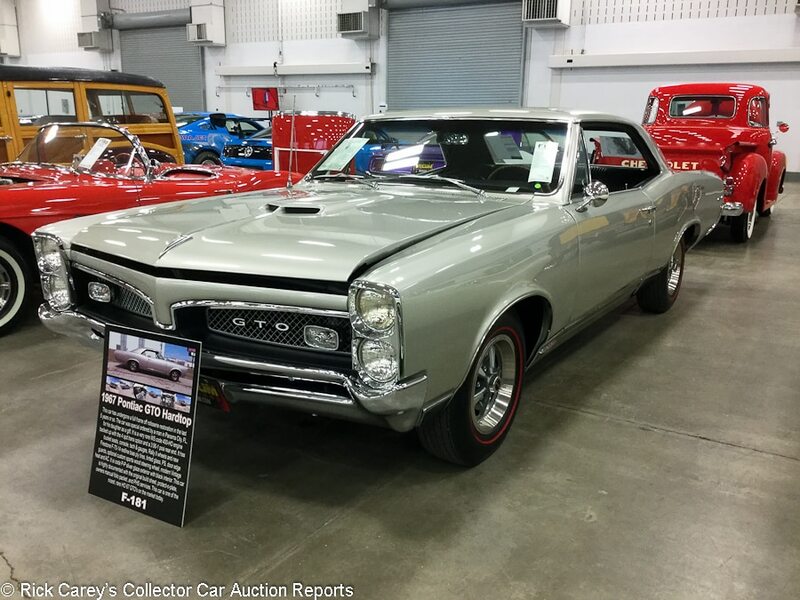 Lot # F181 1967 Pontiac GTO 2-Dr. Hardtop; S/N 242177P289429; Silverglaze/Black vinyl; Estimate $70,000 – $90,000; Recent restoration, 2 condition; With Reserve; Hammered Sold at $57,500 plus commission of 10.00%; Final Price $63,250 – 400/360hp, 4-speed, Protect-O-Plate, power steering, center console, wood steering wheel, PHS documents, Rallye II wheels, red line tires, 3.90 Safe-T-Track, Vintage air conditioning, tinted glass. – Paint is very good. Panel fit is excellent. Engine compartment is very clean other than some discoloration on the intake and heads. Underneath is excellent with no visible wear. Interior looks brand new with the exception of the steering wheel which is showing a little wear. Body-off restored five years ago and still looking fresh, documented with the Protect-o-Plate and original build sheet. – This is a surprisingly modest result for a very well equipped WS-code 360hp 4-speed, documented GTO. The bidders many not have liked the added A/C, but it adds to functionality. On balance the result here is a good value for the new owner. 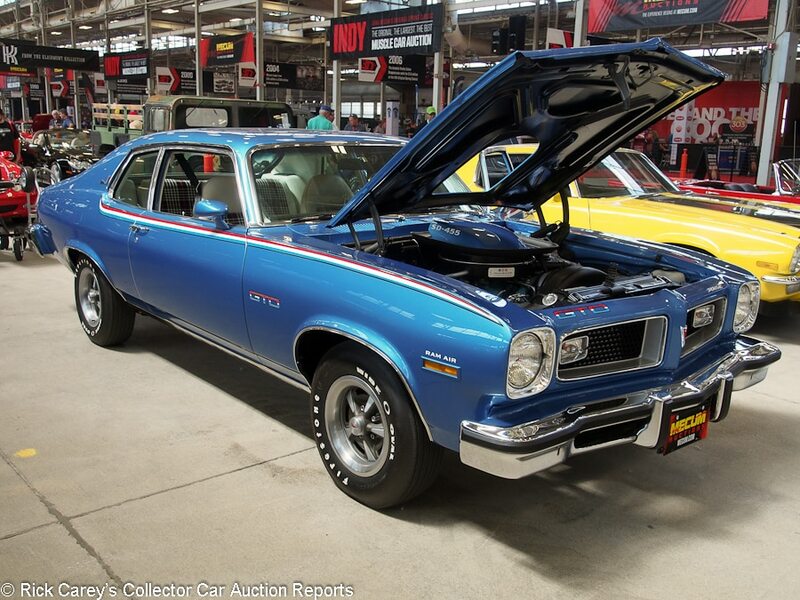 Lot # W124.1 1974 Pontiac GTO 2-Dr. Hatchback; S/N 2Z17B4W131341; Engine # 244211246 YY; Regatta Blue/White vinyl, Black plaid inserts; Modified restoration, 2 condition; With Reserve; Not sold at Hammer bid of $15,000 – 455/250hp, 4-speed, power brakes and steering, Super Sport wheels, console gauges, Hurst shifter, sport steering wheel, shaker hood, – Excellent paint, chrome and interior. Engine compartment is like new, as is the underbody. Represented as 7,749 miles from new. It’s not the original engine, however, which was a 350/185hp. – The GTO’s last gasp (until 2004) in of all things a Ventura hatchback, with performance bolstered during the restoration by installation of a 455/250hp YY engine. It didn’t attract any attention here, after being bid to a reported $48,000 at Kissimmee in January. 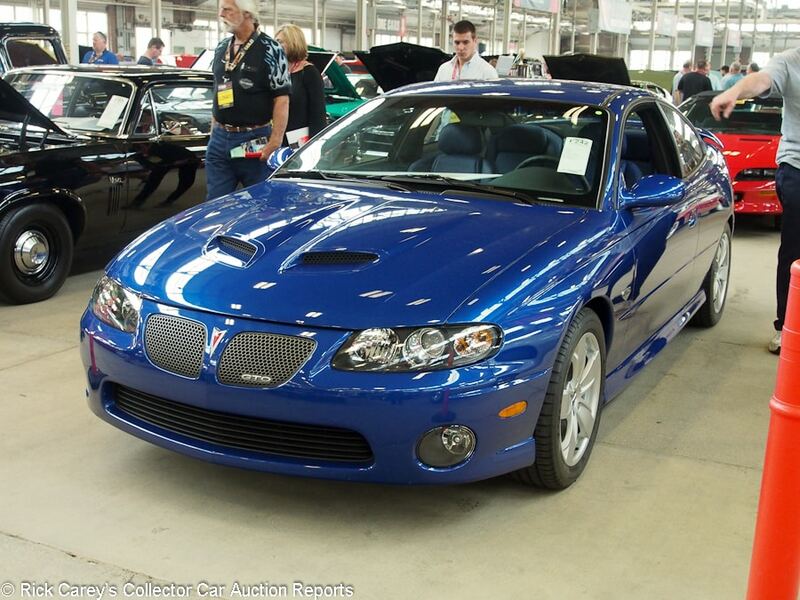 Lot # F242 2005 Pontiac GTO Coupe; S/N 6G2VX12U35L422185; IBM Blue/Blue leather; Unrestored original, 2 condition; With Reserve; Hammered Sold at $29,000 plus commission of 10.00%; Final Price $31,900 – 6-speed. – 1759 miles. The interior still smells fresh. – I’m prejudiced, having just driven to Indiana from Connecticut in a 2005 6-speed GTO. It is one of the best open road driving automobiles I’ve ever experienced and is deliciously powerful. The bidders appreciated the rarity, originality, appearance and performance and paid a generous but fully justified price for this time capsule. Now comes the difficult decision: drive it or preserve it. My vote is for “drive”. 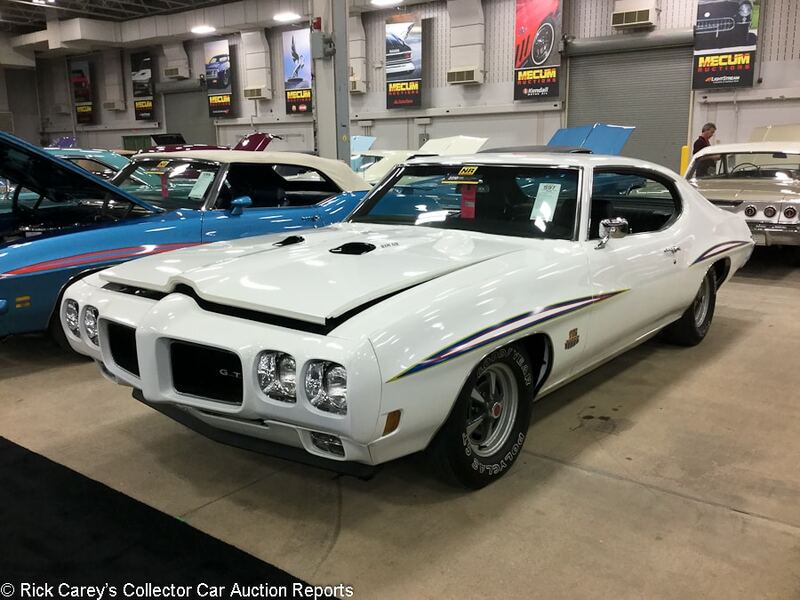 Lot # S097 1970 Pontiac GTO Judge 2-Dr. Hardtop; S/N 242370R145825; White, Judge graphics/Black vinyl; Estimate $45,000 – $60,000; Enthusiast restoration, 3+ condition; No Reserve; Hammered Sold at $43,000 plus commission of 10.00%; Final Price $47,300 – 400/366hp, automatic transmission, power steering, power brakes, rally gauges, hood tachometer, console, formula steering wheel, remote trunk release, PHS documentation. – Paint is decent but has particles in it and the trunk shade is off a little from the rest of the car. There are also some chips and cracks in the front bumper. Panel fit is very good. Brightwork looks good, but there is some slight pitting in the rear bumper. Engine compartment is showing age with a little grime and some discoloration of the intake and heads. Underneath looks good with minimal wear. Interior has slight wear on the driver’s seat, and the carpet does not quite fit near the driver’s door. A genuine GTO Judge, not fully restored but given enough attention to keep it presentable. – Sold here seven years ago for $47,170, this is a handsome, usable Judge that looks like it has had a good life and attention as needed. It won’t win any shows, but it will be a handsome weekend driver. Both the seller and the buyer should be satisfied with this transaction. 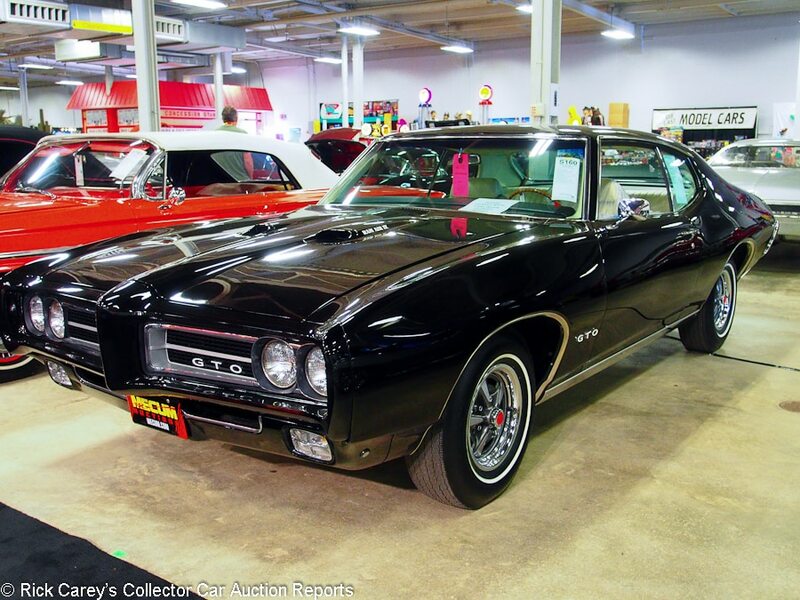 Lot # S160 1969 Pontiac GTO Ram Air IV 2-Dr. Hardtop; S/N 242379B162507; Engine # 0537335 XP; Black/Pearl vinyl; Estimate $110,000 – $125,000; Older restoration, 2 condition; With Reserve; Not sold at Hammer bid of $70,000 – 400/370hp Ram Air IV, automatic, manual steering and brakes, 4.33 Saf-T-Track, pushbutton radio, buckets and console, Rally II wheels, narrow whitewalls. – GM Canada, original window sticker and PHS documented from the collection of PHS founder, Jim Mattison. Represented as the original Ram Air IV engine. Restored like new and really attractive. 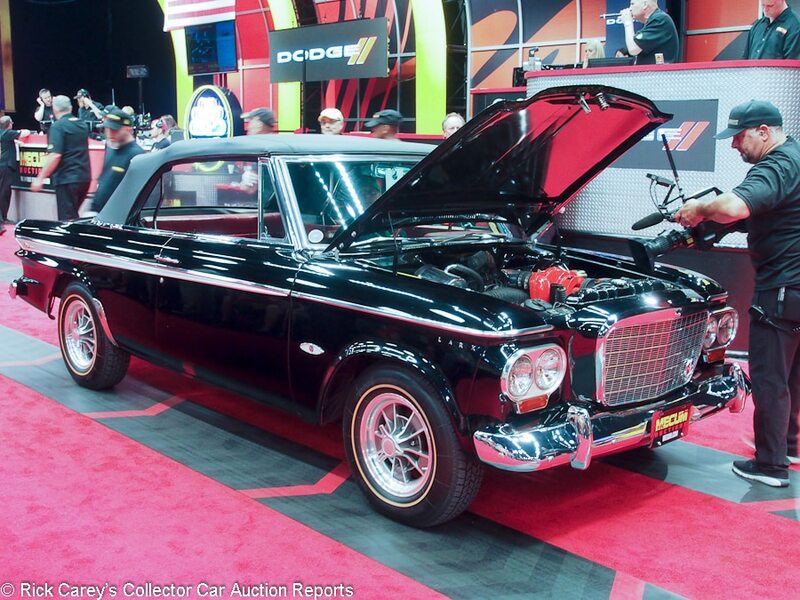 – Sold at Barrett-Jackson’s WestWorld auction earlier this year for $53,900 and while $100,000 for a fairly rare Ram Air IV automatic hardtop may sound reasonable the decision to reject a comfortable profit after five months’ ownership is optimistic at best. 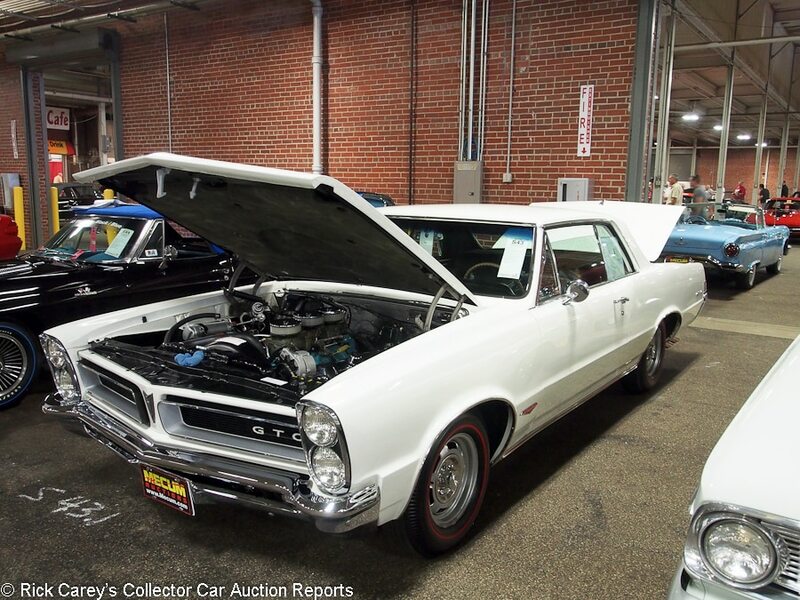 Lot # S043 1965 Pontiac LeMans GTO 2-Dr. Hardtop; S/N 23735P118768; Engine # 075539WT; Cameo Ivory/Black vinyl; Recent restoration, 2 condition; With Reserve; Not sold at Hammer bid of $60,000 – 389/335hp with added Tri-Power, 4-speed, Hurst shifter, air conditioning, power front disc brakes and steering, Rally II wheels with hubcaps, red line tires, factory AM-FM, console mounted Craig 8-track. – Very good recent paint, chrome, interior, glass and stainless. The engine compartment is like new. The underbody is not quite as good, but is more than good enough. PHS documented. – Even with this full load of options and quality restoration the reported high bid on this LeMans GTO should have been enough to see it on its way to a new owner if there was money behind it. 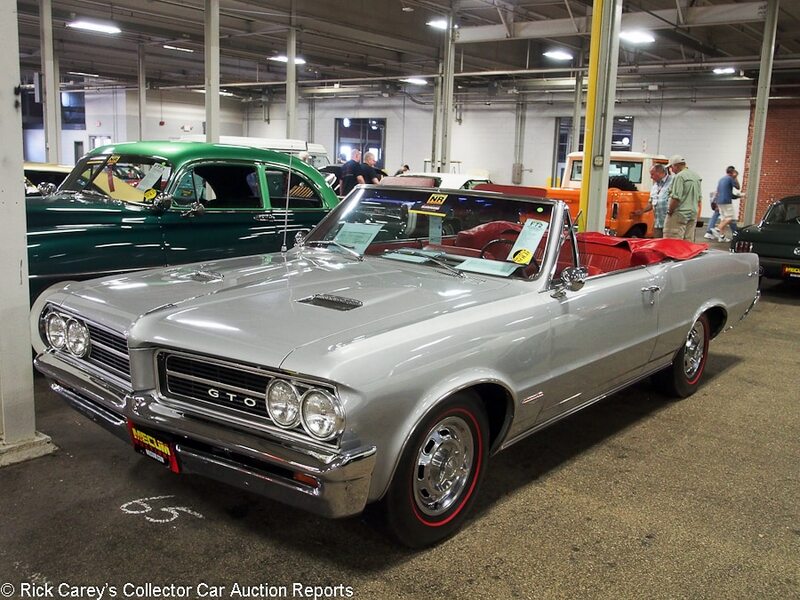 Lot # F072 1964 Pontiac LeMans GTO Convertible; S/N 824P174972; Engine # 789; Silvermist Grey/Medium Red vinyl; Black vinyl top; Cosmetic restoration, 3+ condition; No Reserve; Hammered Sold at $50,000 plus commission of 10.00%; Final Price $55,000 – 389 with Tri-Power added, 4-speed, power steering, spinner wheel covers, red line tires, console, factory tach and gauges, no radio. – Represented as the matching numbers engine, PHS documented. Other than a small chip on the front of the hood the paint is very good, as is the interior, chrome and stainless. The engine compartment has been detailed but not restored. The same applies to the chassis and underbody. Thoughtfully cosmetically restored to highly presentable driver condition. – An orderly, presentable 4-speed GTO convertible with “dealer installed” Tri-Power, this is a car to be owned proudly and at moderate cost. 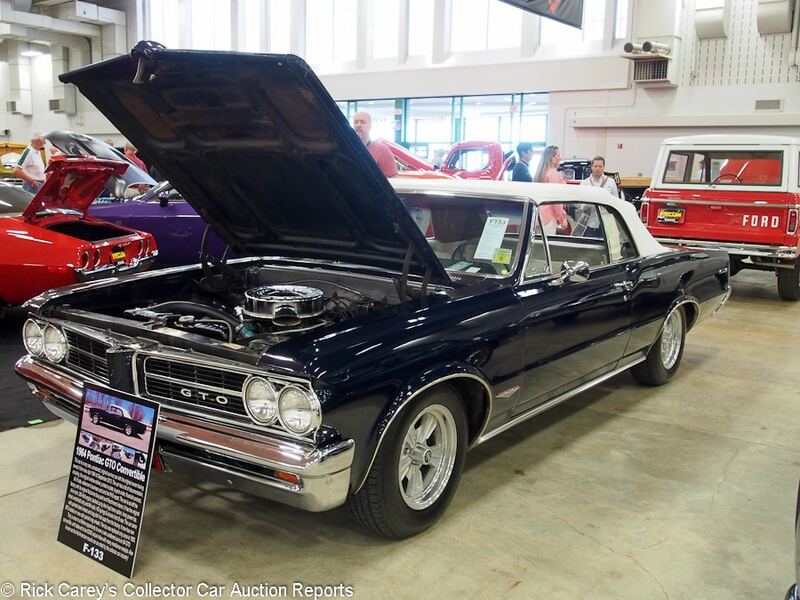 Lot # S061.1 1965 Pontiac LeMans GTO Convertible; S/N 237675P239062; Engine # 388643 YR; Black/Black vinyl; Black vinyl top; Older restoration, 2- condition; With Reserve; Not sold at Hammer bid of $52,000 – 389/360hp Tri-Power, automatic, power brakes and steering, buckets and console, vacuum gauge, pushbutton radio, woodgrain steering wheel, power rear antenna, Rally wheels, hubcaps, trim rings, red line tires. – PHS documented. Very good older paint, interior, top, glass and stainless. The engine compartment was restored like new but age and a few miles have taken their toll. Bare metal parts are dull, carbs have leaked, paint is burned off part of the intake manifold. A sympathetic detailing and touchup will go a long way. – Sold by Russo and Steele in Scottsdale in 2005 for $61,020, then at the same sale in 2008 for $61,600. The consignor may feel justified in getting out of what was put in back then or in the interim, but the LeMans GTO market isn’t doing much even for a correct YR code triple black 389/360 Tri-Power example with an automatic. The bid here is lean, however, as long as the consignor doesn’t need to redeploy the money on something else. 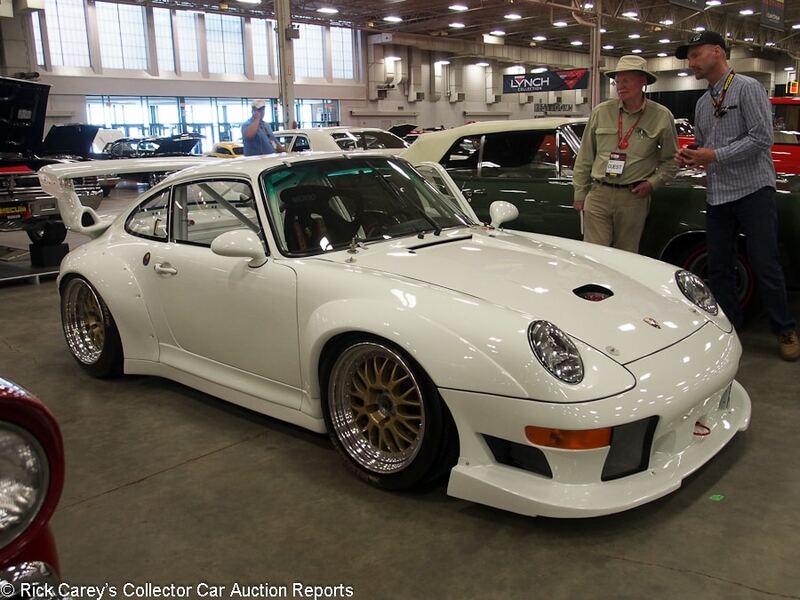 Lot # F192 1996 Porsche 911 GT2 Evo Coupe; S/N WP0ZZZ99ZTS394062; White/Black cloth; Estimate $1,250,000 – $1,750,000; Competition car, original as-raced, 2 condition; With Reserve; Hammered Sold at $1,450,000 plus commission of 10.00%; Final Price $1,595,000 – Fire system, gold center BBS modular wheels, Michelin tires, single Recaro seat, factory rollcage. – 7,953 km and unblemished. No stone chips, no rubber marble scuffs. Nothing except a smattering of outie stars on top of the rear fenders and some Arizona sand caught inside the bodywork. It has Arizona plates; the thought if driving this on the street is scary. Described as one of just 11 built. 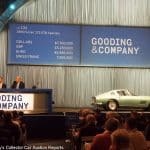 – Offered at Mecum Monterey last August with a reported bid of $1,350,000, then at Dallas last November with a high bid of $950,000, then scored the home run here at Indianapolis, the auction’s top-selling car. 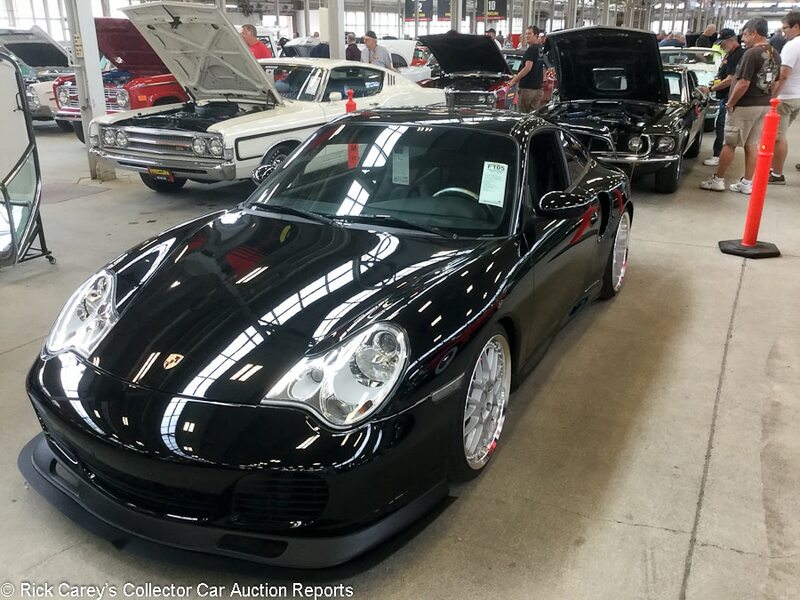 Lot # F105 2003 Porsche 911 Turbo Coupe; S/N WP0AB29903S685928; Black/Black leather; Estimate $100,000 – $125,000; Unrestored original, 2 condition; With Reserve; Not sold at Hammer bid of $87,000 – Factory turbo aero kit, 450 hp twin turbo, 6-speed, dry sump oil system, aluminum look package, heated mirrors. – 6,560 original miles. Paint looks flawless. Engine bay looks clean. Underside looks unused. Interior looks new as well. Seats show some negligible wear. Like new. – Not only is this 996 Turbo in essentially like new condition, it also has just about every desirable option. These cars are still somewhat undervalued, but this one surprised people when it sold for $82,500 at Mecum Kissimmee earlier this year. The similar high bid in Indy was refused for reasons that are unclear other than that the consignor seems overly optimistic about the car’s value. Lot # W249 1984 Porsche 928S Coupe; S/N WP0JB0924ES860160; Gold/Black; Visually maintained, largely original, 3- condition; With Reserve; Not sold at Hammer bid of $8,000 – Factory air conditioning, power windows, automatic transmission, aftermarket CD stereo. – Paint is OK with chipping around the panel edges but no scratching. Rubber is cracking. Engine bay is good other than some corrosion and rust on bolts. Underside shows surface rust. Interior is rough with a peeling dashboard as well as worn, tearing seats and a sagging headliner. Showing 81,842 miles. Represented with 15 grand in recent mechanical work, but this 928 still has plenty of needs. – Hammered not sold at a $13,000 high bid in Mecum Houston six weeks ago. That was all the money in the world a 928 S in this condition can expect to bring. The high bid here wasn’t exactly a strong offer, but it was worth considering. 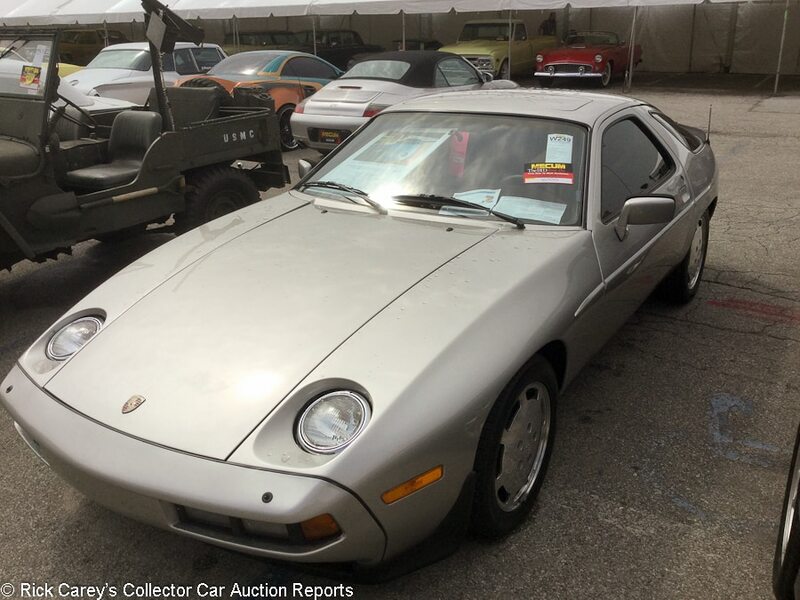 The owner is not going to make back those service costs with additional trips across the auction block and this 928S needs to go away. 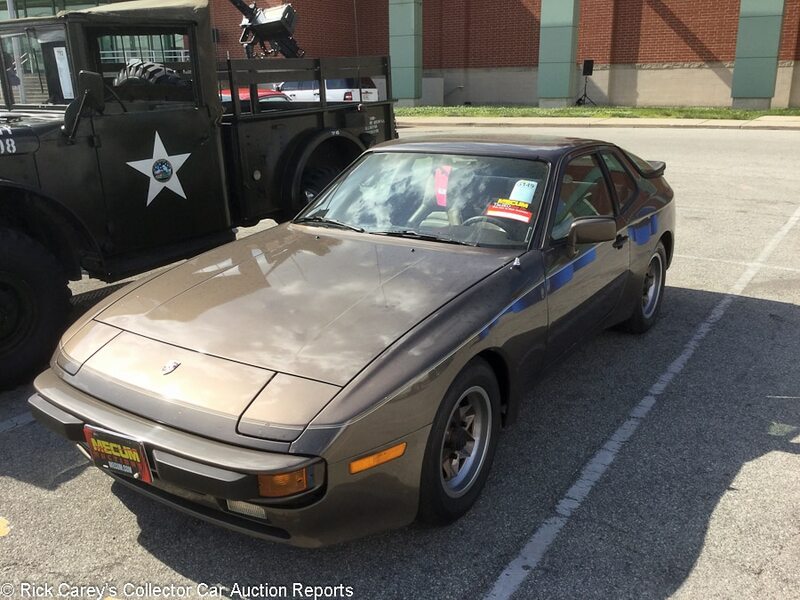 Lot # G149 1984 Porsche 944 Coupe; S/N WP0AA094XEN464625; Brown/Tan; Unrestored original, 4+ condition; With Reserve; Not sold at Hammer bid of $5,500 – Automatic transmission, ATS wheels, air conditioning, power windows. – Significant chips and bubbling on the front bumper and light scratches all over the car. Passenger’s side bumper is coming away from the body due to rust beneath. Passenger’s side mirror has deep scratches. Black metal trim is not seated all the way. Rubber is good. Engine is sprayed with silicone but still dirty and there are frayed wires and cracked tubes. Underside shows light rust. Carpet looks newly replaced as well as the seat upholstery. Upholstery on the door panels and the steering wheel both look rough. Dash is warped but not cracked. Represented as being from a Porsche collection and with service records. In very much used condition. That’s essentially the norm for a 944, but for being at a collector car auction this one is pretty rough. – Pre-1985 Porsche 944s are both ergonomically and mechanically inferior to the newer cars, so they’re typically worth a bit less. This tired example with numerous rust issues doesn’t appeal to Porsche purists, and people who just want a cheap fun driver don’t want a car with an automatic. The target audience for this car is therefore quite small, and it was lucky to get as high of a bid as it did. It should have been loose and selling at $2,500, especially considering the more desirable ’87 model with a manual (Lot W150) that hammered sold at the exact same high bid. Lot # G139 1985 Porsche 944 Coupe; S/N WP0AA0941FN452428; Red/Black vinyl with cloth inserts; Visually maintained, largely original, 2- condition; With Reserve; Hammered Sold at $6,500 plus commission of 10.00%; Final Price $7,150 – Window sticker, service manual, tool kit, black painted Fuchs wheels, power windows, later CD stereo. – Paint is good with only some slight orange peel and moderate rock chips on the front bumper. Engine bay is clean and correct. Only slight discoloration on the aluminum bits. Everything else is great. Underside is not clean but there is no rust. Interior is great. The cloth seats look new. Dash shows no cracks. Very well kept for a base 944, and only a few months ago received the all-important timing belt and water pump replacement. – This is cheap for a 944 these days, especially one so well documented and with the timing belt/water pump so recently done, which is a roughly $1,500 job. There are lots of rough 944s out there for this kind of money, but in Indy it bought a great example. 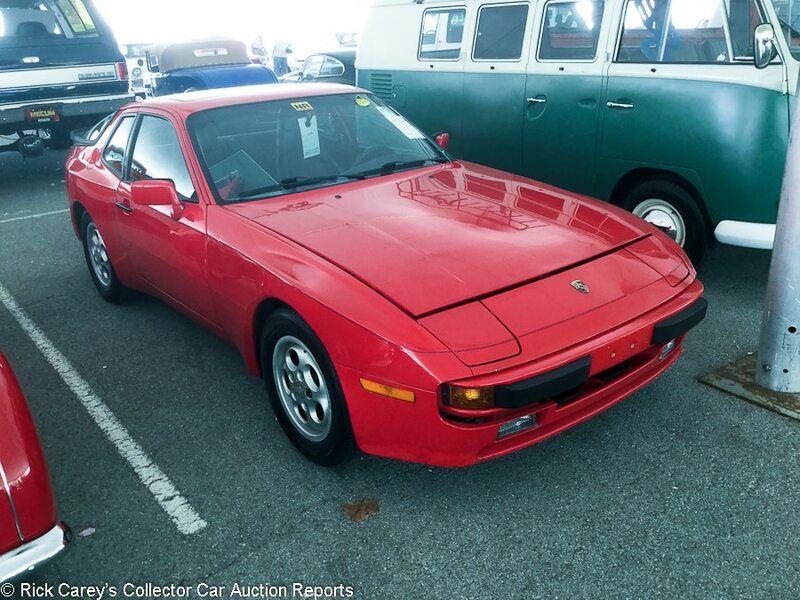 Lot # W150 1987 Porsche 944 Coupe; S/N WP0AB0942HN475068; Red/Black; Unrestored original, 3 condition; No Reserve; Hammered Sold at $5,500 plus commission of 10.00%; Final Price $6,050 – Power windows, air conditioning, spare tire pump, tool kit, Blaupunkt radio, phone dial wheels, power sunroof. – Paint has heavy rock chips on the front bumper and moderately across the rest of car. Gaps are even. Rubber is cracking but still soft and pliable. Engine compartment is complete and correct but a bit dirty. Underside shows no rust. Interior is great, and the carpet is clean and bright. The seats are lightly worn. Dash has only one small crack. Very much used and no representation of service history. – This result is about right for a fairly worn out base 944. The examples that bring big money are the cars that have been carefully preserved and have precious few miles. The majority of 944s out there are just thoroughly used cars like this one, and they still command mid-four-figure prices. 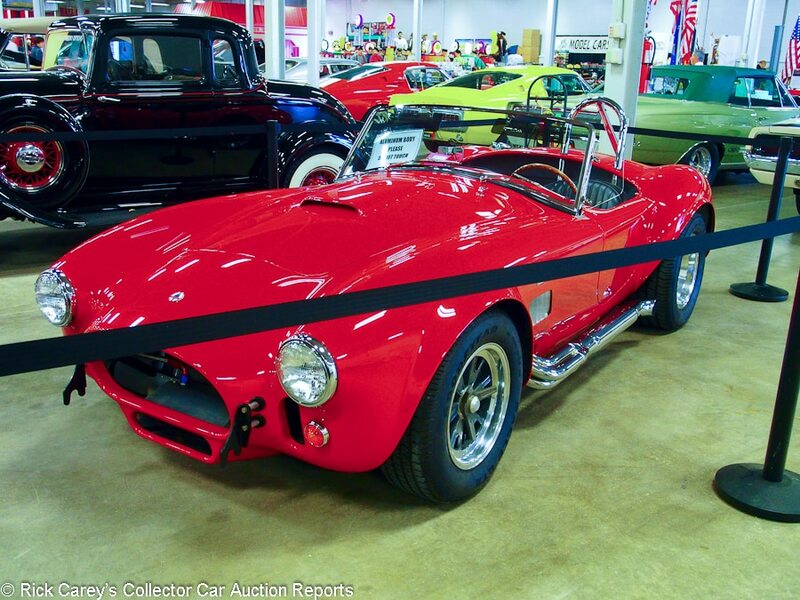 Lot # S112.1 1965 Shelby Cobra CSX4000 Roadster; S/N CSX4218; Red/Black leather; Facsimile restoration, 2+ condition; With Reserve; Not sold at Hammer bid of $150,000 – Aluminum 427, single 4-barrel, toploader 4-speed, aluminum body, aluminum radiator, quick fill fuel cap, Chrome side pipes, paperclip rollbar, Trigo centerlock alloy wheels, Baer brakes, sun visors. – Pristine continuation with show quality paint, chrome and interior. 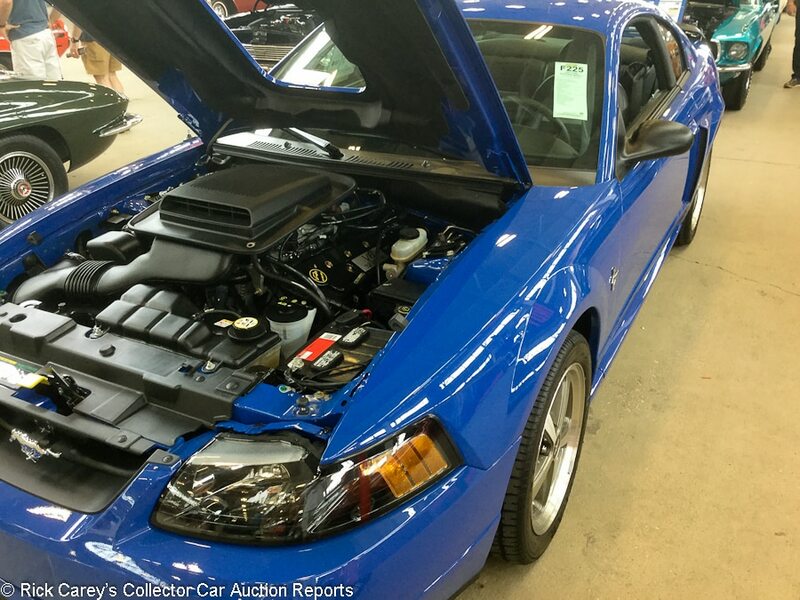 – With replica Cobras commanding prices in medium 5-figures, it seems entirely reasonable for a 1990s Shelby-built Cobra to bring a price in the mid-hundred thousand dollar range, but probably not much if any more than the result reported here. Lot # S084.1 1968 Shelby Mustang GT500KR Fastback; S/N 8T02R215924-04154; Acapulco Blue/Black vinyl; Recent restoration, 1- condition; With Reserve; Not sold at Hammer bid of $130,000 – 428/335hp, 4-speed, power steering, power brakes, Marti Report, original build sheet, window sticker, air conditioning. – Paint looks very good. Panel fit is excellent. Brightwork all looks excellent except for the front driver’s side fender trim, which has a large dent. The engine compartment is spotless and better than new. Underneath is immaculate and again better than new. Interior is excellent and looks brand new. Represented as a concours restoration, and that’s not an exaggeration. It’s show-ready as it sits, except for the dent. – Maybe the bidders were put off by the dent, because this is a meager offer for a 4-speed, air conditioned KR. 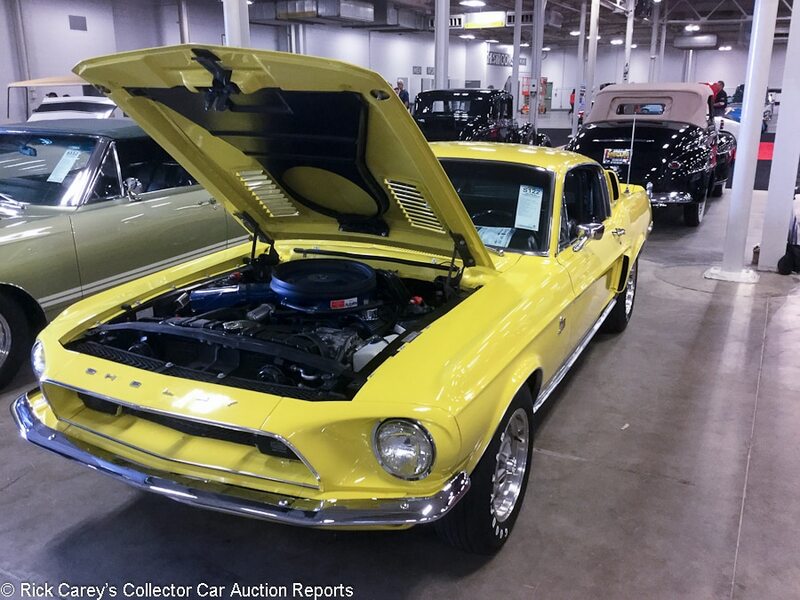 Lot # S122 1968 Shelby Mustang GT500KR Fastback; S/N 8T02R215871-04101; Yellow/Black; Estimate $150,000 – $180,000; Older restoration, 2 condition; With Reserve; Not sold at Hammer bid of $100,000 – 428335hp Cobra Jet engine, automatic, power steering, power brakes, factory air conditioning, tilt steering column, 10-spoke alloy wheels. – Paint looks fresh and bright. There are two slight stress cracks on the front grille panel but otherwise it’s perfect. Gaps are even. Brightwork shows light swirls. Engine looks brand new. Hoses and wires are clean and very organized. Underside is clean and rust free. Interior is nearly perfect, some dirt has settled in the cracks of the seat and the wood on the steering wheel looks slightly faded. Very well restored at some point, although the details of the work aren’t provided. – Marti Report documented, but not represented as the original engine, the Saturday bidders may have been suffering from a bit of GT500 fatigue when this Yellow KR crossed the block which may account for its unacceptably moderate price. 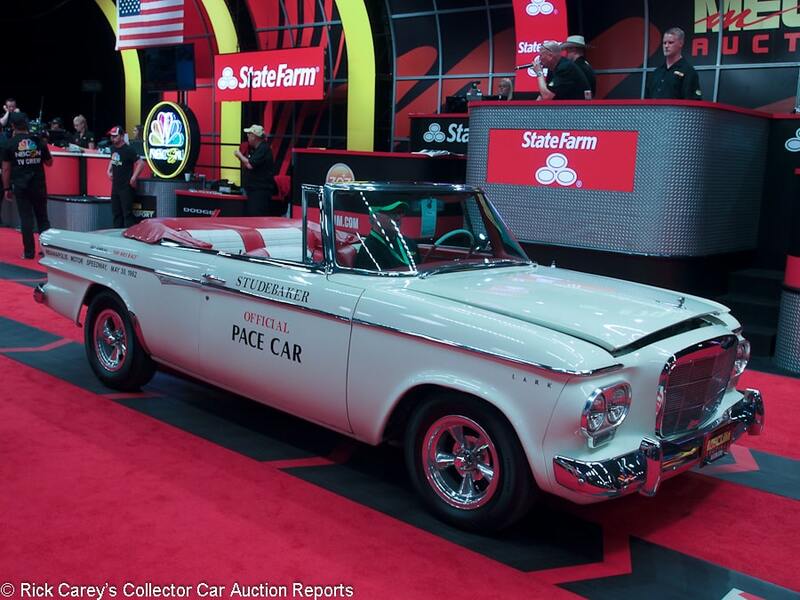 Lot # F196 1962 Studebaker Lark Daytona Convertible Pace Car Edition; S/N 62V36967; White/Red, White vinyl; White vinyl top; Estimate $45,000 – $60,000; Unrestored original, 3+ condition; With Reserve; Hammered Sold at $30,000 plus commission of 10.00%; Final Price $33,000 – 289 V8, 3 two-barrel Smoljam intake, progressive linkage, Mallory distributor, 4-speed, dual exhaust, bucket seats, pushbutton radio, polished Torque Thrust wheels, Nexen blackwall radial tires. – Sound original paint, chrome and top. Good replaced interior. Shows age everywhere, but is well preserved to the point where the 12,019 miles on the odometer could well be all it has covered from new. The performance potential of this setup should be startling and the survival of this car in such good and original condition is commendable. – Apparently set up with performance parts to perform up to the requirements required by the Indy 500 Pace Car duties, this Lark Daytona has many intriguing attributes and is a real conversation piece for which a deftly balanced price was paid, weighing condition, equipment and history. Lot # F197 1960 Studebaker Lark VIII Convertible; S/N 60V21829; Yellow/Black vinyl; Black vinyl top; Estimate $50,000 – $60,000; Cosmetic restoration, 3 condition; With Reserve; Hammered Sold at $40,000 plus commission of 10.00%; Final Price $44,000 – 259/180hp V8, column shift overdrive 3-speed, heater, no radio, fender mirror, wheel covers, wide whitewalls. – Pink house insulation under the hood and falling apart. Decent older engine compartment. Old undercoat in the wheelwells. Sound older upholstery and top. Decent paint and chrome except for pitted windowsill trim. Rare, and a presentable driver. – It is surprising that this Lark VIII brought significantly more than the Pace Car that sold just before it and it’s not clear that this car’s originality is sufficient to maintain the difference. Maybe it was on account of being the last of the three Larks crossing the block in succession. The Indy bidders paid dearly for this Lark. Lot # F195 1963 Studebaker Super Lark Daytona Convertible; S/N 63V8546; Black/Black vinyl; Black vinyl top; Estimate $90,000 – $100,000; Unrestored original, 3+ condition; With Reserve; Hammered Sold at $67,500 plus commission of 10.00%; Final Price $74,250 – 289/289hp R2 Avanti supercharged solid lifter engine, automatic, buckets and console, pushbutton AM-FM, dual exhaust, power front disc brakes, power steering, Halibrand 5-spoke alloy wheels with phony 3-lobe spinners. – Good original paint, chrome, interior and top. The supercharger has an Erb Products sticker showing a rebuilt and it and the carb are more fresh than the rest of the engine. The underbody hasn’t been touched and the 4,769 miles on the odometer may be real. – To say this Super Lark Daytona is rare is an understatement. It was the first of three Lark convertibles offered in succession and brought a price with the resident Studebaker expert said beforehand was right on the money. It is a remarkable piece. 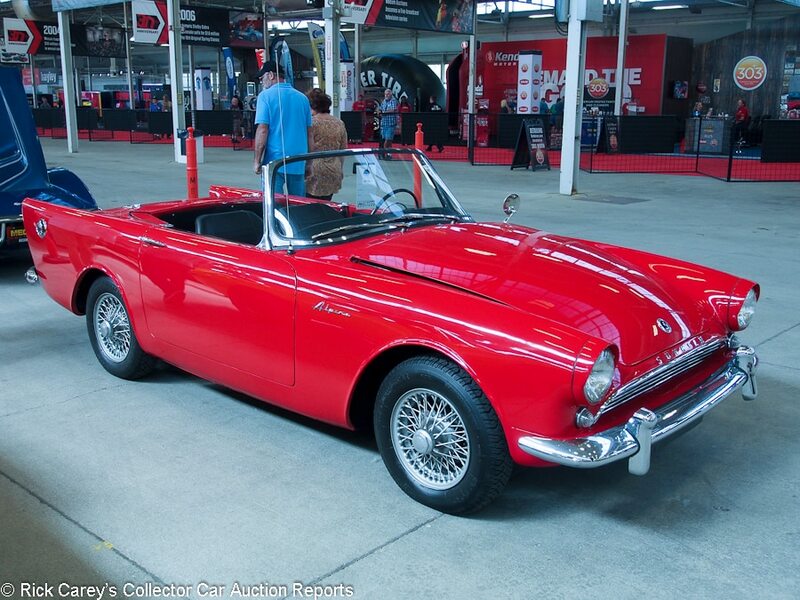 Lot # W102.1 1962 Sunbeam Alpine Convertible; S/N B9103978; Red/Black vinyl; Visually maintained, largely original, 3- condition; With Reserve; Hammered Sold at $15,000 plus commission of 10.00%; Final Price $16,500 – Silver painted wire wheels, store brand radial blackwall tires, no radio. – Sound repaint with a touched up chip in the middle of the hood. Fair chrome, some flaky chrome on cast trim. Lumpy recovered seats. Engine compartment and underbody have gotten a superficial squirt of chassis black over whatever was there. No appreciable body filler. – Rerun as T293 and reported sold at $14,000, which makes little enough sense having recorded this result on Wednesday. Either way this is a realistic price for a sound but aged cosmetically maintained car with lumpy seats. Lot # T163 1966 Sunbeam Tiger Mk IA Roadster; S/N B382001370; Pippen Red/Black vinyl; Black leatherette top; Estimate $60,000 – $75,000; Cosmetic restoration, 3+ condition; With Reserve; Hammered Sold at $50,000 plus commission of 10.00%; Final Price $55,000 – 260/164hp with Edelbrock intake and Holley 4-barrel carb, aluminum valve covers, 13-inch polished LAT alloy wheels with spinner center caps, Sumitomo blackwalls. – Sound older paint, chrome, interior and top. The engine compartment has been done, but a while ago with some age and a few miles. The underbody is orderly, clean and original. Happily usable as is and a rewarding driver. – Sold at Auburn Fall in 2012 for $37,000, the next spring at Auburn it brought $35,200 then scored a home run at B-J in 2014 when it sold for $66,000. It came close at Kissimmee this year selling for $60,500 and its result here represents a good value for the new owner but a disappointment for the seller. 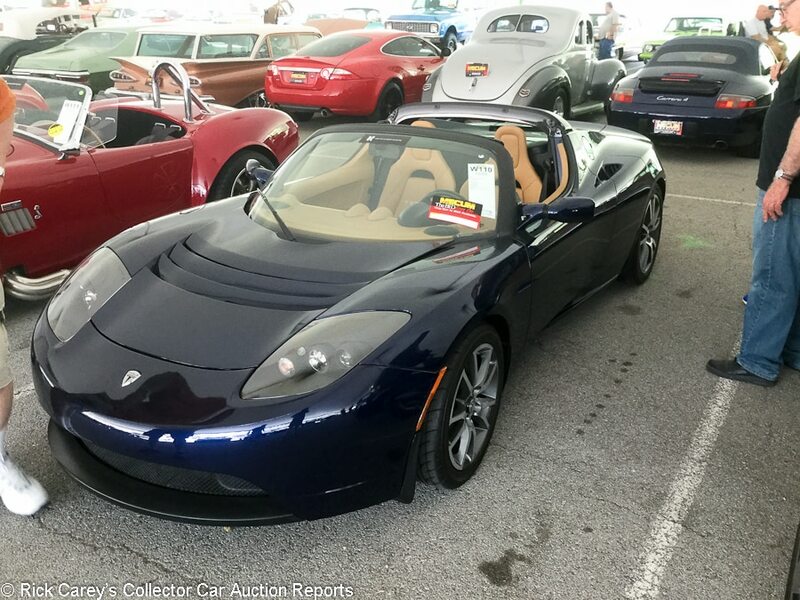 Lot # W110 2010 Tesla Roadster Convertible; S/N 5YJRE1A10A1000960; Blue/Tan leather; Black top; Unrestored original, 2- condition; With Reserve; Not sold at Hammer bid of $59,000 – Carbon fiber trim, 3.0 upgraded battery, all cables needed to charge the car. – Fitted with the 3.0 battery upgrade that stores 40% more charge and allows for a 340-mile range. Paint looks to be in perfect condition. Rubber is fresh and pliable. Spotless underneath. The tan interior would be perfect if it weren’t covered with black splotches from shoes and dirty hands, although those would likely clean up with a good detailing. Represented as having just 5,304 miles from new and looking like a new car. – A quick scan of the classifieds will show you that the reported high bid isn’t far off from the normal price for used Tesla roadsters. Otherwise, it’s a little hard to call, but the market for second-hand electrics is going to get more interesting as the longevity and the cost of maintenance of older batteries becomes clearer. 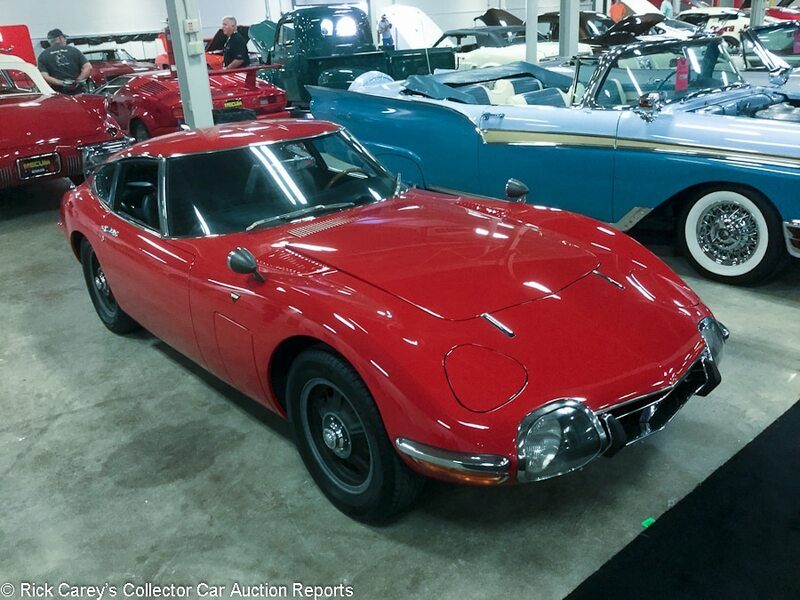 Lot # S202 1967 Toyota 2000GT Coupe; S/N MF1010100; Red, /; Estimate $750,000 – $900,000; Older restoration, 2 condition; With Reserve; Hammered Sold at $750,000 plus commission of 10.00%; Final Price $825,000 – Centerlock wheels, fender mirrors, dash clock, power windows, woodrim steering wheel, wood shift knob, factory AM/FM radio, three Spanish built Weber 40DCOE151 carbs, Yamaha number 1090. – Lefthand drive U.S. market car, one of 62 built. Used but very clean engine bay. Very good paint other than a small blister on the tail. Straight body, even gaps. Very good interior. Not overdone. Sympathetically restored and just right. A rare US market left-hand drive car from new, one of 62 examples equipped for sale here. Owned by racer Otto Linton and subsequently in several private collections. Cosmetic restoration on a sound example done in 2007. – Sold at Mecum Monterey in 2015 for $1,017,500, then hammered not sold at Mecum Monterey the next year at a $700,000 high bid and hammered not sold once more in Kissimmee earlier this year at a $725,000 high bid. The seven-figure Toyota was a short-lived trend in 2015 after this example and a few others broke the million-dollar mark. After supply caught up to demand, prices settled in the high six figures. The seller’s expectations caught up with the times in Indy and he let it go at a realistic price. 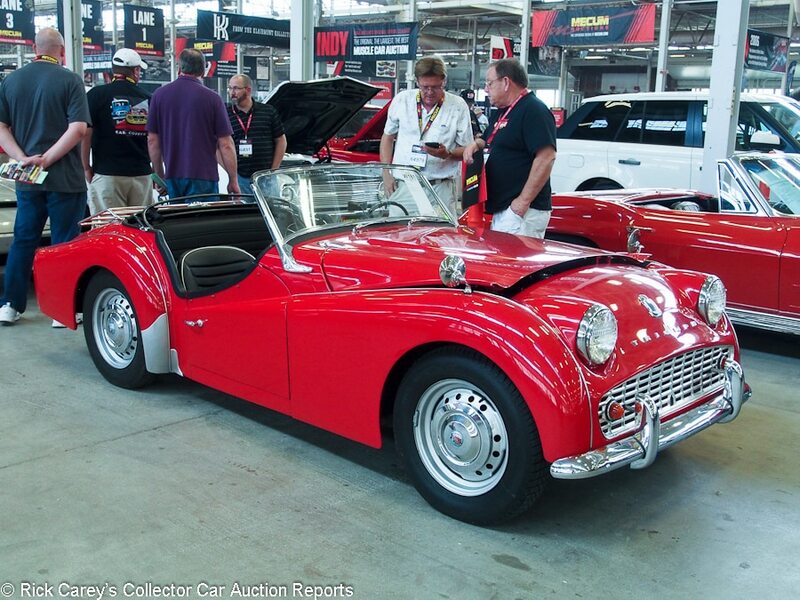 Lot # W181 1958 Triumph TR3A Roadster; S/N TS25523L; Red/Black vinyl, White piping; Black vinyl top; Visually maintained, largely original, 3- condition; With Reserve; Hammered Sold at $24,500 plus commission of 10.00%; Final Price $26,950 – Luggage rack, fender mirrors, Silver steel wheels, hubcaps, Nova tires, overdrive. – Chipped, orange peely repaint, good chrome and interior. Crisp gauges and dash controls. Orderly, aged, dusty engine compartment with new hydraulic cylinders. The underbody is dry and original. Top is fairly new. A presentable and largely original driver. – This result is a little generous for this TR3A’s condition, but not enough to censure the buyer for poor judgment.